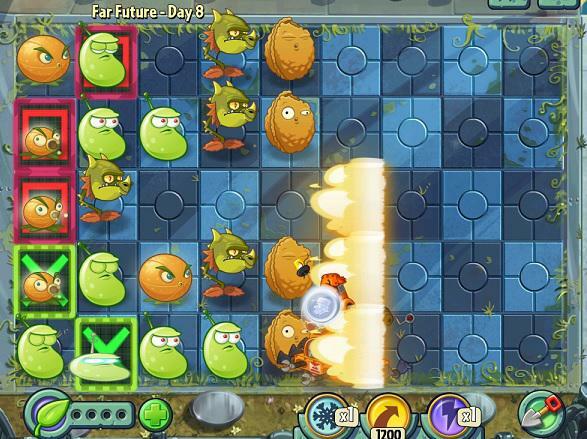 To win at Popcap's popular free-to-play tower defense game for iOS and Android Plants vs Zombies 2 you need to use your braaaaaaaains, but even the wiliest gardener might find themselves between a rock and a hard place with so many levels. Want to bury the zombie horde without spending a cent of real money? We're here to help you with our strategy guide, provided by Stan, that will give you tips and tricks to get through each level! 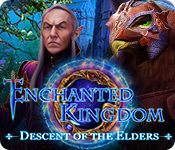 Hit on below for our best strategies, or share your own with other players in the comments! Actual solutions will be hidden by spoilers. Start off with 2 Sunflowers on the back. Next, plant a Peashooter on the lane where the first zombie has appeared. Two more Sunflowers, followed by another Peashooter. 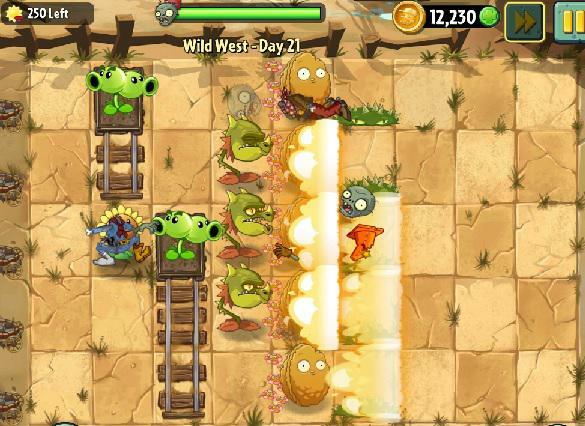 Your goal is to get 5 Sunflowers and 10 Peashooters (2 on each lane). Wall-nuts and Potato Mines are optional. Start off with 2 - 3 Sunflowers. 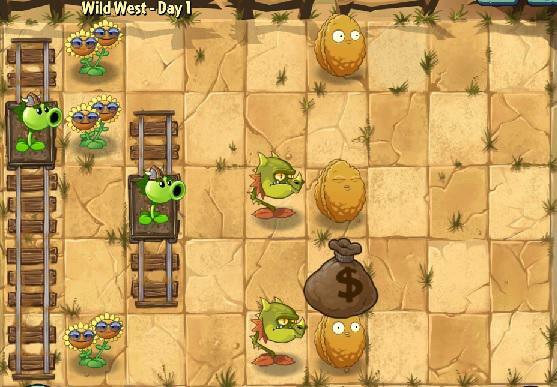 Plant a Peashooter wherever the first zombie has appeared. If a zombie isn't coming from a different lane, you have time to plant some more Sunflower. 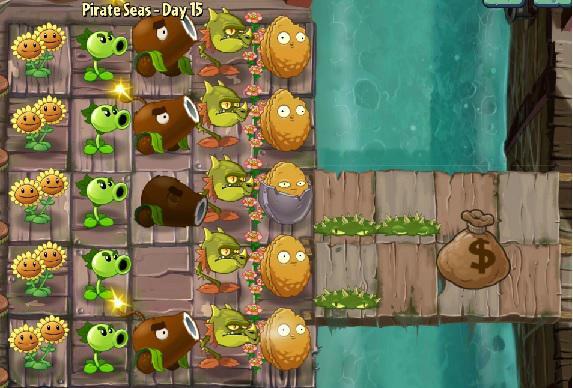 Do this until you have 5 Sunflowers. 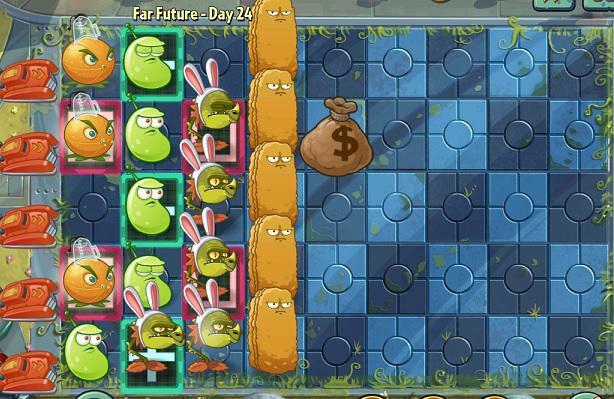 If you see a Conehead Zombie, either plant a Wall-nut to stop it or put a second Peashooter on the lane. If a Buckethead Zombie is approaching, a Wall-nut is essential. If you don't wish to have your Wall-nuts damaged too quickly, you might want to add a 3rd Peashooter on the lane as shown below. 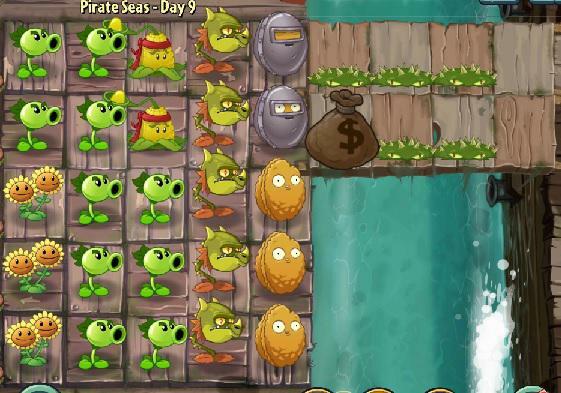 Start off with 2-3 Sunflowers followed by a Peashooter. 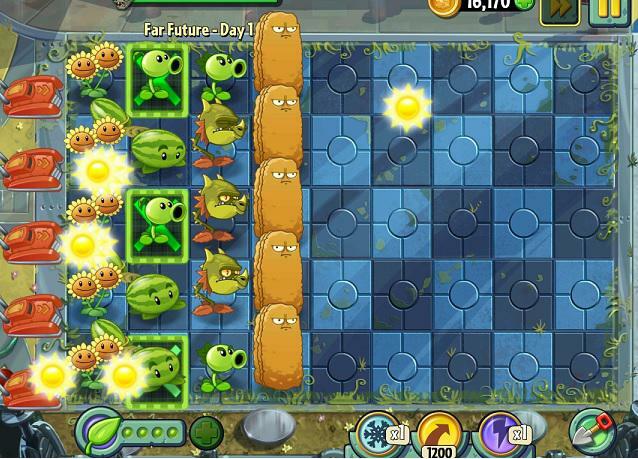 As soon as you have 4 or 5 Sunflowers, start planting Wall-nuts every time they're off cooldown. You should have a full line of Wall-nuts ready for the last wave. Have a Cabbage-pult on each lane with Tombstones. 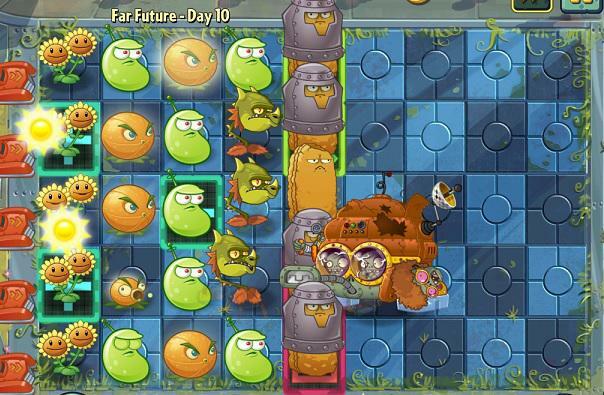 Use plant food on Wall-nuts that are about to break or on Peashooters when there are too many zombies on the lane. Put your first plant when you see where the first zombie is coming from. If you don't see a zombie coming on an empty lane, don't plant until you have at least 5 attacking Plants. Bloomerangs should be planted on the 2nd and 3rd line. The further they are, the faster they will attack. The only plant you should have on line 4 is the Wall-nut. During Sandstorms, the zombies can reach it, ignoring everything in their way. Potato Mines are your life savers. Always have a couple of them stashed. If things get rough, plant one and use plant food on it, to make it explode immediately and multiply. Simply use whatever power-up you want. Start off with 3-4 Sunflowers. The first attacking plant you use should be a Peashooter. If there are too many tombstones on the lane, put down a Cabbage-pult. Wall-nuts should be put on the 5th line. Have at least one Bloomerang on each lane. Iceberg Lettuces are best used on crowded lanes or lanes with no Wall-nuts. Prioritize the zombies in front. Be patient. If 1 plant is enough to kill off the incoming Zombie, don't plant anymore on the same lane. Plant Wall-nuts on the 5th line. Until you have at least 3 plants on each lane, have a couple stashed to use in rough times. Bloomerangs should be planted right behind the Wall-nuts. 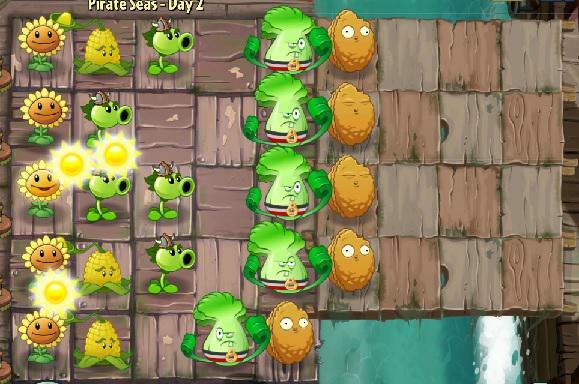 Use plant food on Potato Mines when there are too many zombies on multiple lanes. Use plant food on Bloomerangs only when there are hordes of zombies in front of the plant. Don't use Wall-nuts to stop Gargantaurs (the exceptionally huge zombie). They will simply smash through any plant. The best weapon against Gargantaurs is the Iceberg Lettuce. It gives a lot of time to other plants to deal good damage. Try to have a couple stashed for when a Gargantaurs shows up. Start off with 2-3 Sunflowers. Start planting Peashooters on the lanes where the first zombies appear. 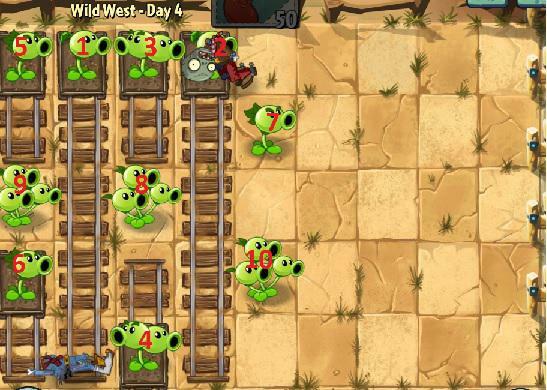 As soon as you have 5 Sunflowers and 3-4 Peashooters, start planting Wall-nuts on the 5th line. 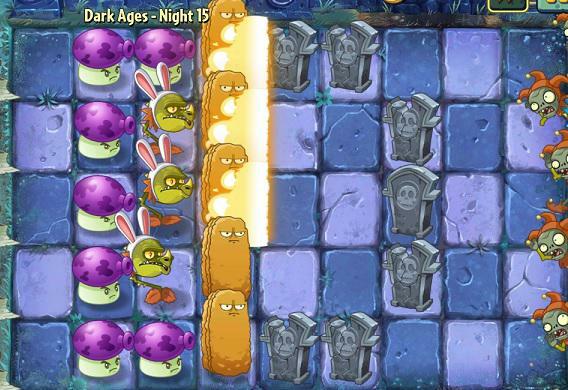 If a there is a tombstone too close to your plants, use a Bloomerang instead of Peashooters for the first wave of zombies. Bloomerangs should be put as close to the Wall-nuts as possible. Use Potato Bombs in front of the Wall-nuts. Iceberg Lettuces should only be used on Explorer Zombies. It is the only way to slow them down as they simply burn through any plant in their way (regardless of health points). Once the field behind the Wall-nuts is full, start replacing Peashooters with Bloomerangs. Keep a Peashooter on the back line. 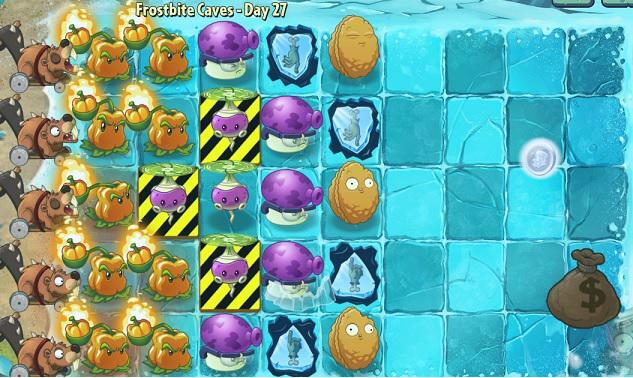 Leave the Iceberg Lettuces out for this level and take Grave Busters instead. Explorer Zombies won't be showing up but grave stones will reappear on each wave. Start off with 2-3 Sunflowers. Start planting Peashooters on the lanes where the first zombies appear. 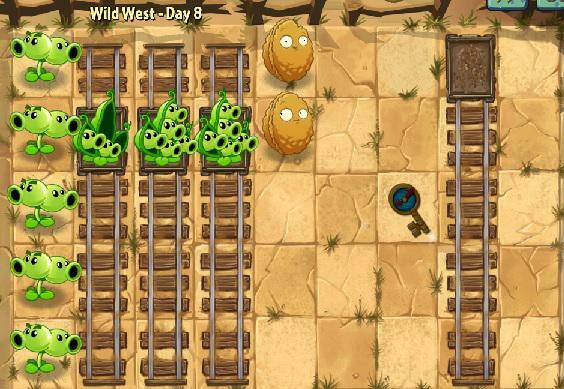 As soon as you have 5 Sunflowers and 3-4 Peashooters, start planting Wall-nuts on the 5th line. Use Grave Busters as soon as they are off cooldown. Focus on the front grave stones first. Use Potato Bombs in front of the Wall-nuts. Once the field behind the Wall-nuts is full, start replacing Peashooters with Bloomerangs. Keep a Peashooter on the back line. 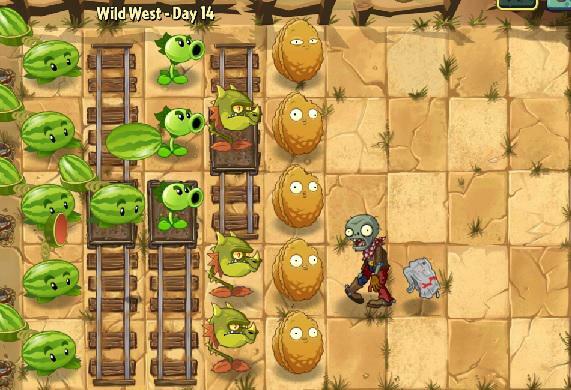 Plant food should be mainly used on damaged Wall-nuts and Peashooters when a lane is crowded with zombies. Start off with 1 Twin Sunflower. 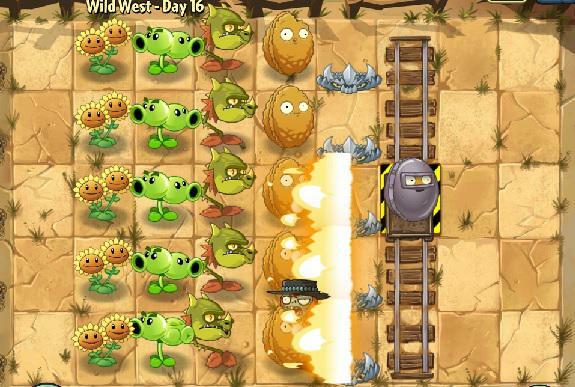 Plant an attacking flower where the first zombie is and save up for another Twin Sunflower. Plant 1 or 2 more Peashooters and plant your third Twin Sunflower. Don't plant more Sunflowers, you'll need the space. As soon as you have 4-5 Peashooters, start planting Wall-nuts on the 6th line. Occupy the 2 front lines behind your Wall-nuts with Bloomerangs, so that they will attack faster. Use Potato Mines in front of the Wall-nuts. Prioritize the 3 lanes where your sun flowers are. Use Plant food mainly on damaged Wall-nuts or to blow up Potato Mines. 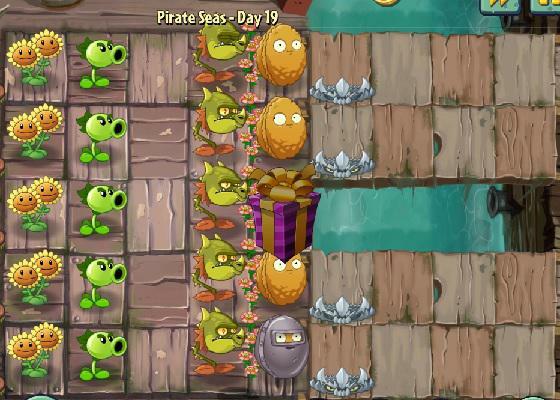 Start off with 2-3 Sunflowers and a Peashooter on for the first zombie. Use the Grave Buster whenever it's off cooldown until you've cleaned the field from Gravestones. Plant the Wall-nuts on the 6th line . Use ONLY Peashooters. Once you don't have any more space to plant, gather about 1000 sun and replace your Sunflowers with Peashooters. Plant Potato Mines in front of your Wall-nuts. Use plant food on Wall-nuts which are about to be eaten. It's OK if you lose a Mower. Start off with 2-3 Sunflowers. 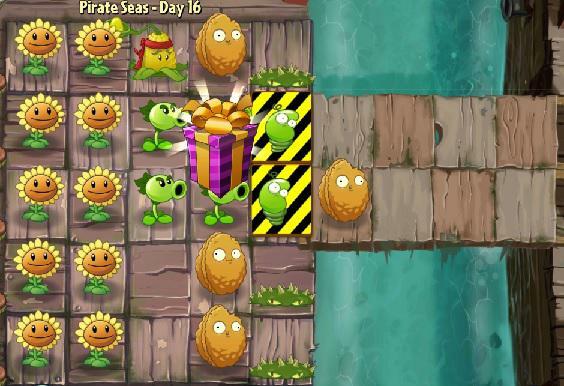 Once you've planted your first Peashooter, keep planting Sunflowers until you have 5. As soon as you see a Conehead or a Buckethead Zombie, start planting the Wall-nuts on the 3rd line to the left. 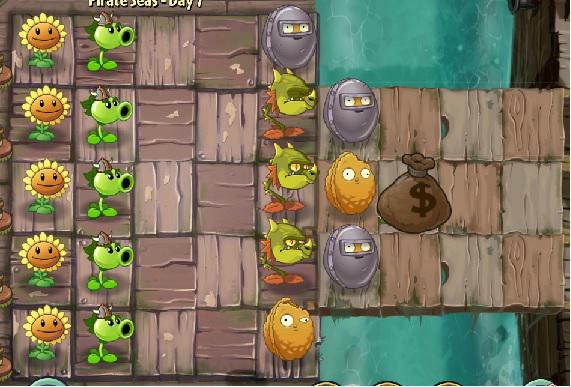 Once you have a Peashooter start putting Bloomerangs right behind the Wall-nuts. At the end of the level you should have 2 lines of Peashooters and 1 line of Bloomerangs. Use plant food to strengthen your Wall-nuts if you can't afford to lose one. Use plant food on Peashooters if you're facing a tough enemy. Use plant food on Bloomerangs if the lane is crowded with too many zombies. Start off with 2-3 Sunflowers. Use the Grave Buster as soon as it goes off cooldown. Get rid of the grave stones that are closest to your plants first. 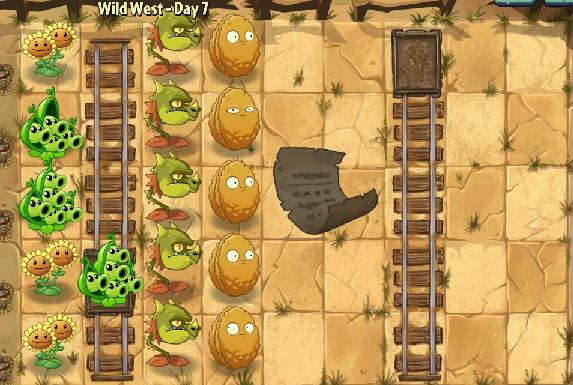 Get a total of 5 Sunflowers after you've put down your first Peashooter. Plant Bonk Choy plants on the 5th line whenever you have the sun for one. The first Wall-nuts should be planted on the 6th line, on lanes where you don't have a Bong Choy yet. Once you have a full line of Bong Choys, start planting more Peashooters behind them. Plant Wall-nuts as soon as they are off cooldown until you have one on each lane. 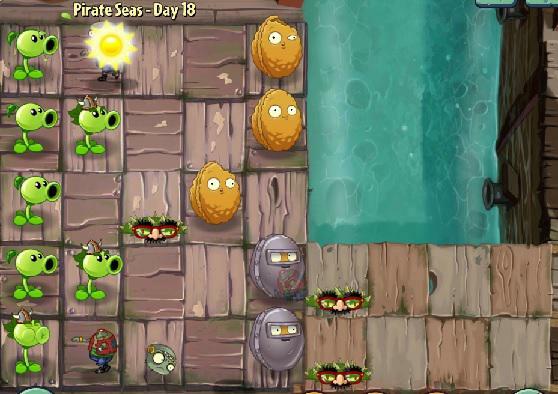 Once all the tiles behind the Wall-nuts are occupied with plants, gather 1000 sun and remove the Sunflowers. Replace them with more Peashooters. Use plant food on heavily damaged Wall-nuts. 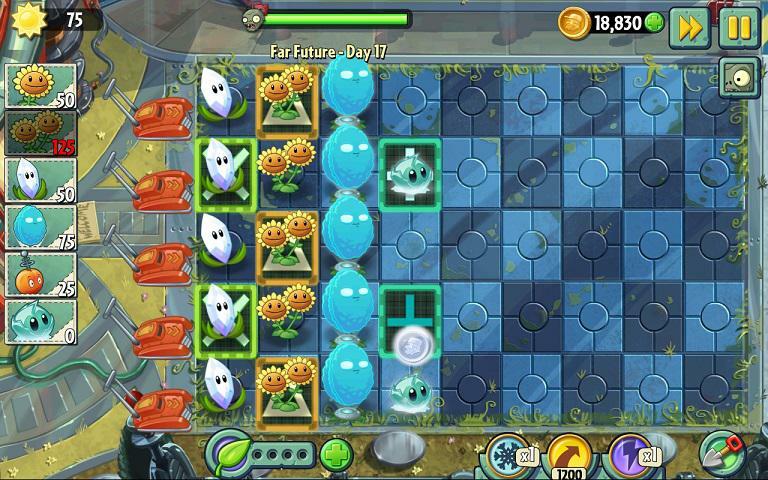 Start off with 2-3 Sunflowers (3 is the max you'll need for this level). Plant them on the lanes where there are no endangered Sunflowers. Use the Grave Buster to get rid of grave stones on the 6th and 7th line. Start planting Bong Choy plants in front of the endangered Sunflowers. On the lanes with no sunflowers to protect, the Bong Choys should go next to the Sunflowers. Plant the Wall-nuts in front of the Bong Choys. Until you have a Wall-nut on each lane, save one when a huge wave is approaching. Plant the wall nut on the lane with the most zombies. Constantly plant Peashooters behind your Bong Choys. 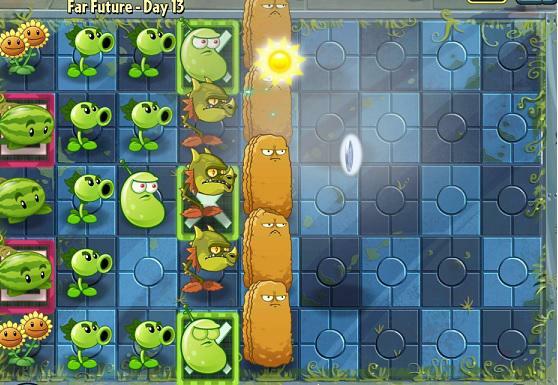 Once you have no more free tiles, remove the Sunflowers you planted earlier and replace them with more Peashooters. Use plant food on heavily damaged Wall-nuts. Always prioritize the zombies that are ahead. Start off with 2 Sunflowers. DO NOT plant more. Start planting Bong Choys on the 3rd tile of each lane. 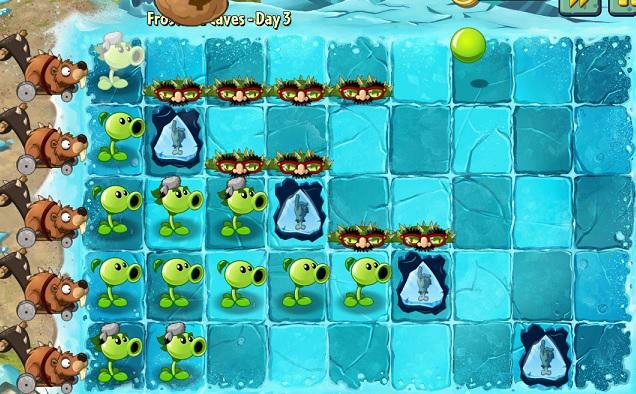 Plant a Peashooter whenever a Conehead zombie or an Explorer Zombie appears on a lane. The Bong Choys cannot take them down quickly enough on their own. If you see a Buckethead Zombie plant a Wall-nut in front of the Bong Choy. Never have more than 13 flowers. That way Iceberg Lettuce can be used in front of a Bong Choy to give it enough time to kill off a stronger zombie or an Explorer zombie. Your goal is to not let any zombies pass until the last wave, where your mowers will take care of most lanes. DO NOT plant Peashooters randomly. With only 2 Sunflowers you have a very low sun income. Considering you can't plant more than 14 flowers, each misplaced plant will have to be removed and planted again. Plants to pick: Peashooter, Bloomerang, Wall-nut, Boy Chong, Potato Mine. Place a Bloomerang on the second tile of each lane. Boy Chongs should be planted on the third tile of each lane. 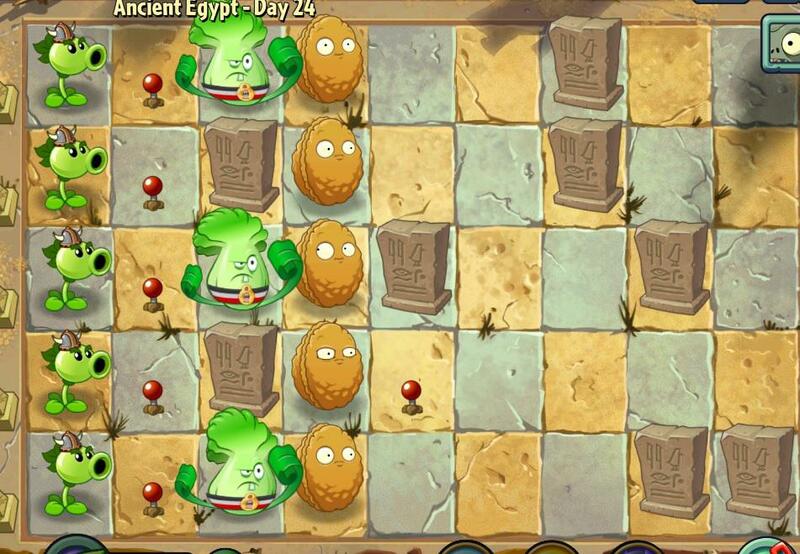 Plant a Peashooter behind the Bloomerang on the middle lane to help destroy the grave stones quicker. A Wall-nut should be placed in front of each Bong Choy. Save enough sun to plant a Bong Choy and a Wall-nut on each lane after the grave stones are destroyed. Pay very close attention to the health of your Wall-nuts. As soon as one gets heavily damaged, use plant food on it. 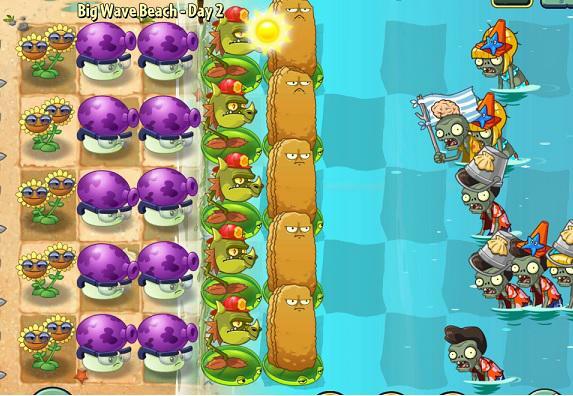 The last 25 sun should be used for a Potato Mine during the final wave. Place the mine on the first tile of a lane where the zombies are about to pass. Start off with 2 Sunflowers. Do not plant any more. Start planting Bong Choys on the second or third tile whenever you see a zombie coming. If a zombie is getting too close and you don't have a Bong Choy on the lane yet, plant a Peashooter in the back line. 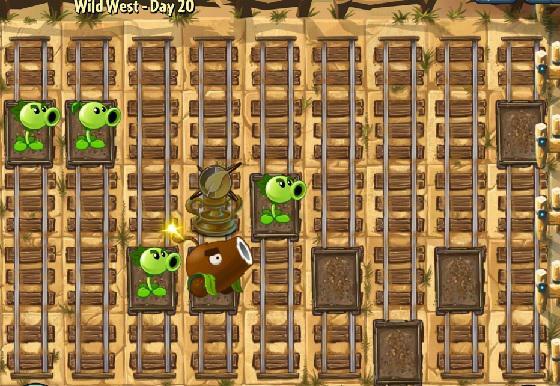 Keep in mind that you can only afford to plant 1 Peashooter. Never have more than 11 plants. 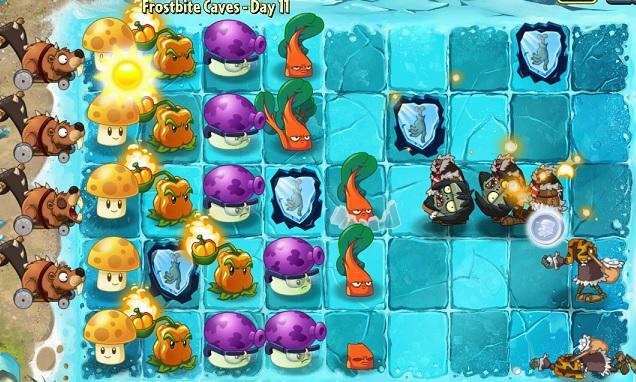 With a max number of 12, you'll need the last one for Iceberg Lettuces. Use it ONLY on Explorer Zombies (the ones with the torches) whenever they get in the Bong Choy's range. Once you have all the plants you need (and about 300-400 sun), you can remove the Sunflowers and replace them with a Peashooter to support a crowded lane. 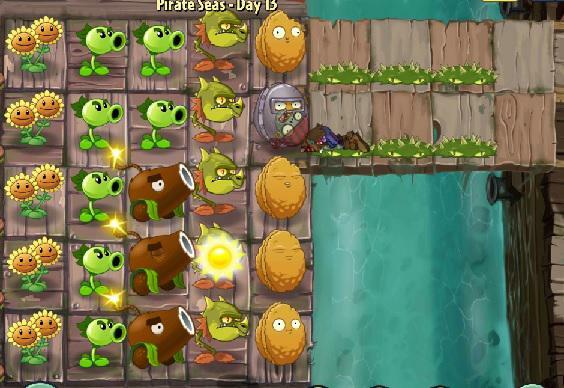 Use Plant food on damaged Wall-nuts, Peashooters (only when it's critical) or even Sunflowers in order to replace them with Peashooters quicker. Start off with a few Sunflowers. Even though there are 4 Sunflowers that need to be protected, you'll still need another 5. Plant a Bong Choy and a Wall-nut in front of each endangered Sunflower. Plant as many repeaters as you can, especially behind the endangered Sunflowers. Use plant food on anything but Sunflowers. Make sure to have the Iceberg Lettuce in your arsenal. In case things get rough, use a Potato Mine with plant food. Start off with 1 Twin Sunflower. Plant your first Kernel-pult when a zombie appears. Keep planting Twin Sunflowers until you have 3 or 4 (preferably 4). Keep placing Kernel-pults until you have enough sun for a Melon-pult. Use Wall-nuts to stop Conehead and Buckethead zombies. Use the Iceberg Lettuce if a zombie is getting too close. This will ensure you can save the sun for Melon-pults. Use plant food on Melon-pults or damaged Wall-nuts. If you are running low on sun, feel free to use the plant food on a Twin Sunflower. Plants to pick: Sunflower, Wall-nut, Repeater, Grave Buster, Bong Choy, Iceberg Lettuce/Potato Mine. Start off with 2 Sunflowers. Use Grave Busters on the grave stones that are closest. 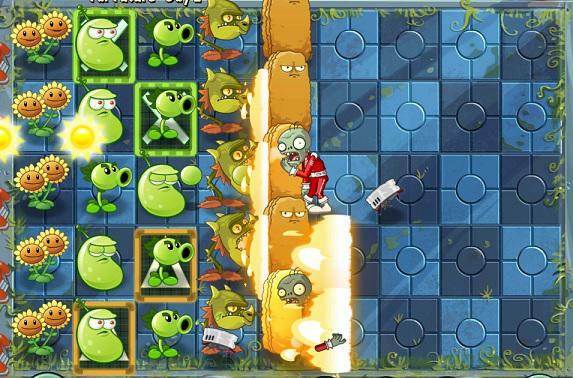 Plant the first Bong Choy on the third tile wherever the first zombie shows up. Keep plant Bong Choys and use the Grave Buster whenever it is off cooldown. If you see a Conehead or a Buckethead zombie, plant a Wall-nut in front of the Bong Choy. Once you have a full line of Bong Choys, start planting Repeaters on the tougher lanes (Buckethead zombies, Pharaoh Zombies). 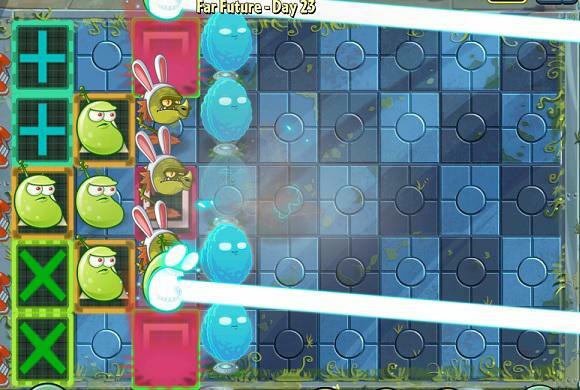 Use Iceberg Lettuce to slow tougher zombies from damaging the Wall-nuts. Once you have 14 plants on the field start removing the Sunflowers. Be patient and see where the Repeaters will be needed before planting them. Use plant food on mainly on damaged Wall-nuts. 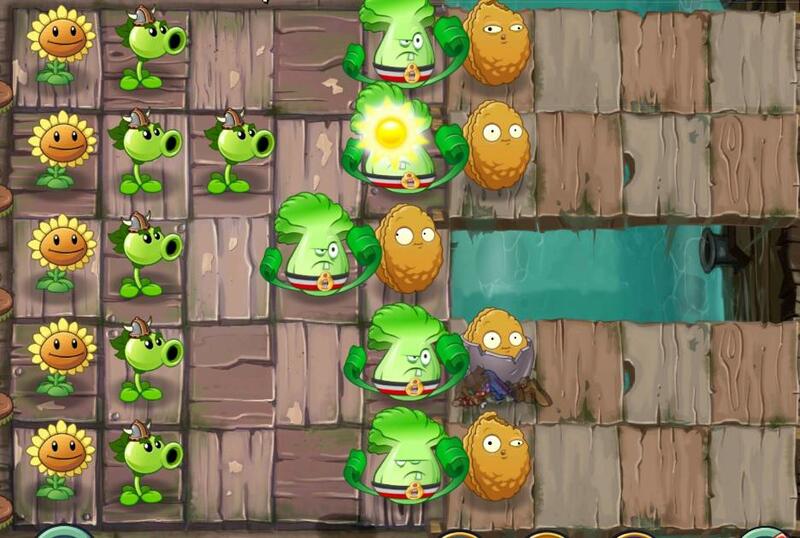 If a Wall-nut is destroyed and you cannot plant another one in time, use the plant food on the closest Bong Choy to the zombies. Your goal is to have 5 Bong Choys and 5 Wall-nuts on each lane before the last wave. No mowers should be wasted until then, as the zombies are most likely to break through at least one of the lanes. Prioritize the zombies on the front lines. Plants to pick: Wall-nut, Bong Choy, Repeater, Potato Mine, Iceberg Lettuce. The first line of defense should be made of repeaters. The second line should be occupied by Potato Mines. This will give your Repeaters a chance to survive longer in case zombies break through the Wall-Nuts. The third line of defense should consist of Bong Choys followed by a line of Wall-nuts. Put an extra Potato Mine in front of Wall-nut on the second lane (south-north). This is how your initial defense should look like. Once the grave stones on the third line are destroyed, plant the last 2 Bong Choys. You should have an extra 100 sun. Save it to replace destroyed Wall-nuts. The Iceberg Lettuce is your best friend. Use it ONLY on Explorer Zombies (the ones with the torches) and in very rare occasions to prevent a zombie from destroying a wall-Nut. A wave of 3 Pharaoh Zombies followed by 5 Explorer Zombies will march forward near the end of the level. Make sure you have an extra plant food left. Plant an Ice Lettuce on a tile without a zombie on it and use the plant food. This will freeze every zombie on the screen and will burn out the Explorer Zombies' torches, saving 3 Wall-nuts for the last wave. Use 2 pieces of plant food on Damaged Wall-nuts AFTER you've used up all the sun you had left. The 3rd piece of plant food should be saved for an Iceberg Lettuce AT ALL COSTS. 25. Day 25 Plant the Wall-nuts in the middle column. Save the tiles behind the Wall-nuts for Bong Choys. If you have too many plants just plant and dig out whenever you get a Bong Choy. Save on Plant Food when you have only 1 piece. Use it only for Mummified Gargantaurs and Explorer Zombies. Don't forget about the Wall-nuts. They are very limited, so keep them safe with plant food. The Zombot will occasionally charge towards your plants and destroy everything in its way. Wall-nuts are the only thing that can prevent that so make sure you always have at least 2 of them covering each 2 lanes. Start off with 2-3 Sunflowers. Plant your first Bong Choy on the lane where the first zombie is. Plant ALL Bong Choys on the 5th tile. The Bong Choy on the middle lane should be planted 1 tile behind to make space for a Wall-nut. Plant another 2-3 (5 total) Sunflowers and proceed with planting Bong Choys on the other lanes. If you're short on sun for a Bong Choy plant a Wall-nut, to gain some time. Before the last wave, you'll probably be short on Wall-nuts. Whenever it's on cooldown and you have the sun, plant a Repeater on a tougher lane to save your Bong Choy. Use plant food on heavily damaged Wall-nuts. Start off with 2 Sunflowers. Plant your first Bong Choy on the lane where the first zombie is. Plant ALL Bong Choys on the 5th tile. The Bong Choy on the bottom lane should be planted 1 tile behind to make space for a Wall-nut. Plant another 2-3 (5 total) Sunflowers and proceed with planting Bong Choys on the other lanes. If you're short on sun for a Bong Choy plant a Wall-nut, to gain some time. 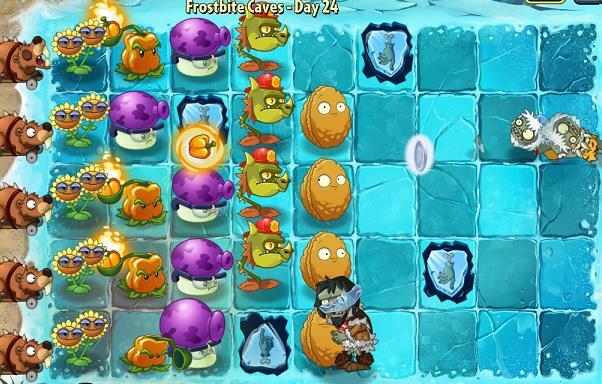 Use Iceberg Lettuces on Conehead zombies if you don't have a Wall-nut on the lane. Plant at least one Repeater behind each Bong Choy. If you're short on sun for a Repeater and need a plant quickly, plant a Kernel-pult instead. Use plant food on damaged Wall-nuts, Bong Choys or Repeaters. Simply wait until the zombies are gathered in a pile. 3x combos should get you enough points. Start off with 2-3 Sunflowers. Plant the first Snapdragon on the 5th tile of the lane the first zombie appears. Plant another 2-3 Sunflowers (5 max). Plant a second Snapdragon. Make sure that the fire from the 2 Snapdragons covers the entire plank in front. Once you have 5 Sunflowers, start planting Wall-nuts along with Snapdragons. On the top lane, plant a Snapdragon 1 tile behind to make space for a Wall-nut. 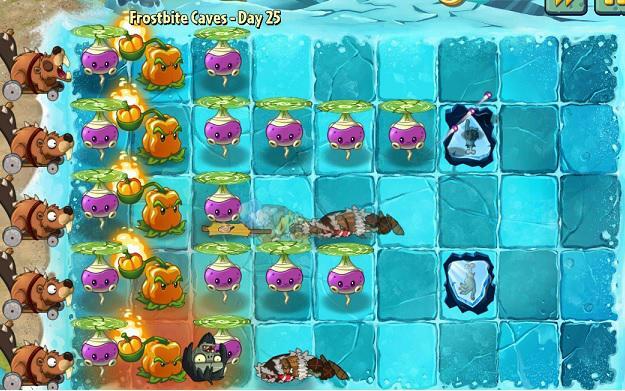 Snapdragons defreeze any frozen zombies with their attacks. Potato mines behind the Snapdragons are recommended for safety. Use plant food on damaged Wall-nuts and Snapdragons. Plant Repeaters on each lane except for the top one. Prioritize the lanes where Conehead and Buckethead zombies approach. Start off with 2-3 Sunflowers. Plant your first Kernel-pult on the lane where the first zombie appears. Plant another 2-3 Sunflowers then start planting Kernel-pults along with Wall-nuts. Once you have a full line of Kernel-pults fill up the empty tiles behind the Wall-nuts with even more Kernel-pults. Once you're full, gather 200-300 sun and start removing Sunflowers to replace them with Kernel-pults. Remove only the Sunflowers on the lanes with no water. Cherry Bombs have a long cooldown. Use them on huge groups of tough zombies. Use plant food on damaged Wall-nuts. Start off with 2-3 Sunflowers. Plant the first Snapdragon on the 5th tile of the lane the first zombie appears. Plant another 2-3 Sunflowers (5 max). Plant a Wall-nut on the 6th tile of the lane next to your first Snapdragon. Once you have 5 Sunflowers, start planting Wall-nuts on the side lanes (where the water is). Make sure you have a Kernel-pult or a Repeater there before the last wave The two lanes where the zombies walk their way to your plants, will need the most support from behind. Plant 1 Kernel-pult on each lane and the rest fill up with Repeaters. Once those two lanes are filled up with plants, remove the Sunflowers on the first tiles and replace them with more Repeaters. 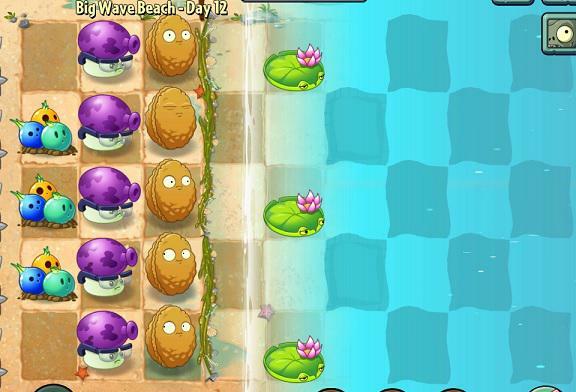 DO NOT remove the Sunflowers before the last wave. The Snapdragon behind the Wall-nut on the top lane can be skipped. Use plant food on damaged Wall-nuts and Snapdragons. Start off with 2-3 Sunflowers. Plant the first Snapdragon on the 5th tile of the mid lane. Plant another 2-3 Sunflowers (max 5). Proceed with another Snapdragon and a Wall-nut. Plant a Repeater on one of the side lanes when a zombie appears. Plant another Snapdragon + a Wall-nut on mid lane. 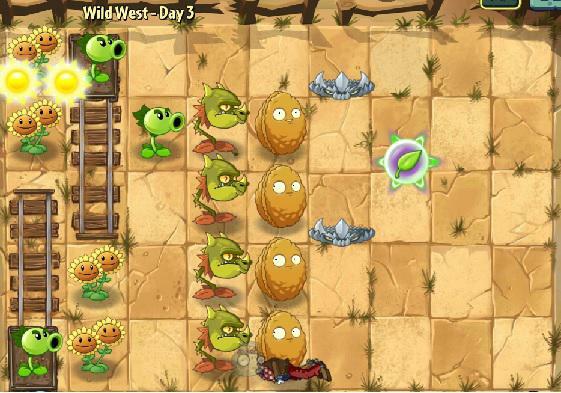 Once you have 2-3 Wall-nuts and 3 Snapdragons, start putting Spikeweed in front of the Wall-nuts. Whenever you see a Barrel Roller Zombie, make sure to put Spikeweed in front of it in order to break the barrel. A Repeater and a Wall-nut (on both lanes) are enough to hold the top and bottom lanes. Use plant food mainly on damaged Wall-nuts. 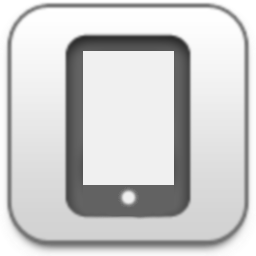 Using it on Snapdragons is also an option. Plant Kernel-pults in the back lines. The first 3 Snapdragons should be planted on the 4th tile of the middle lanes. The first 3 Wall-nuts should be planted on the 5th tile of the middle lanes, in front of the Snapdragons. The first two Kernel-pults should be planted on the bottom and top lane. 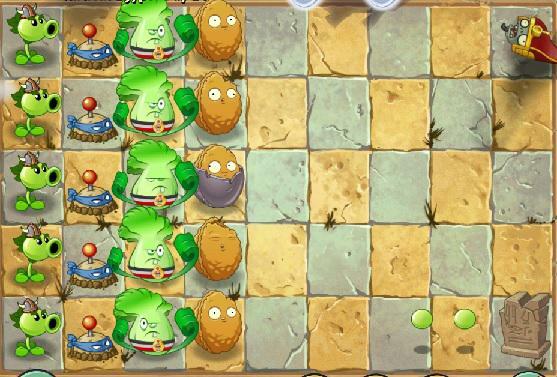 Plant Potato Mines on the 3rd tile of each lane. Prioritize the 3 middle lanes. Spikeweed should be planted in front of the Wall-nuts. Always make sure you have at least 1 stored. Use plant food on damaged Wall-nuts and the middle Snapdragon to stop Gargantaurs. Start off with 2 Twin Sunflowers. 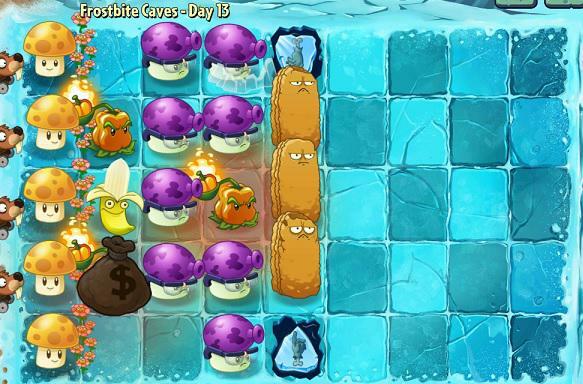 Plant the first Wall-nut on the 5th tile of the lane where the fist zombie appears. Plant a Snapdragon behind it. Plant another 1-2 Twin Sunflowers (until you get 5). Plant a second Snapdragon on the empty lane where the plank is. Proceed to plant Wall-nuts until all 5 lanes are covered. Plant at least 1 Repeater on each lane. Start with the lanes where the water is. Put a Kernel-pult behind the Snapdragons on the top 2 lanes. Plant as much Spikeweed on the planks once you have Repeaters on each lane. Once you're full, dig out the 2 Twin Sunflowers on the top 2 lanes and replace them with Repeaters. Plant food should be used on damaged Wall-nuts, Snapdragons or even Repeaters. Start off with 2 Twin Sunflowers. 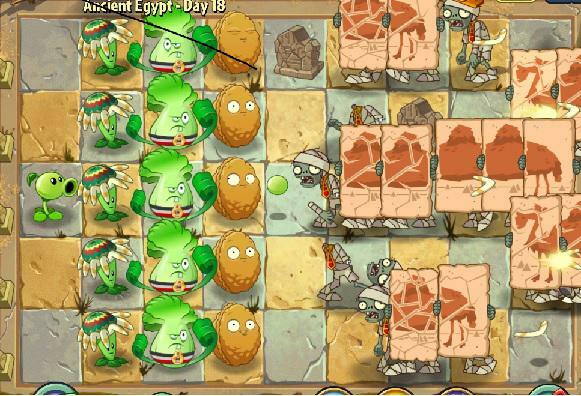 Plant the first Wall-nut on the 5th tile of the lane where the first zombie is. The first Snapdragon should be placed behind the Wall-nut. Plant another 1-2 Twin Sunflowers (max 5). Plant the second Wall-nut in front of the first the empty lane where the plank is and put another Snapdragon behind it. Start planting Repeaters in front of the Twin Sunflowers. Prioritize the lanes where there are no Snapdragons or Wall-nuts yet. Put Wall-nuts on the 5th tile of each lane. Plant a Snapdragon behind each one. 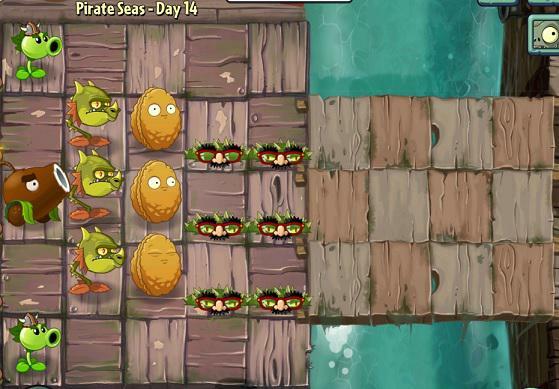 Always keep a Spikeweed in front of the Wall-nuts on the planks. Plant a Kernel-pult on the two lanes where the plank is. 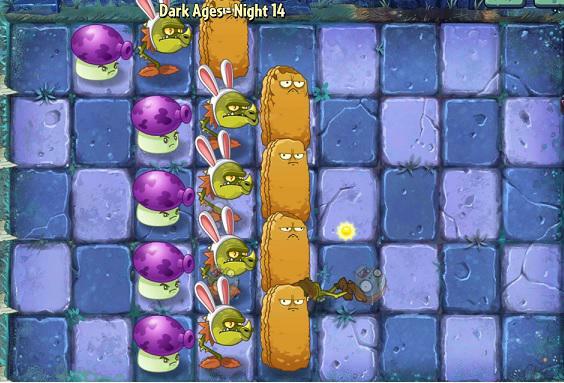 Use plant food on damaged Wall-nuts and on Repeaters and Snapdragons if any zombies jump over the Wall-nuts. Be patient and wait until the zombies are gathered together as much as possible. Start off with 2 Twin Sunflowers. 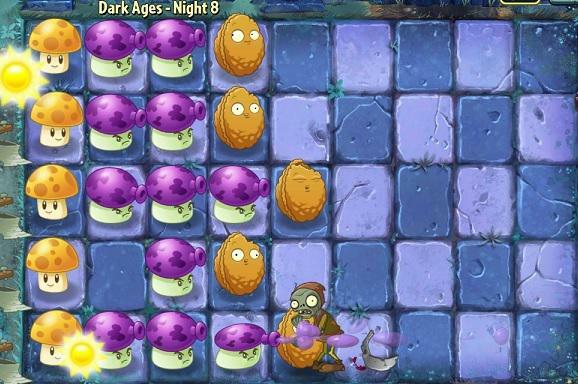 Plant the first Wall-nut on the 5th tile of the lane where the first zombie is. The first Snapdragon should be placed behind the Wall-nut. Plant another 1-2 Twin Sunflowers (max 5). Start planting Repeaters on the lanes where the water is. Wall-nuts should go on the 5th tile of each lane. The two lanes where the plank is should be the first ones to receive a Wall-nut. Once you have Repeaters on the top 3 lanes, plant 2 more on the lanes where the plank is. 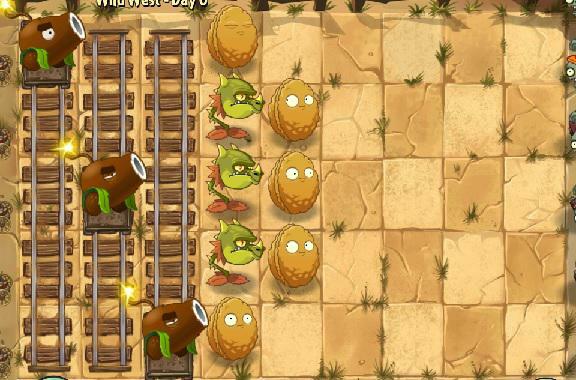 Constantly keep at least 1 Spikeweed in front of the Wall-nuts on the plank to stop Barrel Roller zombies. Plant another 2 Repeaters on the lanes where the plank is. Once you have all of the above, put Coconut Canons on the lanes where the water is. Use them to take down the cannons. Plant food should be used on heavily damaged Wall-nuts or on Repeaters and Snapdragons when the zombies jump over the Wall-nuts. Start off with 2 Twin Sunflowers. 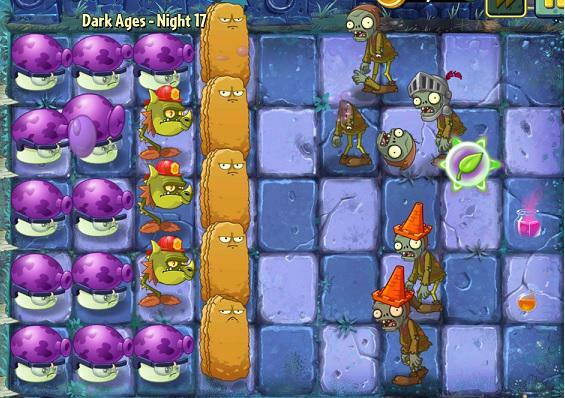 Plant the first Wall-nut on the 5th tile of the lane where the first zombie is. The first Snapdragon should be placed behind the Wall-nut. Plant another 1-2 Twin Sunflowers (max 5). Start planting Repeaters on the lanes where the water is. Wall-nuts should go on the 5th tile of each lane. The two lanes where the plank is should be the first ones to receive a Wall-nut. Once you have Repeaters on the top 3 lanes, plant 2 more on the lanes where the plank is. Use Spikeweed in front of the Wall-nuts for permanent extra damage. Plant another 2 Repeaters on the lanes where the plank is. Once you have all of the above, put Coconut Canons on the lanes where the water is. Plant food should be used on heavily damaged Wall-nuts or on Repeaters and Snapdragons when the zombies jump over the Wall-nuts. Plants to take: Wall-nut, Snapdragon, Repeater, Spikeweed, Coconut Canon. Plant a Wall-nut on 3rd tile of the 3 middle lanes. Plant a Snapdragon behind each Wall-nut. Plant 2 Spikeweed plants in front of each Wall-nut. 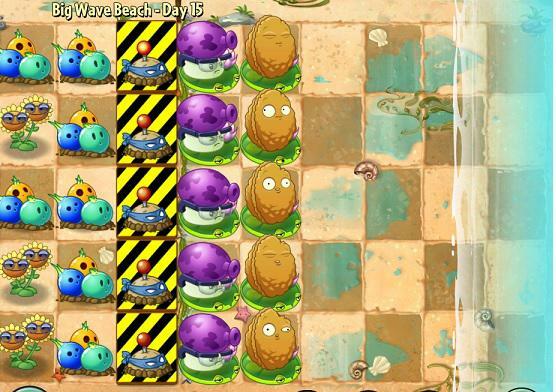 Plant a Coconut Canon on the first tile of the middle lane. Plant a Repeater on the first tile of the bottom and top lane. Use the Coconut Canon ONLY to take down Barrel Roller zombies and Parrots. Use plant food to on Snapdragons or any other attacking plant ONLY when a parrot is about to take away one of your plants. Start off with 2 Twin Sunflowers. 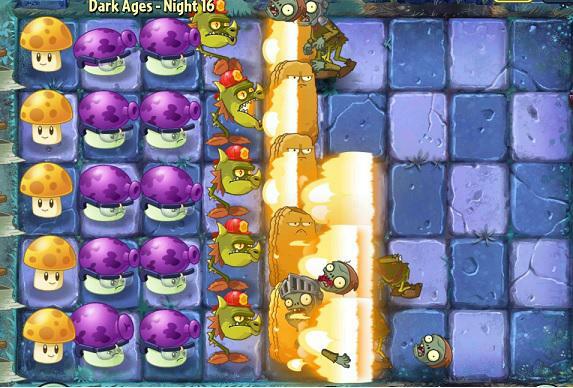 Plant the first Wall nut on the 5th tile of the lane where the first zombie appears. Plant a Snapdragon behind it. Plant Wall-nuts as soon as they come off cooldown. They are the only thing that can stop the jumping zombies on the side lanes from trembling the flowers. Plant Repeaters on each of the side lanes (where the water is). Once you've got 5 Wall-nuts and 3 repeaters, plant another Snapdragon behind the Wall-nut on the plank. Plant Repeaters on the lanes where the plank is and Snapdragons behind the Wall-nuts on the lanes with water. Put a Coconut Canon on the lanes where the water is and use them to destroy cannons. 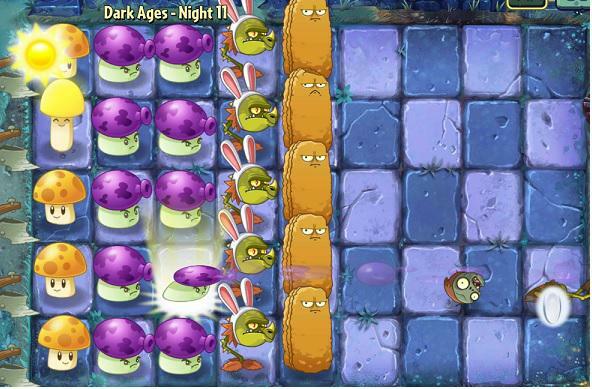 Use plant food on heavily damaged Wall-nuts or on Snapdragons when a huge group of zombies is about to break a Wall-nut. Start off with 7 Sunflowers. The Spring Beans can protect themselves in the beginning. Start planting Wall-nuts. Plant 2 on the 4th tile of the side lanes (where the water is). Plant Spikeweed in front of the Wall-nuts on the side lanes. 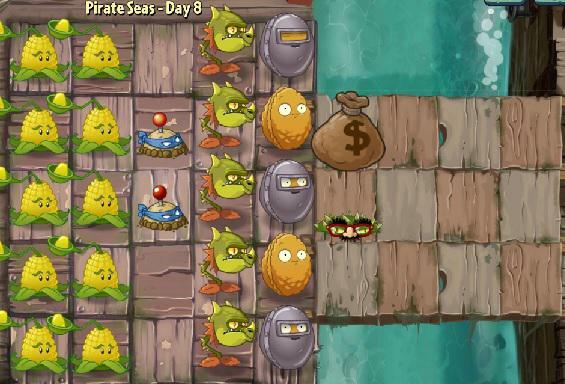 Make sure you have at least 1 Spikeweed in front of the Wall-nuts on the plank. Start planting Repeaters on behind the endangered plants. Plant as much Spikeweed in front of the endangered plants as possible. Make sure you have at least a Wall-nut and a Spikeweed on the lanes with water. 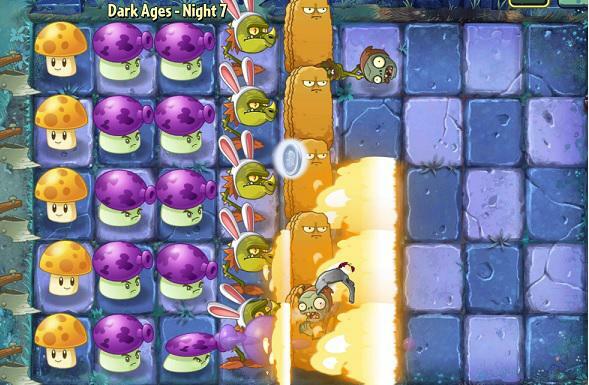 Use plant food on damaged Wall-nuts and on Spring Beans during the last wave to get rid of the hordes of Barrel Roller zombies. Start off with 2 Twin Sunflowers. Plant a Wall-nut on the 5th tile of the lane where the first zombie appears. Plant a Snapdragon behind the Wall-nut. Plant another Sunflower (keep planting 1 after each attacking plant, 5 max). Plant a second Wall-nut and a Snapdragon next to the first one (where the plank is). Next, plant a Wall-nut on the 5th tile of every lane. Put a Snapdragon behind a Wall-nut on the second top lane. Plant Repeaters on the non-protected lanes. Make sure you have a couple of Spikeweed in front of the Wall-nuts on the plank. Plant a Coconut Canon on each lane. Use them to take down big groups of zombies and complete the objective. Use plant food on damaged Wall-nuts, or Snapdragons to secure the objective. Start off with a Peashooter on the lane where the first zombie appears. Plant a Wall-nuts on the 3rd tile of the lanes where the plank is. 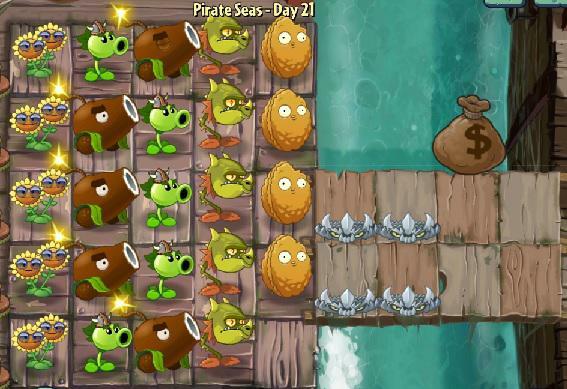 Plant another Peashooter next to the first one (where the plank is). Start planting Wall-nuts on the other lanes. Lanes that don't have Wall-nuts yet should be covered with Peashooters when a zombie or a cannon appears. Plant a Repeater on both lanes where the plank is. Use Iceberg Lettuces whenever to slow down Buckethead and Conehead zombies. 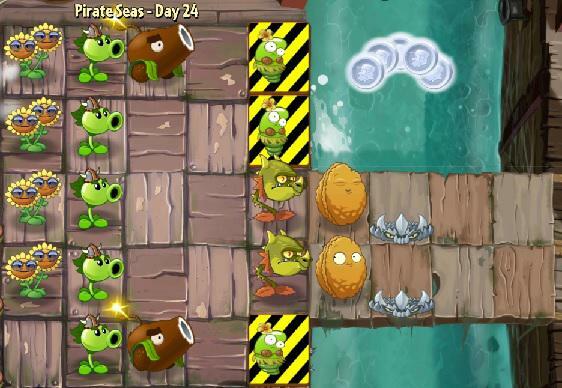 Use plant food on heavily damaged Wall-nuts and on Peashooters or Repeaters to stop multiple zombies or to destroy a cannon. Start off with 2 Twin Sunflowers. Plant a Wall-nut on the 5th tile of the lane where the first zombie comes. Immediately after that plant a Snapdragon behind it. Plant another 1-2 Twin Sunflower (plant them until you have 5). 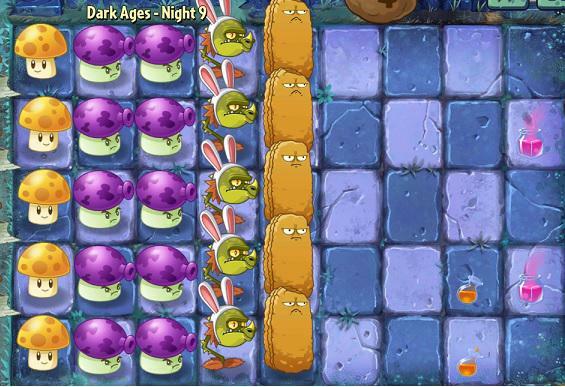 As soon as you see a zombie approaching from another lane, plant a Wall-nut and a Snapdragon on that lane. Fill up each 5th tile with a Wall-nut and a Snapdragon behind it. Plant a Repeater on lanes with no Wall-nuts or just lanes that need support. Spikeweed and Spikerocks are optional but very effective. Use plant food on anything. Be patient and only shoot when zombies are gathered in a pile. Never shoot at a single wave of zombies. Start off with 2 Twin Sunflowers. 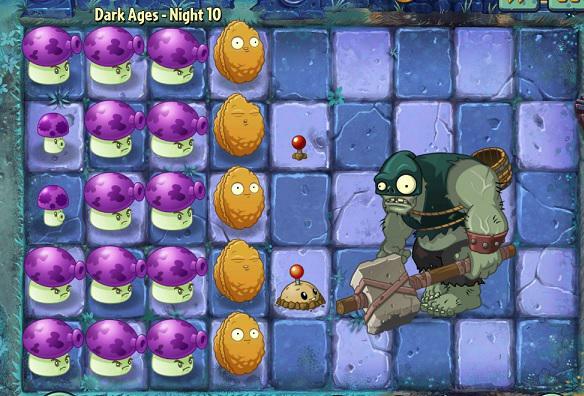 Plant the first Wall-nut on the 5th tile of the lane where the first zombie is. Plant a Snapdragon behind it right away. Keep planting Twin Sunflowers until you have 5. Plant a second Wall-nut and a Snapdragon behind it, on the empty lane where the plank is. Start planting Wall-nuts on the other lanes. Plant Repeaters on the lanes where the water is. Prioritize the ones where the zombies appear first. Plant a Coconut Cannon on the lanes with water first. Use them to take down cannons. Spikeweed and Spikestones are optional. Use plant food on damaged Wall-nuts, on Snapdragons if you need to secure the "Kill 5 zombies in 5 seconds" objective. Twin Sunflowers are also an option in case you don't have enough sun to complete the 3250 sun objective. 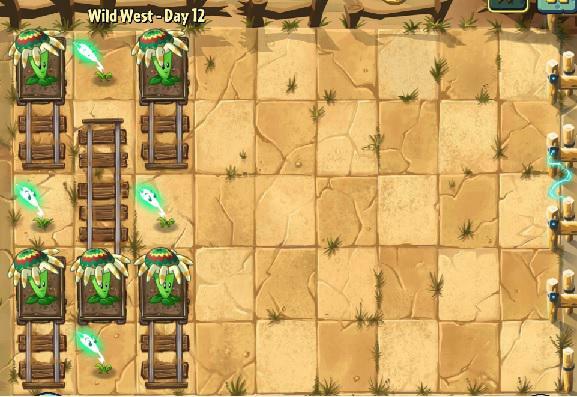 Plant a Spikestone on the 4th tile of each lane. Plant a Wall-nut on the 3rd tile of each lane. Plant a Snapdragon on the 2nd tile of each lane. Plant a Repeater on the first tile of the top and bottom lane. Start off with 2 Twin Sunflowers. Plant the first Wall-nut on the flowers, on the lane where the first zombie appears. Plant a Snap Dragon behind it. Plant 1-2 (4 total) Twin Sunflowers. Plant another Wall-nut on the next lane where a zombie appears. Plant another Snapdragon. 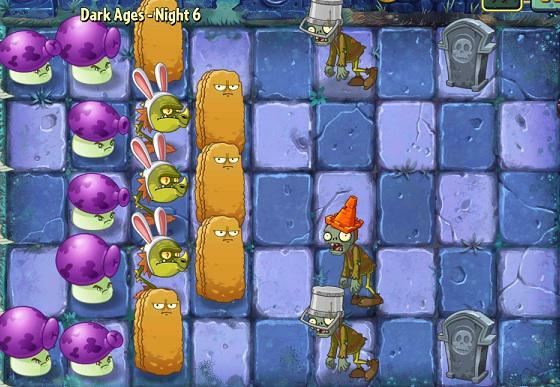 Make sure that the 2 Snapdragons you currently have are covering the entire plank (where the zombies are walking). Plant a Wall-nut on the lane where the water is and put a Repeater behind. You should have a Wall-nut on each tile with flowers.. Plant either a Repeater or a Stonespike on lanes that need support. Plant at least one Coconut Cannon. Use it to complete the "Defeat 8 zombies in 10 seconds" objective. Use plant food on damaged Wall-nuts or on Repeaters and Snapdragons in order to secure the objective. Start off with 2 Twin Sunflowers. 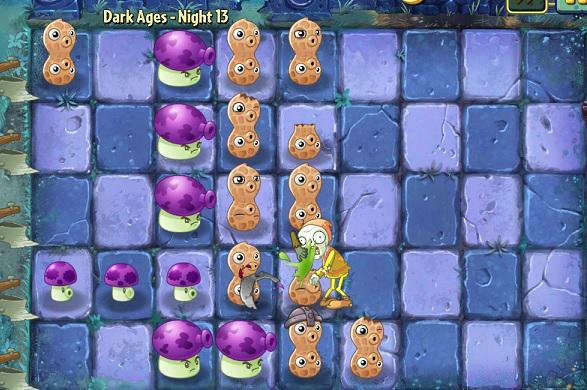 Plant the first Wall-nut on the 5th or 6th tile of the lane where the first zombie is. Plant a Snapdragon behind it right Away. 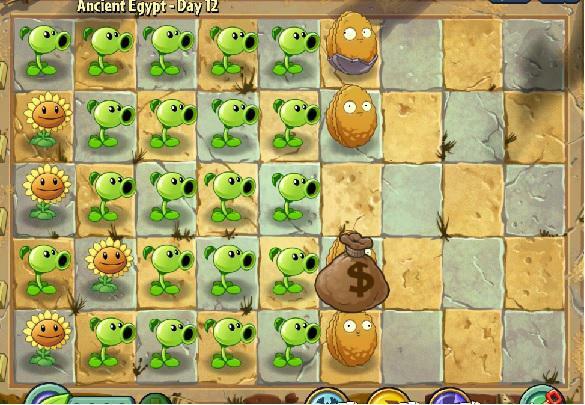 Plant another 2 Twin Sunflowers and plant another Wall-nut + Snapdragon on the empty lane where the plank is. Plant a Repeater on each lane with an endangered plant. Prioritize the ones where the zombies first show up. Plant a couple more Repeaters. Once you have one on each lane, plant a Coconut Canon on the top and bottom lane. Use them to destroy cannons. 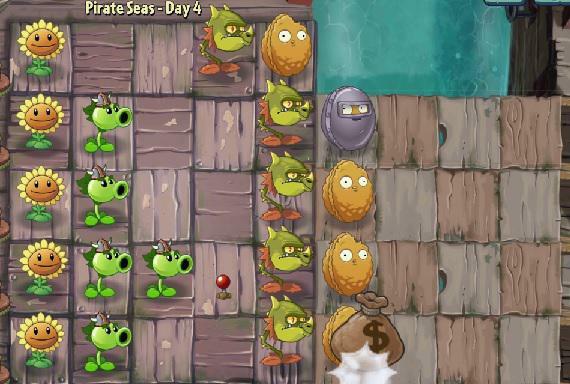 Use plant food on heavily damaged Wall-nuts, on Repeaters in order to get rid of the cannons, or even on Twin Sunflowers in order to quickly acquire enough sun for a Coconut Canon. Coconut Cannons are your best friends. Place them on the very first tile of each lane. Use them as much as you can (try to hit the Zombot every now and then). Don't forget to plant your Spikeweed. Barrel Roller zombies will show up. Use plant food only on Snapdragons when a Gargantaur is approaching and on Coconut Cannon (especially if it's going to hit the Zombot as well). 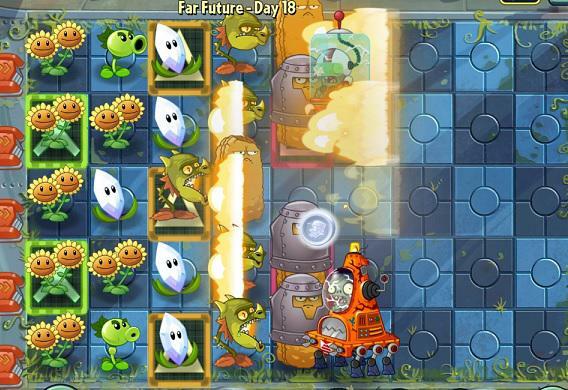 Start off with 2 Twin Sunflowers Plant a Repeater in the cart on the first tile as soon as possible. Move the cart around to stop zombies from each lane. Plant 1 more Twin Sunflower. Plant another Repeater in the cart on the 3rd lane. When a Conehead zombie shows up, make sure you have both plants attacking it. Now that you have 2 moving Repeaters, plant a Wall-nut on the top, middle and bottom lane. Plant Snapdragons behind them. Use plant food on Twin Sunflowers to quickly get that first Repeater. Start off with 1 Twin Sunflower. DO NOT plant those on the 1st tile. Prospector Zombies (the ones with dynamites) will directly jump and eat through anything you have there. Plant a Split Pea in the cart that can move 3 tiles. Plant another Twin Sunflower (3-4 max) and plant another Split Pea on the other cart. Occupy the 3 empty tiles on the second column with Repeaters. Start planting Wall-nuts. Prioritize the lanes where Conehead and Buckethead zombies are approaching (leave the middle lane for last). Conehead zombies can be taken down by a single Repeater. Plant Snapdragons behind the Wall-nuts. Pay close attention to Prospector zombies. As soon as you see them jumping behind your plants, move the Split Pea to respective lane. Plant food can be used on pretty much anything. 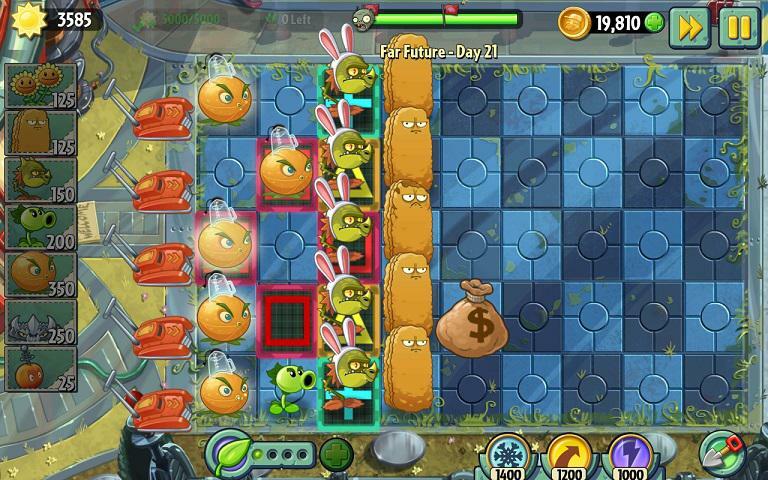 Start with 1-2 Twin Sunflowers Plant a Repeater in the cart that can reach the lane of the first zombie. Proceed with another 1-2 Twin Sunflowers (4max). Plant another Repeater in the other cart. Use the two Repeaters to cover all lanes until you have more defenses. Proceed with Wall-nuts on the 5th tile and plant Snapdragons behind them. Use plant food on damaged Wall-nuts, Repeaters or Snapdragons. The first two plants should be placed in the mine carts with most mobility (tile 2 and tile 4). Plant the first Split Pea in the cart on the 3rd tile of the top 2 lanes. The next Split Pea should be planted in the cart on the bottom lanes. Check where the tougher zombies are for the next wave by using the "view" option under the "Pause" button. Plant your Repeater accordingly (in a mine cart). 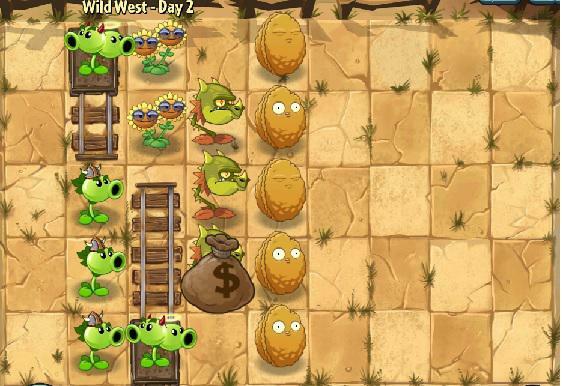 If a Prospector zombie shows up on a lane with no Split Peas, simply move the plants out of the zombies' way. Once they turn their back on a plant, move it accordingly to get the job done. The next Repeater should go in the last cart. Have at least 2 plants shooting at Conehead zombies, the other ones you can take care of afterwards. Now that all the carts are full, check to see where the Buckethead zombie will come from and plant the next Repeater on the respective lane, in front of the other plants. Have 3 or 4 plants shoot at it to take it down quickly enough. Plant the next 2 Threepeaters on the 1st and 3rd tile of the middle lane. The last Threepeater should go in front of the carts, on the lane where the Pianist zombie is. This will prevent the zombies from moving around too much. Have half of your plants shooting at him and the other half at the Buckethead zombie. Don't be bothered by Prospector zombies that jump behind your defenses. You can deal with them later. Start off with 1-2 Twin Sunflowers on the 2nd column. Plant the first two Snapdragons on the 2nd and 4th lane, in front of the rails. Plant a Repeater in the mine cart to help defeat Conehead zombies. The first Wall-nuts should be planted in front of the Snapdragons. Occupy the unprotected lanes with Wall-nuts first. Keep planting Snapdragons until you have one behind each Wall-nut. As soon as you see the first Prospector zombie, dig out the Repeater in the cart and replace it with a Split Pea. Use Cherry Bombs and Chili Beans on tough zombies (Poncho, Buckethead zombies). Use plant food mainly on damaged Wall-nuts. Plant a Coconut Cannon in each mine cart. Plant a Snapdragon in front of the rails, on the 3 middle lanes. Put 1 Wall-nut in front of each Snapdragon, and 2 on the bottom and top lane, 1 tile behind. 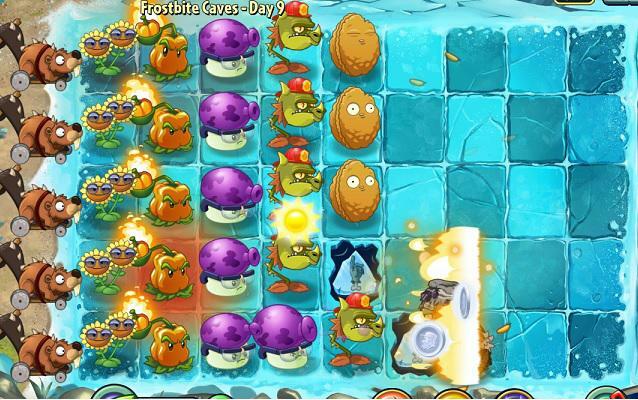 Use the Coconut Cannons on tough zombies (Poncho zombies, Pianist zombies). Plant food should be used on heavily damaged Wall-nuts that are critical for the survival of your plants. It can also be used on Snapdragons and Coconuts to defeat massive numbers of zombies. Start off with 1-2 Twin Sunflowers. Plant a Pea Pod in the mine cart on the back. Use it to defeat any weak zombies while planting Twin Sunflowers. Plant another Twin Sunflower (max 4-5). Put Snapdragons and Wall-nuts in front of the rails on the back. The first 2 Snapdragons should go on the 2nd and 4th row. Keep upgrading the Pea Pod in the mine cart. Don't forget to plant Wall-nuts as quickly as possible. Use Cherry Bombs and Chili Beans on tough zombies (Buckethead, Poncho zombie). Once you're full, gather some sun (500+) and dig out any Sunflower to replace it with Pea Pods. 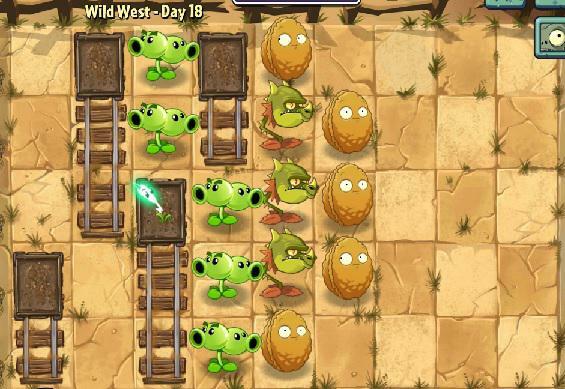 Use plant food on damaged Wall-nuts and on the Pea Pod inside the mine cart. Keep in mind that the Pea Pod shoots 5 times when given plant food, so it can cover more than 1 lane at a time. Pea Pods should be planted in the mine carts until all 3 are fully stacked. Plant Wall-nuts in front of the rails. The first 5 Split Peas should go in first line for extra support. 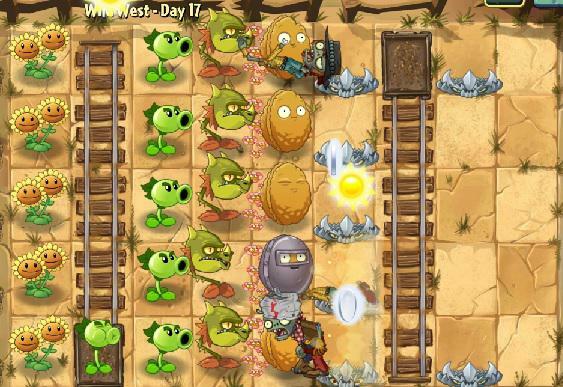 Once you're full on Pea Pods you can either remove the Split Peas in the back lines and replace them, or just place them in front of the Wall-nuts to slow down zombies. Use Chili Beans only on tougher zombies (Buckethead or Poncho zombie) Save and use plant food on Pea Pods (stacked or not) to defeat the Gargantaurs or lanes crowded with tough zombies. Start off with 2-3 Sunflowers. Plant a Lightning Reed in the mine cart on the first tile. Plant another 2-3 Sunflowers. You next plant should be a Split Pea in the mine cart that's the farthest. Move the cart accordingly so the Split Pea can attack zombies from behind as it deals more damage. Plant Wall-nuts in front of the small rails in the middle. Prioritize lanes where tougher zombies are approaching. Plant a Lightning Reed in the middle mine cart. Winter Melons should be put on the 2nd and 4th lanes first (behind the middle mine cart). 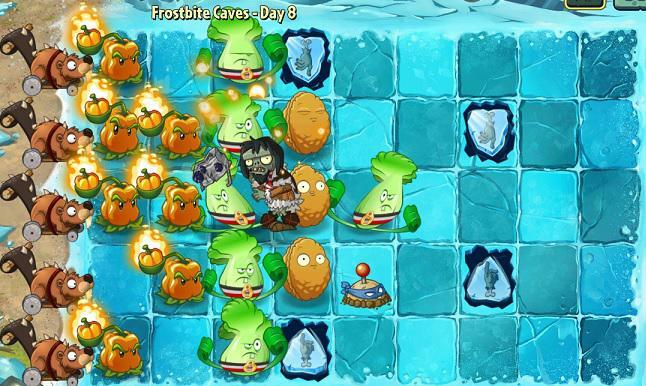 Use plant food on Winter Melons in order to take down the hordes of strong zombies or even the Prospector zombies. Use Chili Beans on Poncho zombies. Start off with 1-2 Twin Sunflowers. Plant Lightning Reeds on the 2 mine carts on the first row. Plant another 1-2 Twin Sunflowers (5 max). Put a 3rd Lighting Reed between the carts on the first row. Start planting Snapdragons on the third tile of each lane. Start with the second and the 4th lane. Wall-nuts should be planted in front of the Snapdragons. Once everything is full, put Stonespikes in front of the Wall-nuts. Use Chili Beans and Cherry Bombs to easily get rid of Pianist and Buckethead zombies. You only have 500 sun to spend, which means NO Sunflowers. Start with a Snapdragon on the second bottom or top tile, between the rails. Plant a Wall-nut in the mine cart in front of your Snapdragon. Move the cart to stop the zombies that are out of the Snapdragon's range. As soon as you get the sun, plant a second Snapdragon on the top or bottom second tile. The two Snapdragons should cover the entire area now. Plant another 2 Wall-nuts bottom and top tiles, next to the Snapdragons. 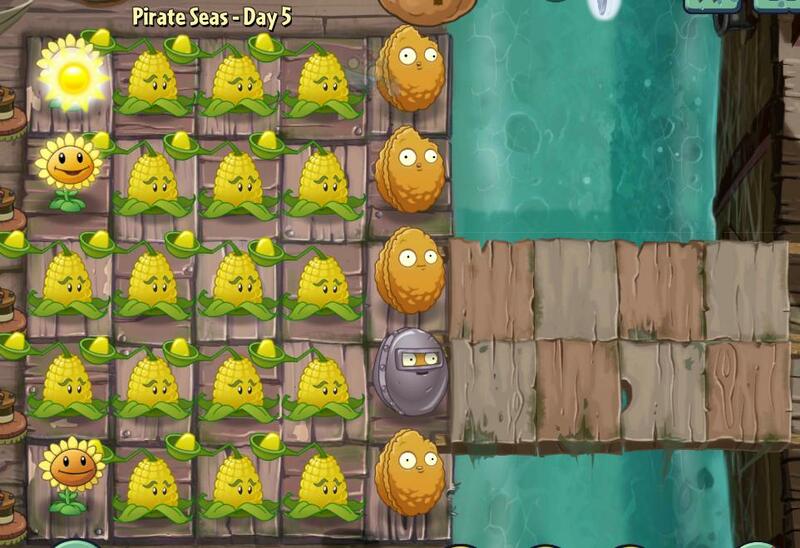 The last 50 sun can be used either for Potato Mines in front of the Wall-nuts on the top and bottom lane, or to plant a new Wall-nut in case you lose one. Use Iceberg Lettuces as often as you can on tougher zombies. The Snapdragons will unfreeze the zombies but you'll still save you Wall-nuts a couple of bites. Use on the Wall-nut in the mine cart. However save 2 pieces for the Snapdragons. You'll need them for the last wave. Use the "view" button to see where the zombies are coming from. Plant your first plants accordingly. ALL Bloomerangs should go in the mining carts. All Lightning Reeds should be planted on the 4 tiles between the mine carts. Buckethead zombies are your first priority. Always have at least 3 Bloomerangs attacking them. Start off with 1-2 Twin Sunflowers (plant them on the 3rd column). Plant a Wall-nut on the 6th tile of the lane where the first zombie appears. Immediately put a Snapdragon on the 2nd or 4th tile bind the Wall-nut. 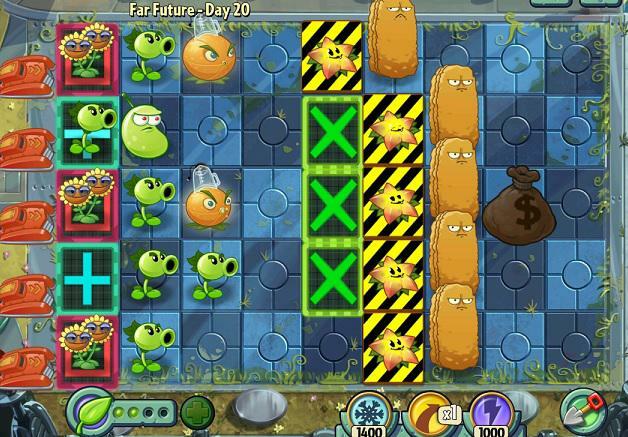 Plant another 1-2 Twin Sunflowers (max 5) Start planting Wall-nuts in front of the Snapdragons or wherever a tougher zombie appears. Plant Split Peas on the 4th column (behind the Snapdragons). 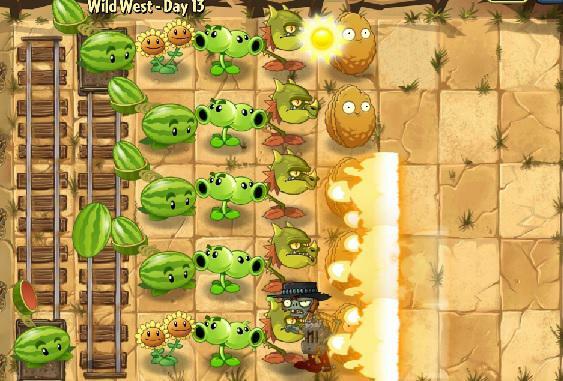 Once you have 2 Snapdragons (the fire should cover each lane) and 5 Split Peas plant a Melon-pult in the cart on the second tile. Move it around to stop tough zombies (Buckethead, Poncho zombie). Save up for another Melon-pult and plant it in the cart on the first tile. Make sure to move it out of the way of jumping Prospector zombies. Once you're full, start removing Twin Sunflowers one by one and replacing them with Melon-pults. Use Cherry Bombs to easily get rid of groups of tough zombies. Use Chili Beans on tough zombies instead of Cherry Bombs whenever possible. Use plant food on damaged Wall-nuts, Melon-pults or Snapdragons. Start off with 1-2 Twin Sunflowers. Plant the first Wall-nut on the 5th tile of the lane where the first zombie appears. Plant a Snapdragon in the mine cart behind. Plant another 1-2 Twin Sunflowers (max 5) Put another Snapdragon next to the cart on the 4th column. Begin planting Wall-nuts. The entire 5th column should be covered with them. Prioritize the lanes where tougher zombies approach. Plant a Repeater in the cart on the 3rd column. Use it to take down tougher zombies and win some time. Plant a Melon-pult in the cart on the 2nd column. Focus it on the tougher zombies (Poncho, Pianist zombie). Plant another 2 Repeaters at the top side of the 3rd column. Once all the tiles behind your Wall-nuts are occupied, start removing the Twin Sunflowers one by one and replace them with Melon-pults. Use Cherry Bombs on Pianist and Poncho zombies. Use Plant food on Melon-pults or Snapdragons. Start off with 1-2 Twin Sunflowers. Plant them on the ground of the 1st column. Put a Wall-nut on the 4th tile of the lane where the first zombie appears. Plant a Snapdragon on the 2nd or 4th tile of the 3rd column. Plant another 2 Twin Sunflowers, but this time on the ground of the 2nd column. Start planting Wall-nuts in front of the Snapdragons. Prioritize the lanes where tougher zombies are approaching. Save up for a Melon-pult and plant it on the bottom mine cart. Move it around to take down tough zombies. Plant another Melon-pult in the other mine cart. Instant plants count as a lost plant once they're activated (Cherry Bombs, Chili Beans, etc). If a Cherry Bomb is required to take down a tough zombie, make sure you make it count. 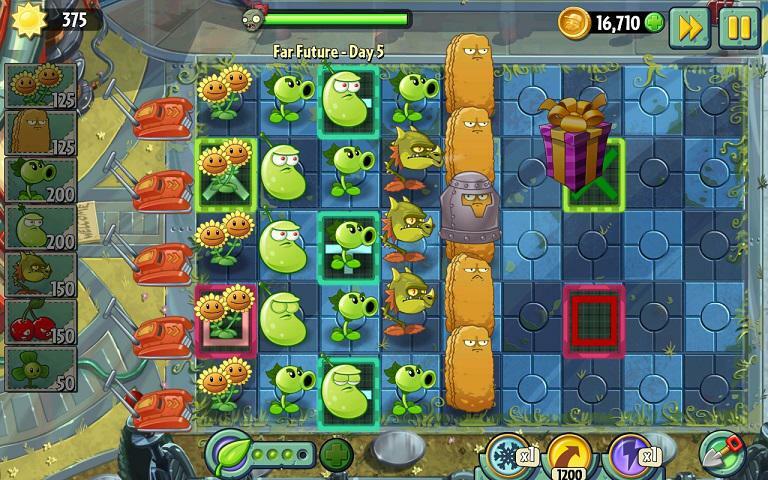 Considering you can't lose more than 2 plants, Pianist zombies are your worst enemy. Make sure to put a Stonespike in front of the Wall-nut wherever you see a Pianist zombie. You should have a Stonespike in front of each Wall-nut for the last wave. Use plant food on Melon-pults or Snapdragons. Start off with 1-2 Twin Sunflowers. Plant the first Wall-nut on the lane where the first zombie appears. Put a Snapdragon on the 2nd or 4th tile of the 4th column. The column behind it should be reserved for Split Peas. Plant another 1-2 Twin Sunflowers (max 5) Plant your next Snapdragon on the 2nd or 4th tile of the 4th column respectively. Start planting Wall-nuts in front of the Snapdragons. Prioritize the lanes where tougher zombies appear. Plant Split Peas on the 3rd column until it's full. Remember to pay attention to the Wall-nut in the mine cart that you're supposed to protect. Try to dodge as much damage as you can with it. Put Stonespikes in front of the Wall-nuts. Use Cherry Bombs and Chili Beans mainly against Poncho Zombies. Use plant food on the endangered Wall-nut to repair and improve it. 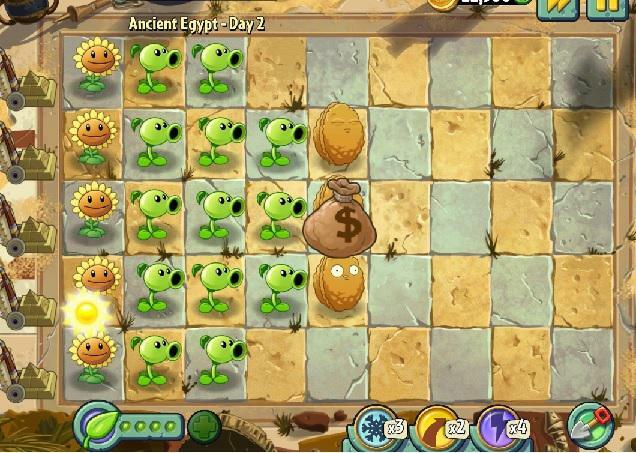 Start off with 2 Twin Sunflowers Plant the first Wall-nut in front of the flowers, on the lane where the first zombie is. Plant the first Snapdragon behind the Wall-nut on the 2nd bottom lane. Keep planting Twin Sunflowers until you have 5. In the meantime plant Wall-nuts and Snapdragons as quickly as possible. Put a Repeater in the mine cart on the second column. Use it to support lanes with tough zombies. Use Cherry Bombs and Chili Beans on Poncho and Buckethead zombies until you get all 5 Wall-nuts. Once you have at least 3 Snapdragons, start planting Repeaters on the back column. Plant until you have 1 on each lane. Put Stonespikes in front of the Wall-nuts. If a Wall-nut is heavily damaged and you don't have any plant food, dig it out and plant a new one. DO NOT wait for it to be destroyed as the zombies will get to the flowers very quickly. Use plant food on anything. Prospector zombies aren't a rarity in this level, so you'll need Split Peas. Plant 2 on the ground next to the mine cart on the 3rd lane and 3 next to the mine cart on the 4th. Plant 3 Snapdragons on the 3 middle lanes of the 5th column (in front of the last mine cart). Plant a Wall-nut in front each of the Snapdragons. On the top and bottom lanes, place the Wall-nuts next to the Snapdragons. This will give the zombies less time to reach and eat them up. You'll also see a lot of Zombie Chickens in this level. Plant a Lightning Reed in cart on the 3rd column. The remaining 50 sun can be kept in case a Wall-nut gets destroyed. Use plant food on the damaged Wall-nuts (especially on the side ones). Start off with 2 Sunflowers. DO NOT plant more. Plant a Wall-nut on the 5th tile of the lane where the first zombie is. Plant a Split Pea in the mine cart and use it to cover the lanes with no Wall-nuts. Plant a Snapdragon on the behind the Wall-nut on the second bottom lane. Keep planting Wall-nuts and Snapdragons as quickly as possible. Your first priority is to plant 2 Snapdragons which will cover the entire area. Once you've got a Wall-nut and a Snapdragon on each lane, put Spikeweed in front of the Wall-nuts. The remaining sun should be used for a couple of Split Peas behind the mine cart. Prospector zombies will be too many during the last couple of waves. Use plant food on damaged Wall-nuts and Snapdragons. 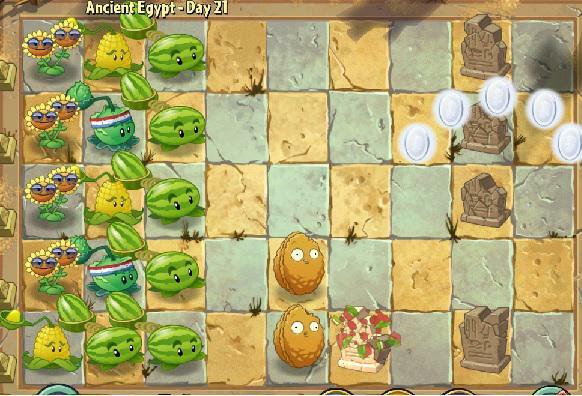 Plant the first Pea Shooter in the cart on the 2nd or 3rd tile. The Wall-nut should go in the cart on the 6th tile. Use it to block one of the two zombies. Save as much of its health points as possible. Put the Potato Mine on the 3rd of 4th tile and use it to get rid of the Buckethead zombie. Two zombies will be walking freely. Kill them as quickly as possible and move to the one that's eating your Wall-nut. Plant the Chili Bean in the cart on the 4th or 5th tile. Use it to kill the Conehead zombie and slow the other one down. The Repeater should go in the mine cart on the first tile. Focus on the two Buckethead zombies first. 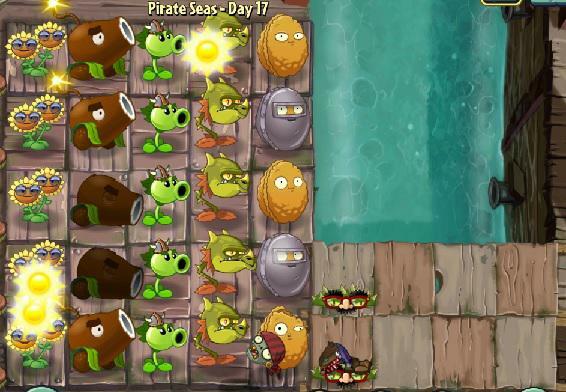 Once one of them is dead, move the Peashooter and kill the other zombies with it. The Repeater will take care of the damaged Conehead. Again, use the Potato Mine to get rid of the Buckethead zombie. Plant the Coconut Cannon as far behind as possible. Use it to defeat the Buckethead zombie. 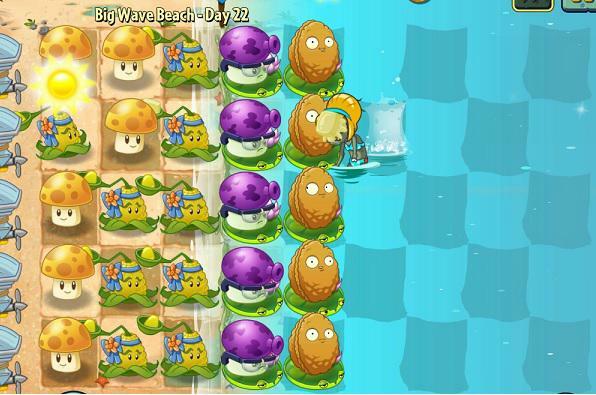 For the next wave use the Coconut Cannon in the middle lane, once all the zombies have shown up. Use the Coconut Cannon twice for this wave (on the Buckethead zombie). It should take care of the Chicken Wrangler as well but be prepared to move your Repeaters in order to kill any remaining chickens. Start off with 2 Sunflowers on the second tile. DO NOT PLANT any more. Plant the first Wall-nut in front of the flowers, on the lane where the first zombie appears. Plant a Split Pea in the mine cart at the bottom. Use it to deal with the first few zombies. Plant the Wall-nuts as quickly as possible. As long as you have 2 Split Peas in the mine carts, 1-2 Snapdragons will keep you safe. 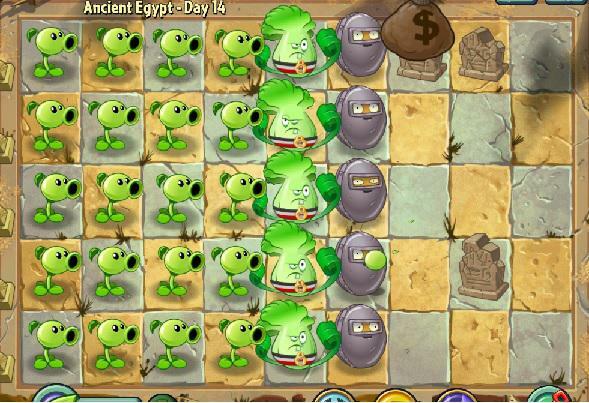 Once you have 3 Snapdragons and 5 Wall-nuts in front of them, plant Spikeweed in front of each Wall-nut. Use plant food on damaged Wall-nuts or Snapdragons. Start off with 3 Sunflowers. Plant a Repeater in the mine cart on the 1st tile. Plant another Sunflower and put Bloomerangs in the other 2 mine carts. Keep the middle lane protected and plant a Potato Mine on it. Once you have enough sun, remove the Repeater in the mine cart and replace it with a Winter Melon. Start removing your Sunflowers and replace them with Bloomerangs. You must have at least 1 Bloomerang on each lane to stop the chickens. Use Iceberg Lettuce to slow down Buckethead and Poncho zombies. It's ok to lose a couple of mowers. Use plant food constantly, whenever a zombie is about to eat an important plant. Use it mainly on your Winter Melon or on Potato Mines to immediately take down tough zombies. Start off with 1-2 Twin Sunflowers. Plant the first Wall-nut as soon as possible. Put it in front of the flowers , on the lane where the first zombie appears. Plant a Lightning Reed in the bottom mine cart on the 3rd column. Plant another 1-2 Twin Sunflowers (3 max). Plant a Snapdragon in the mine cart on the 4th tile. Keep planting Wall-nuts as fast as you can. Another 2 Lightning Reeds should be put on the ground on the 3rd column. The next plant should be a Melon-pult in the mine cart on the second column. Move it around to help out with the tougher zombies. 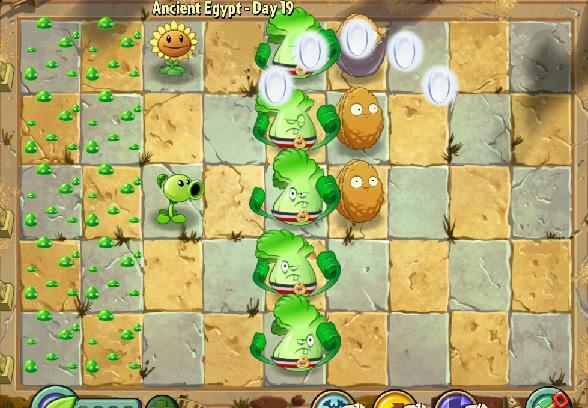 Plant another 2 Snapdragons behind the Wall-nuts on the bottom 2 tiles. Start planting Stonespikes until you have at least 1 in front of each Wall-nut. You'll need those for the Pianist zombies and zombie chickens. Lastly, you can fill up the empty tiles on the first column with more Melon-pults. Use plant food to repair damaged Wall-nuts and Melon-pults. Start off with 1-2 Twin Sunflowers. 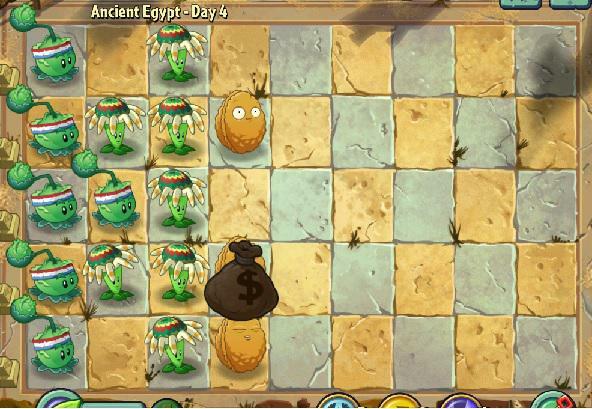 Plant the first Wall-nut on the 4th tile of the lane where the first zombie appears. Your first plant should be a Lightning Reed. Plant it in front of the flowers on the second bottom lane. Keep planting Twin Sunflowers until you have 5. Plant Wall-nuts and Snapdragons in the meantime. Start filling up the column in front of your Twin Sunflowers with Lightning Reeds. Once you have 5 Wall-nuts, start planting Spikerocks in front of them. Start removing the Twin Sunflowers one by one and replace them with Melon-pults. Avoid taking damage with the endangered Wall-nuts. 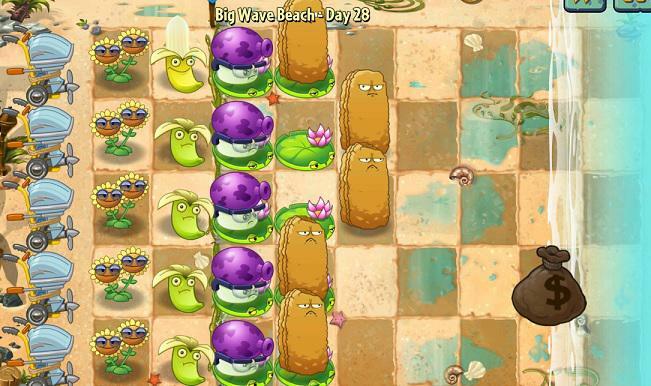 Use plant food to repair the endangered Wall-nuts and on Melon-pults during the last wave. 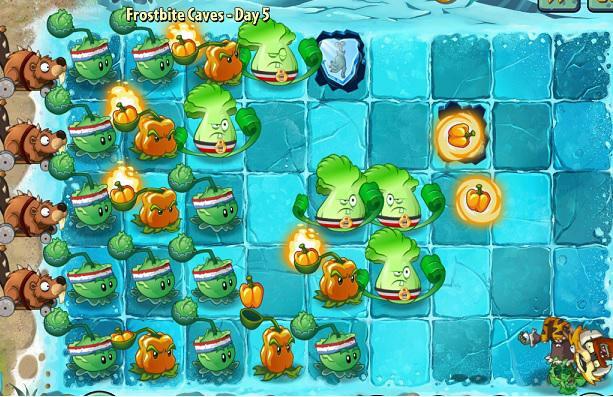 Occupy the 1st tile of each lane with Melon-pults and Winter Melons. 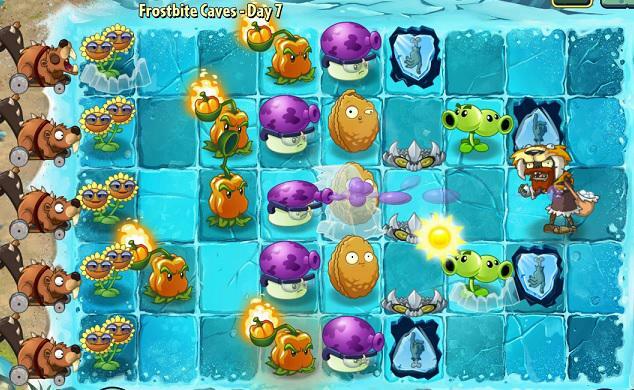 The first Melon-pult or Winter Melon should go in the mine cart on the 2nd tile. Put Split Peas and Lightning Reeds on the 3rd column. The mine cart on the 4th column should be reserved for a Pea Pod. Plant the Tall-nuts and lightning reeds on the 4th column. 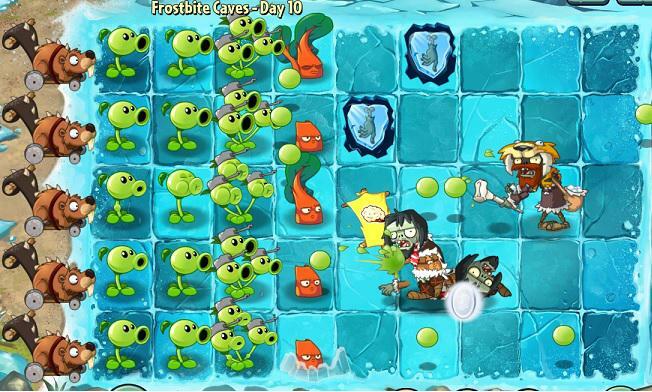 Use Plant food on Melon-pults and Winter Melons to take down huge groups of tough zombies or Gargantaurs. Start off with 2 Twin Sunflowers. Begin planting Tall-nuts on the 4th column. Focus on the unprotected lanes first. Keep planting Twin Sunflowers until you have 4-5. Plant 3 Snapdragons in the 3 middle lanes, behind the Tall-nuts. Plant a Repeater on the top and bottom tile, next to the Snapdragons. Put Melon-pults or Winter Melons on the second column. Use plant food on anything. Start off with 2 Twin Sunflowers. Put your first Tall-nut on the 5th tile of the lane where the first zombie appears. Plant a snap dragon to cover the lane as well. Plant another Twin Sunflower followed by another Tall-nut. Keep planting Snapdragons and Tall-nuts until you have 1 on each lane. In the meantime make, plant Repeaters or Laser Beans on the back tiles, on lanes that need support. It's good to have a Snapdragon, a Repeater and a Laser Bean on each lane. Use plant food on anything. Start with a Tall-nut on the 4th tile of the lane where the first zombie appears. Keep planting them until you have 1 on each lane. Plant the first Snapdragon on any of the 3 middle lanes. Once you have 3 Snapdragons on the middle lanes, put Repeaters next to them on the top and bottom tiles. Keep planting Repeaters and Laser Beans until you have at least one of each on each lane. You can use the falling sun to damage zombies. Be careful not to damage your own plants. Use plant food on anything. Start with a Tall-nut on the 5th tile of the lane where the first zombie appears. Keep planting them until you have 1 on each lane. Plant the first Snapdragon on any of the 3 middle lanes. Once you have 3 Snapdragons on the middle lanes, put Repeaters next to them on the top and bottom tiles. Keep planting Repeaters and Laser Beans until you have at least one of each on each lane. You can use the falling sun to damage zombies. Be careful not to damage your own plants. Use plant food on damaged Tall-nuts or on the plants on the power tiles. Start off with 3-4 Sunflowers. Plant the first Wall-nut on the 5th tile of the lane where the first zombie appears. Plant a Bong Choy behind it as well. Plant a total of 5 Sunflowers and keep putting Wall-nuts and Bong Choys on each lane. Slowly start planting Laser Beans behind. Prioritize the lanes which need the most support. Keep planting until you have 10 Laser Beans behind the Bong Choys. Use plant food on anything. Start off with 2 Twin Sunflowers. Plant the first Tall-nut on the 5th tile of the lane where the first zombie appears. Plant Snapdragon on the 2nd or 4th lane, depending on where the zombie is. Keep planting Twin Sunflowers and Tall-nuts until you have 5 of each. You should have a total of 3 Snapdragons on the 3 middle lanes behind your Tall-nuts. Use the first piece of plant food on the 2 Twin Sunflowers on the green tiles to quickly get lots of sun. The bottom and to tiles, next to the Snapdragons should be covered by Repeaters. Start planting Repeaters and Laser Beans on the back lines. 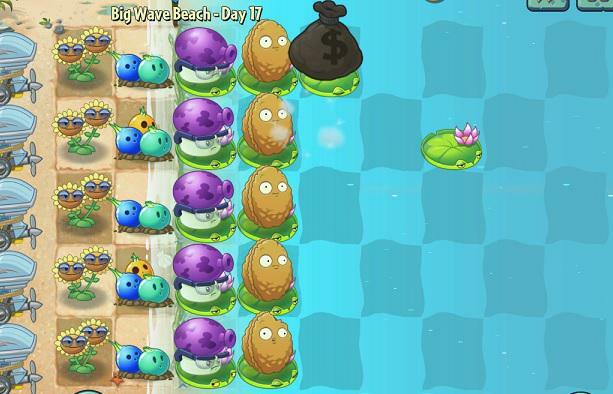 For the last wave, you can dig out the Twin Sunflowers and replace them with Citrons. Use plant food on anything. Plant the Citrons on the 1st tile of each lane. Snapdragons should go no further than the 4th tile. Laser Beans should be planted on the 3rd and 4th tile of each lane. Put Power Tiles on Laser Beans and Citrons. Make sure that each lane has at least one power tile. Use Blovers when big groups of zombies are about to eat up an important plant. Use plant food on Laser Beans, Citrons or Snapdragons. Use ONLY on power tiles, once you have enough. Start off with 2 Twin Sunflowers. Plant them on the 2 red power tiles on the first column. Plant the first Tall-nut on the 4th tile of the lane where the first zombie appears. Plant a Snapdragon on the orange tile where the first zombie appears. Plant another Twin Sunflower. Don't plant more than 3. Keep planting Tall-nuts on the 4th column until you have 5. 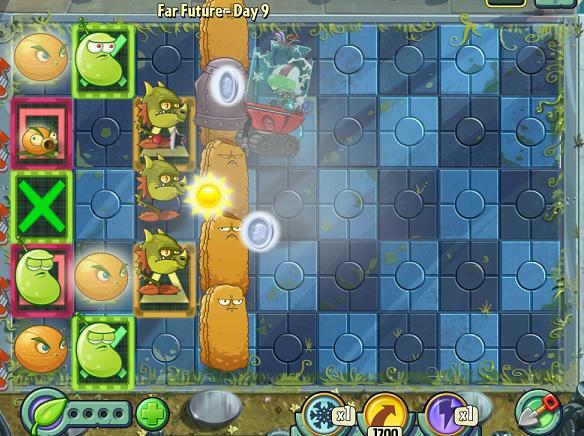 Plant Laser Beans on the 2 green Power Tiles on the 2nd tile. Plant a total of 3 Snapdragons on the 3 middle lanes, behind the Tall-nuts. Use the first piece of plant food you get on the 2 Twin Sunflowers on the red power tiles. DO NOT put anything else on the middle lane. The 3 Snapdragons are all attacking there. Start putting down Citrons. Once you've reached the 15 plants limit, start digging out the Twin Sunflowers one by one. Use plant food on anything. Start off with 2 Twin Sunflowers. Plant them on the 2 blue power tiles and use the first piece of plant food on them. Plant the first Tall-nut on the 5th tile of the lane where the first zombie appears. Plant a Snapdragon on the 2nd or 4th lane behind the Tall-nut. Plant another 1-2 Twin Sunflowers (5 max). Keep planting Tall-nuts as quickly as possible. A total of 3 Snapdragons should occupy the middle 3 lanes behind the Tall-nuts. Start planting Laser Beans. Prioritize the bottom and top lane first. Once you have at least 4 Laser Beans, start planting Citrons. Use E.M. Peaches mainly on Disco-trons. 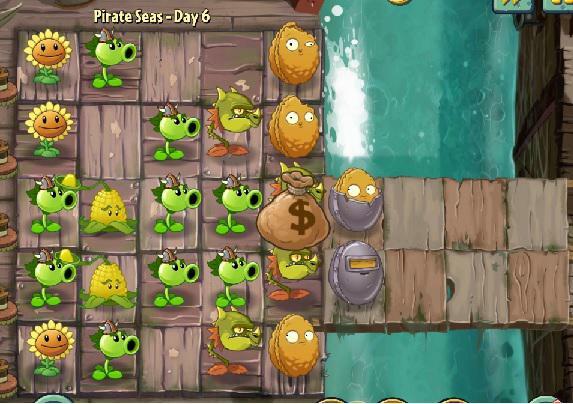 Use plant food on the Tall-nuts once they get damaged, on Twin Sunflowers in the beginning of the level and on Snapdragons during the last wave. Plants to take: Tall-nut, Snapdragon, Laser Bean, E.M. Peach. There will be 275 sun to spare. Use it either on E.M. Peaches or to plant new Wall-nuts in case you lose one. Use plant food on a heavily damaged Tall-nut (once you've run out of sun). Save 1 or 2 pieces for the last wave and use it on the middle Snapdragon. Start off with 2 Twin Sunflowers. Plant the first Tall-nut on the 5th tile of the lane where the first zombie appears. Plant a Snapdragon on the 2nd or 4th lane behind the Tall-nut. Wait until the first Jetpack zombie appears and plant a Repeater on the lane. Plant another 2-3 Twin Sunflowers (max 5). Use Cherry Bombs on any tough zombies in the very beginning (buckethead, conehead). 3 Snapdragons should be planted on the 3 middle lanes behind the Tall-nuts. 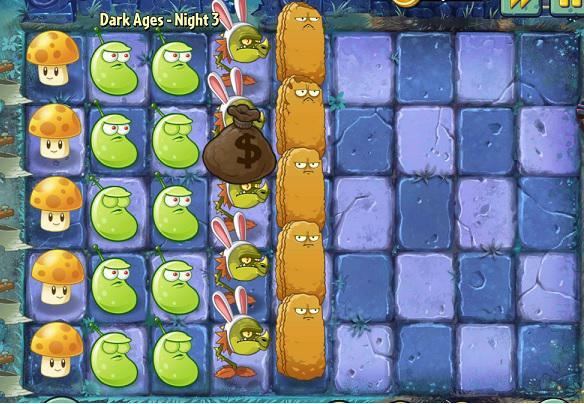 Once you have 5 Wall-nuts, 3 Snapdragons and 1 repeater on the top and bottom lane, Start planting Laser Beans as well. Once you're full, start removing the Twin Sunflowers one by one and replace them with Repeaters. DO NOT use plant food on Tall-nuts. Simply replace them once they get destroyed. Use E. M. Peach on Disco-trons, when they are in the Snapdragons' range. Use the first piece of plant food on the Sunflowers on the green or red power tiles. Reserve the rest for Gargantaurs. Use only 1 piece of plant food per Gargantaur. Start off with 2 Twin Sunflowers. 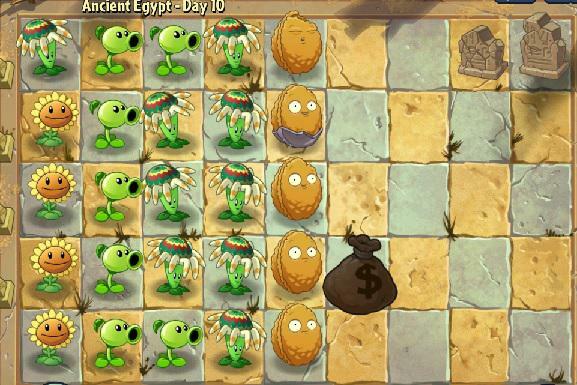 Plant the first Tall-nut on 5th tile of the lane where the first zombie appears. Plant a Snapdragon behind immediately. Plant another Twin Sunflower. Wait until the first Conehead zombie appears and put the second Tall-nut on the respective lane. Plant a Repeater behind it as well. Plant another 1-2 Twin Sunflowers (5 max). Put a Repeater on the top and bottom lane. Once you have 3 Snapdragons on the 3 middle lanes, save up for a Melon-pult or a Citron and plant it on the lane where the first Mecha-football zombie appears. Use the E. M. Peach on MEcha-football zombies, once they are in the Snapdragons' range. Once full, start removing Twin Sunflowers one by one and replace them with Melon-pults or Citrons. Use plant food ONLY on Mecha-football zombies. Start off with 1 Sunflower. DO NOT plant more. Plant an Infi-nut on the 4th tile of the lane where the first zombie appears. Plant a Snapdragon Behind it. Once you have 2 Snapdragons (4th and 2nd lane), plant a Repeater on the top and bottom lane. Plant Infi-nuts as fast as possible. Once you have 2 Repeaters on the top and bottom lane, 3 Snapdragons on the 3 middle lanes and 5 Infi-nuts plant another Repeater on the middle lane. Use plant food on anything. Start off with 2 Twin Sunflowers. Plant Tall-nuts and Infi-nuts in front of the endangered Citrons. Plant 1 Repeater on the second tile of the top and bottom lane. Keep planting Twin Sunflowers until you have 3-5. Plant a Snapdragon behind the endangered Citrons. Use plant food on it when Robo-Cone zombies appear. Plant a repeater behind each endangered Citron. For the last wave, make sure you have at least 2 Repeaters on the top and bottom lane with a Tall-nut or an Infi-nut in front of them. 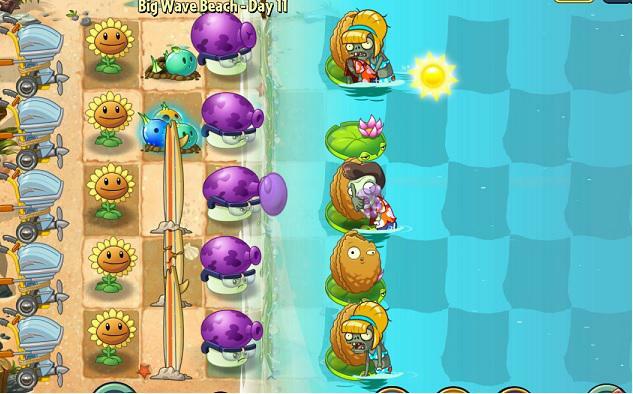 Use plant food on the Snapdragon on each wave of Robo-Cone zombies and on the Repeaters during the last wave. Put Citrons on the first column. Leave the second column free for when you have too many Citrons. Put Infi-nuts on the 4th tile of the empty lanes. Plant Spikeweed in front of them to take the first zombies down. Bong Choys go behind the Infi-nuts. Power tiles should be put on the top 4 Citrons on the first column. Use plant food ONLY on Mecha-Football zombies. Once you have 5 Bong Choys, save the rest. If a zombie is passing through, plant a Bong Choy to throw some punches from behind. Start off by digging out the Magnifying Grass. Plant 3 Twin Sunflowers on the orange power tiles. 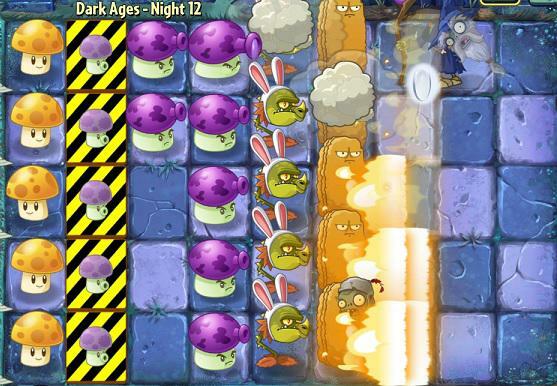 Start planting Magnifying Grass on the first column to take down any zombies. 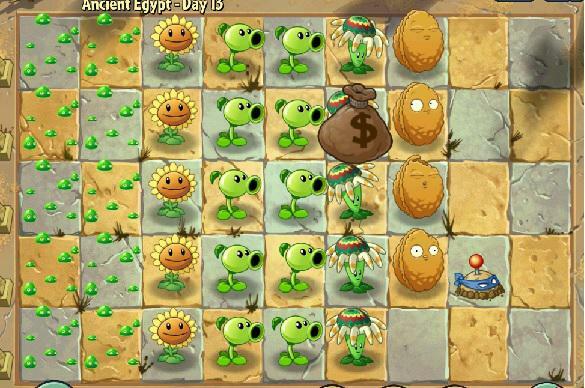 Plant until you have 5 Twin Sunflowers. 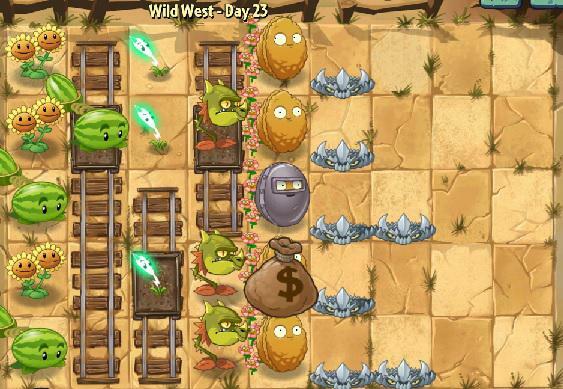 Use plant ONLY food on the Twin Sunflowers on the power tiles. Put Infi-nuts in front of the Sunflowers (optional). Plant Iceberg Lettuces in front of Infi-nuts for extra safety. Start off with 2 Twin Sunflowers. Plant the first Tall-nut on the 5th tile of the lane where the first zombie appears. Put a Snapdragon behind it. Plant another Twin Sunflower and then proceed planting Tall-nuts and Snapdragons. If you can't plant a Tall-nut and a zombie is about to pass, use an Infi-nut instead. You can replace it later on. Keep planting Twin Sunflowers. You'll need 5 on the 1st column and 3 at the 2nd. Put a Repeater on the bottom and top lanes for extra support. Once you have 5 Twin Sunflowers, start planting Magnifying Grass behind the Snapdragons. Make sure you have at least 5. 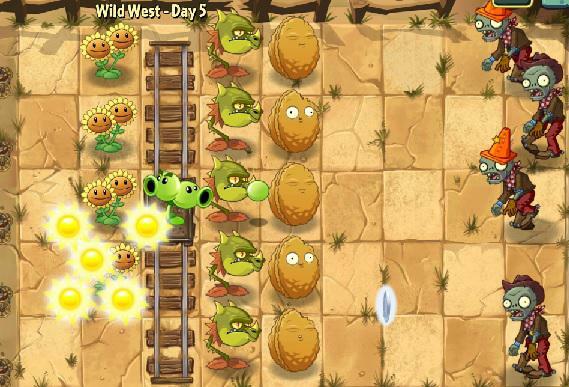 Use plant food on the Twin Sunflowers which are on the 2 power tiles at least once in order to complete the objective. You can use the rest as you please. Start off with Wall-nuts and Snapdragons behind them. Plant a Repeater behind each Snapdragon. Plant and use Magnifying Grass only when things are critical. Once you have the Repeaters on most lanes, plant a Magnifying Grass on each lane. Use them with caution, only on tough zombies. You can use the sun bombs to damage tougher groups of zombies. Be very careful not to damage your plants. Plant food should only be used on Magnifying Grass or Snapdragons in order to defeat Gargantaurs. Start off with 2 Twin Sunflowers. Plant them on the red power tiles. Plant the first Tall-nut in front of the middle Starfruit. Plant another Twin Sunflower on the 3rd red power tile. Use the first piece of plant food you get on them. Plant 3 Repeaters or Laser Beans in front of your Twin Sunflowers. Use E.M Peach on the first wave of Bug Bot Imps in order to gain some time to get rid of them. Keep planting Wall-nuts in front of each Starfruit. 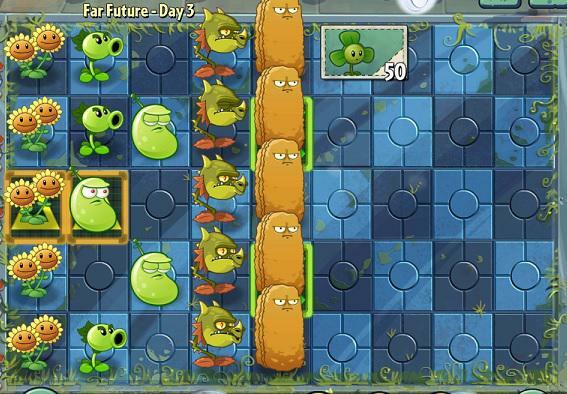 Once you have a Repeater or a Laser Bean on each tile of the 2nd column, plant Citrons in front or behind them. Use the rest of the plant food to get rid of zombies that are about to eat an endangered plant. Start off with 1-2 Twin Sunflowers. Plant them all on the red power tiles. 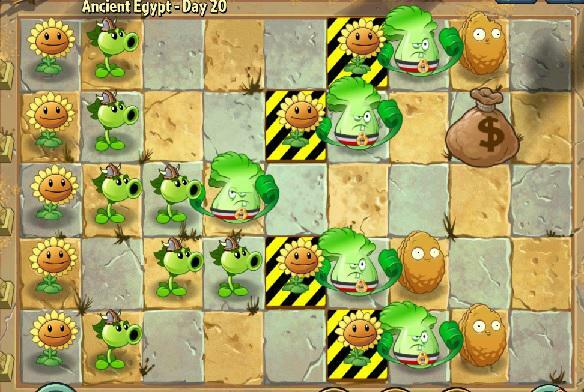 Plant the first Tall-nut in front of the power tiles, on the lane where the first zombie appears. Plant the first Snapdragon on the 2nd or 4th lane on the power tiles. Plant another 1-2 Twin Sunflowers (you'll need 4 total). The next Snapdragon should go on the empty 2nd or 4th lane, on the power tile. Keep planting until you have 5 Tall-nuts and 4 Snapdragons. Use 2 pieces of plant food on the Twin Sunflowers, for the 5000 sun objective. Once you have produced the required sun, dig out the Twin Sunflowers and start planting Citrons, on each lane. Put a Snapdragon on the red power tile in the middle lane as well. Use plant food on Twin Sunflowers and Snapdragons/Citrons. Plant Infi-nuts on the 3rd tile of each lane. Plant Snapdragons on the 3 middle lanes behind them. Everything else behind the Infi-nuts should be occupied by Laser Beans. Use plant food on anything but make sure you save 2 pieces for the Gargantaur. Start off with 2 Sunflowers. DO NOT plant more. 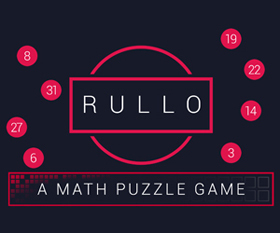 Plant the first Snapdragon on the 3rd tile of the lane where the first zombie appears. Plant an Infi-nut in front of it. Keep planting Snapdragons on the 3rd column until you have one on each of the 3 middle lanes. One Infi-nut should be planted on each tile of the 4th column. 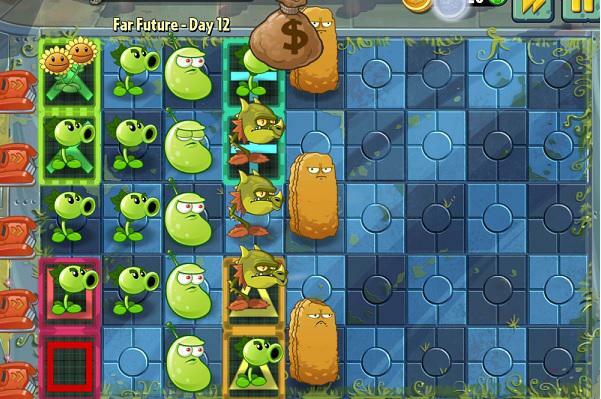 Plant a Laser Bean on each tile of the 2nd column. 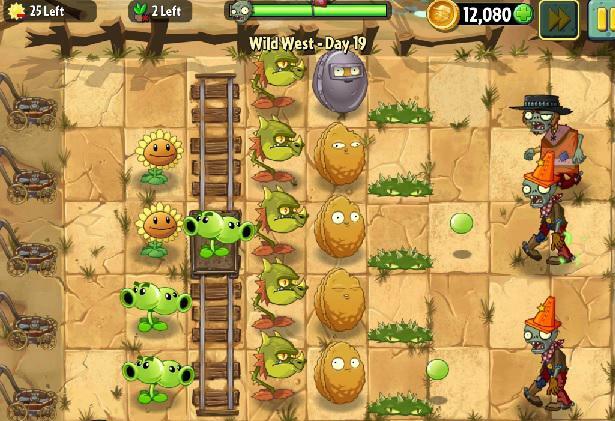 Make sure that you remove the Sunflowers at the end to avoid extending the 16 plants limit. Use plant food on anything. Start off with a Wall-nut on the 4th tile of the lane where the first zombie appears. Plant a Snapdragon behind it. Keep planting Snapdragons and Wall-nuts until you have 5 of each. Occupy the 2nd column with Laser Beans. Lastly, plant Citrons on lanes with Mecha-Football Zombies. 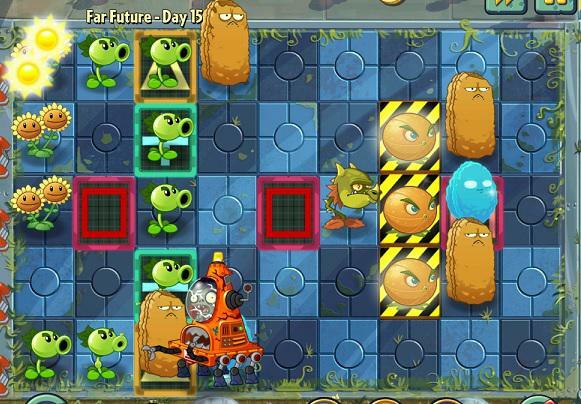 Use plant food and E.M Peaches to take down Mecha-Football Zombies. Plant Citrons on the 1st tile of each column. 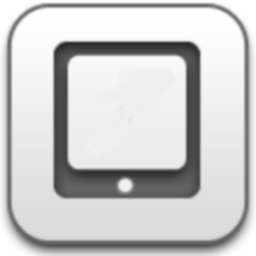 Infi-nuts should be placed on the 4th or 5th tile. Laser Beans can be planted anywhere. Put power tiles on different columns. Make sure to have a power tile on each lane. Use plant food on the Citrons or Laser Beans on the power tiles. Start off with 4 Sun-shrooms. Use the Grave Buster on the tombstones to quickly acquire sun. Plant the first Tall-nut on the 4th tile of the lane where the first zombie appears. Put a Snapdragon on the 3rd tile of the 2nd or 4th lane. Plant another Sun-shroom. Keep planting Snapdragons and Tall-nuts until you have 5 of each. The 2nd column should be occupied with Laser Beans. Use plant food on anything. Start off with 4 Sun-shrooms. Use the Grave Buster on the tombstones to quickly acquire sun. Plant the first Tall-nut on the 5th tile of the lane where the first zombie is. Plant a Snapdragon Behind it. Keep planting Sun-shrooms until you have 10 max. Use Puff-shrooms to support the empty lanes. You should have a total of 5 Tall-nuts and 5 Snapdragons. The column behind the Snapdragons should be occupied with Laser Beans. Once you're full on plants behind the Tall-nuts, start removing the Sun-shrooms and replace them with more Laser Beans. Use plant food on anything. Start off with 4 Sun-shrooms. Use the Grave Buster on the tombstones to quickly acquire some plant food. 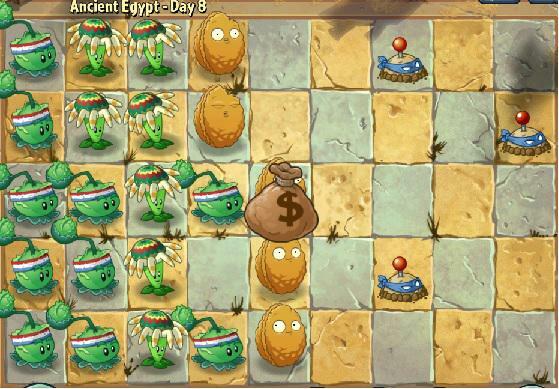 Plant the first Tall-nut on the 5th tile of the lane where the first zombie is. Plant a Snapdragon Behind it. Keep planting Sun-shrooms until you have 10 max. Use Puff-shrooms to support the empty lanes. You should have a total of 5 Tall-nuts and 5 Snapdragons. The column behind the Snapdragons should be occupied with Laser Beans. Once you're full on plants behind the Tall-nuts, start removing the Sun-shrooms and replace them with more Laser Beans. Use plant food on anything. Plant Cabbage-pults on the 1st column. Use Puff-shrooms on the easy empty lanes. Use Hypno shroom on Buckethead zombies. Make sure that the zombie gets close to your plants first. Save the Grave Busters for tomb stones with plant food or ones that are too close to your plants. Use plant food on anything. Start off with 4 Sun-shrooms. Use the Grave Buster on the tombstones to quickly acquire some sun. 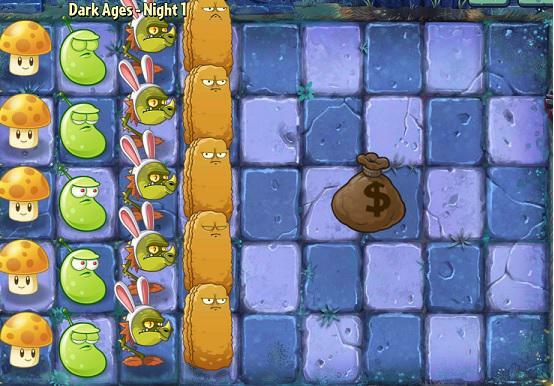 Plant the first Tall-nut on the 5th tile of the lane where the first zombie is. Plant a Snapdragon Behind it. Keep planting Sun-shrooms until you have 10 max. Use Puff-shrooms to support the empty lanes. You should have a total of 5 Tall-nuts and 5 Snapdragons. The column behind the Snapdragons should be occupied with Fume-shrooms. Once you're full on plants behind the Tall-nuts, start removing the Sun-shrooms and replace them with more Fume-shrooms. You can plant Spikerocks in front of the Tall-nuts once you're full. Use plant food on anything. Plant 5 Fume-shrooms on the 2nd column. Put a Snapdragon on the 3rd tile of the 3 middle lanes. Plant 3 Tall-nuts in front of the Snapdragons and 2 in front of the Fume-shrooms. Plant another Fume-shroom on the 1st top and bottom tile. Use plant food on anything. Start off with 4 Sun-shrooms. 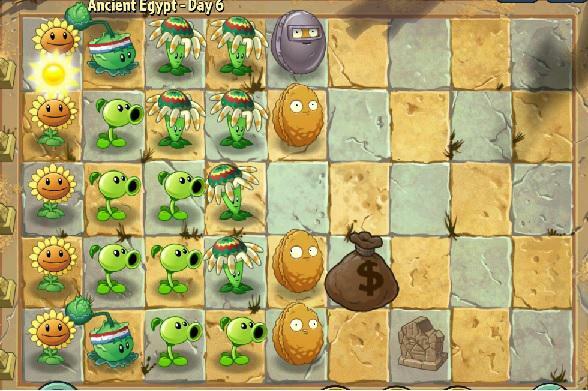 Plant the first Tall-nut on the 5th tile of the lane where the first zombie is. Plant a Snapdragon Behind it. Keep planting Sun-shrooms until you have 10 max. Use Puff-shrooms to support the empty lanes. 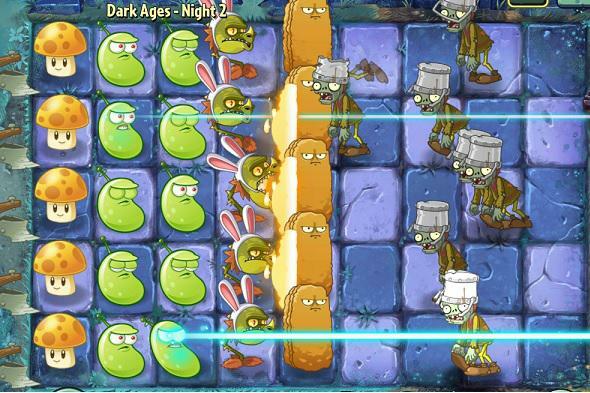 Use Sun Beans on tough zombies (Buckethead, Knight zombie). You should have a total of 5 Tall-nuts and 5 Snapdragons. The column behind the Snapdragons should be occupied with Fume-shrooms. Once you're full on plants behind the Tall-nuts, start removing the Sun-shrooms and replace them with more Fume-shrooms. Use plant food on anything. Start off with 4-5 Sun-shrooms (max 5). Use the Grave Buster as soon as it goes off cooldown. Start planting Fume-shrooms on the 2nd and 3rd column. Plant Wall-nuts in front of them. Use Sun Beans on tough zombies for extra sun. Use Hypno-shrooms on Knight zombies or any other zombies that you can't stop. Use plant food on anything. Start off with 4 Sun-shrooms. Plant 1-2 Puff-shrooms on the lane where the first zombie appears. Plant the first Tall-nut on the 5th tile of the 4th or 2nd lane. Plant a Snapdragon behind it. Keep planting Sun-shrooms until you have 10 max. Use Puff-shrooms to support the empty lanes when you don't have enough sun. You should have a total of 5 Tall-nuts and 5 Snapdragons. The column behind the Snapdragons should be occupied with Fume-shrooms. Once you're full on plants behind the Tall-nuts, start removing the Sun-shrooms and replace them with more Fume-shrooms. 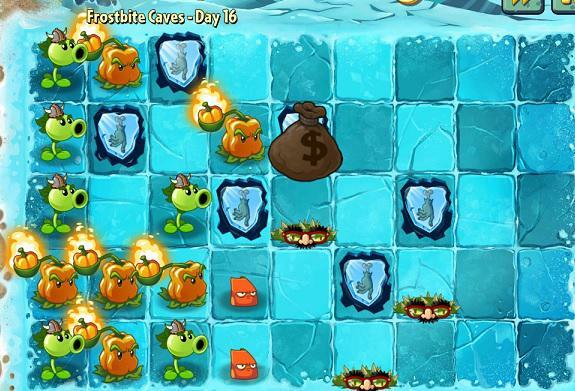 Use plant food and Chili Beans in the beginning of the level to stop tough or boosted zombies. Plant Wall-nuts on the 4th tile of each lane. Put Fume-shrooms on the 2 columns behind it. Use Puff-shrooms on the lanes that support quickly. 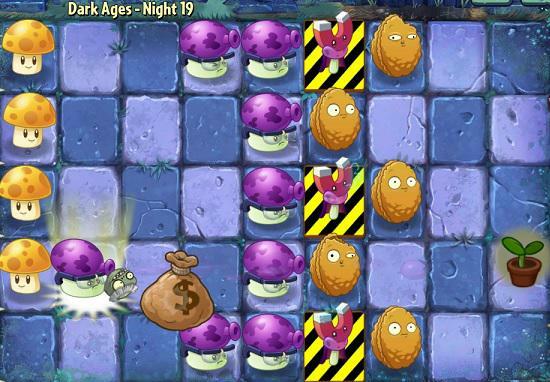 Use Potato Mines in front of the Wall-nuts to take down any zombies that you won't be able to stop. Use plant food on Fume-shrooms. Start off with 4 Sun-shrooms. Use the Grave Buster as soon as possible. Plant the first Tall-nut on the 5th tile of the 4th or 2nd lane. Plant a Snapdragon behind it. Keep planting Sun-shrooms until you have 10 max. Use Puff-shrooms to support the empty lanes when you don't have enough sun. You should have a total of 5 Tall-nuts and 5 Snapdragons. The column behind the Snapdragons should be occupied with Fume-shrooms. Once you're full on plants behind the Tall-nuts, start removing the Sun-shrooms and replace them with more Fume-shrooms. 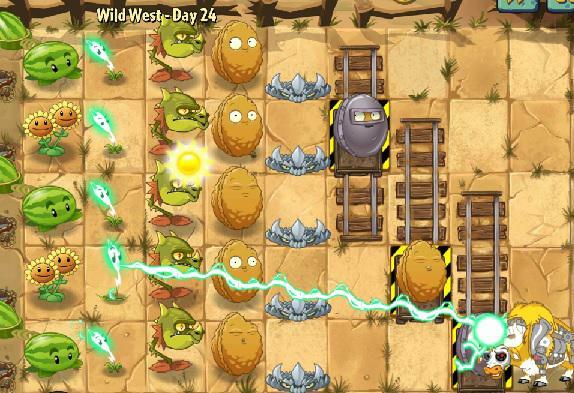 Use plant food and Cherry Bombs to take down the annoying Wizard Zombies. Start off with 4 Sun-shrooms. Use the Grave Buster as soon as possible. Plant the first Tall-nut on the 5th or 6th tile of the 4th or 2nd lane. Plant a Snapdragon behind it. Keep planting Sun-shrooms until you have 10 max. Use Puff-shrooms to support the empty lanes when you don't have enough sun. You should have a total of 5 Tall-nuts and 5 Snapdragons. The column behind the Snapdragons should be occupied with Fume-shrooms. Make sure you always have at least 1 piece of plant food for the endangered Puff-shrooms. Use plant food and Cherry Bombs on Wizard Zombies. Plant Fume-shrooms on the 2nd and 3rd column. Put the Pea-nuts on the 4th and 5th column (2 per each lane). Use Puff-shrooms to support the empty lanes early on. 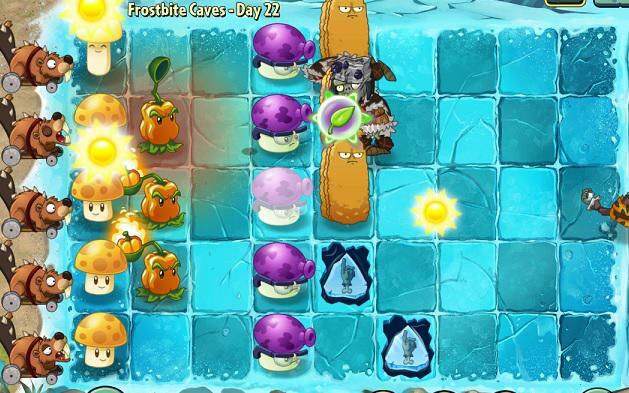 Save at least 2-3 pieces of plant food for the last wave and use it to take down the Wizard Zombies. Start off with Puff-shrooms. Plant a couple behind to start taking down the grave stones. Use the Grave Buster as soon as possible. Fume-shrooms attack the 3 lanes in front of them. Make sure that the first one covers as many grave stones as possible. Tall-nuts should be planted on the 3rd or 4th column. Snapdragons should go behind them. Make sure to bring the Cherry Bomb and use it to take down Wizard Zombies. Use plant food on Wizard Zombie and on the Gargantaur. Plant a Tall-nut on the 4th tile of each lane. Put 3 Snapdragons on the 3 middle lane behind the Tall-nuts. Plant a Fume-shroom on each tile of the 2nd column. The top and bottom tiles, next to the Snapdragons should be occupied with Fume-shrooms. 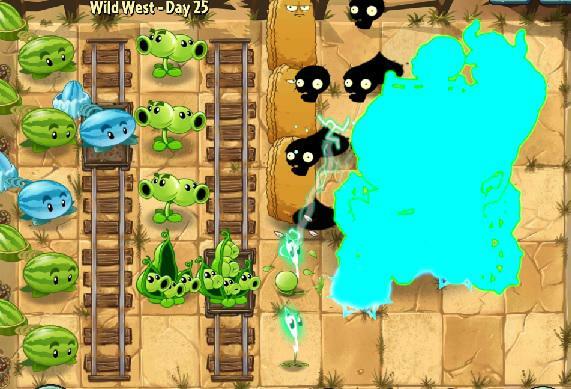 Use plant food and Cherry bomb to get rid of Wizard Zombies. Start off with 4 Sun-shrooms (5 max). Use Puff-shrooms to support the empty lanes until you have enough sun. Plant the first Tall-nut on the 5th or 6th tile of the 4th or 2nd lane. Plant a Snapdragon behind it. Use Puff-shrooms to support the empty lanes when you don't have enough sun. You should have a total of 5 Tall-nuts and 5 Snapdragons. The column behind the Snapdragons should be occupied with Fume-shrooms. 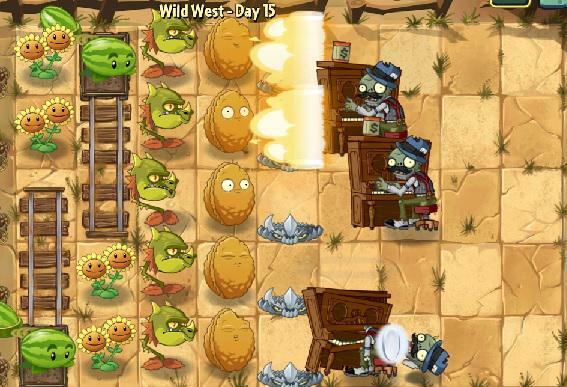 Use plant food and Cherry Bombs on Wizard Zombies and Zombie Kings. Start off with 4-5 Sun-shrooms. Use the Grave Buster as soon as possible for extra sun. Plant the first Fume-shroom on the 2nd tile of the lane where the first zombie appears. Plant the first Tall-nut on the 4th tile of the lane where the first tough zombie appears (Conehead, Buckethead). Put Snapdragons on the 3 middle lanes behind the Tall-nuts. Once you're full on plants and have about 1000 sun, start replacing the Sun-shrooms with Fume-shrooms. 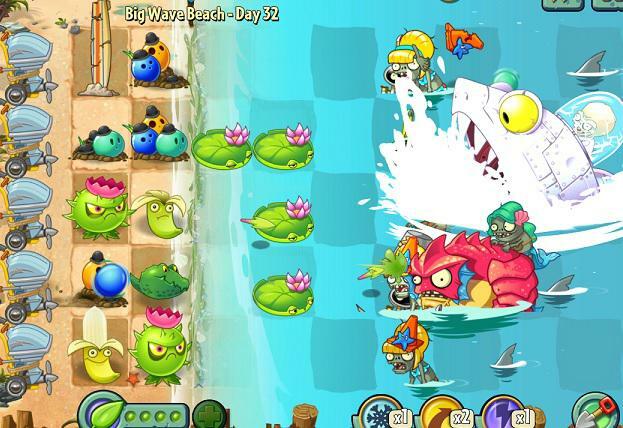 Use plant food and Cherry Bombs on Wizards, King zombies and 1 on the Ganrgantaur during the last wave. Start off with 2-3 Sun-shrooms (5 max). 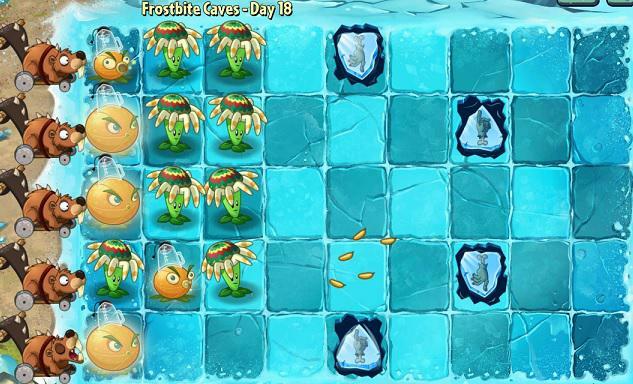 Use Iceberg Lettuce whenever it's off cooldown, to win some time. Start planting Fume-shrooms. The first one should go on the 3rd tile of the lane where the first zombie is. 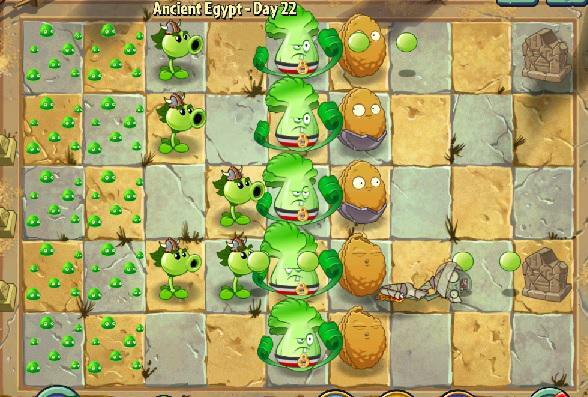 Plant Pea-nuts on the 4th and 5th tile whenever they aren't on cooldown. The 2nd and 3rd column should be occupied with Fume-shrooms. 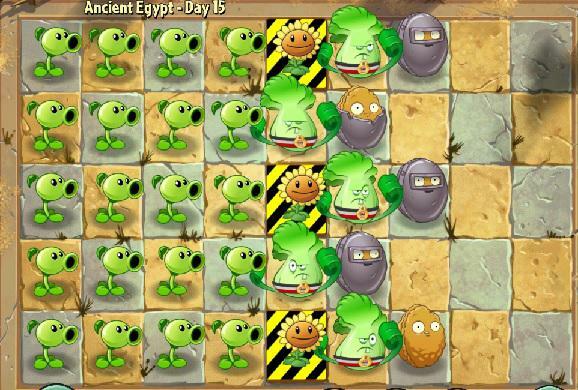 Once you have a Pea-nut on each lane, plant a second column in front. 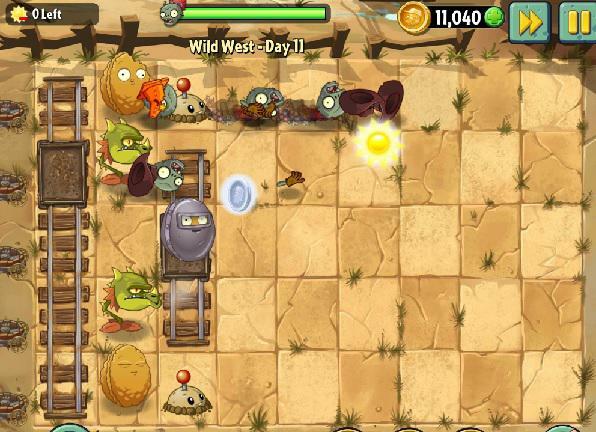 Use plant food to get rid of Wizard and King zombies. Take Wall-nuts instead of Tall-nuts. You'll need protection as soon as possible. Start off with 2-3 Sun-shrooms. Use the Grave Buster as soon as possible to acquire enough sun for a Fume-shroom. Use Puff-shrooms until you have Wall-nuts or Fume-shrooms on each lane. Plant the Fume-shrooms behind the endangered plants. Always use the Grave Buster on the grave stones for extra sun. 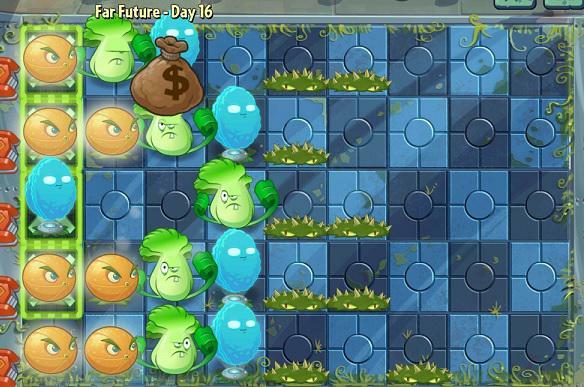 Use plant food and Cherry Bombs to get rid of Wizard Zombies. Save 1-2 pieces for the last wave. Plant Fume-shrooms on the back lines. Kernel-pults should go on the first tile of each lane. Be patient with Gargantaurs. Most of them get killed by the dragon eventually. Use plant food on anything. Start off with 1-2 Twin Sunflowers. Plant the first Tall-nut on the 5th tile of the lane where the first zombie appears. Don't forget the Lily Pad. Plant a Snapdragon behind it. Put a Fume-shroom on the third tile of the lanes which the Snapdragon isn't covering. Plant another 2-3 Twin Sunflowers (max 5). Put Tall-nuts on lanes with Conehead zombies. The 2nd and 3rd column should be occupied by Fume-shrooms, followed by Snapdragons and Tall-nuts. Use plant food on anything. Start off with 1-2 Twin Sunflowers. Plant the first Tall-nut on the 5th tile of the lane where the first zombie appears. Don't forget the Lily Pad. Plant a Snapdragon behind it. Put a Fume-shroom on the third tile of the lanes which the Snapdragon isn't covering. Keep planting Twin Sunflowers until you have 5 max. Put Tall-nuts on lanes with Conehead and Buckethead zombies. The 2nd and 3rd column should be occupied by Fume-shrooms, followed by Snapdragons and Tall-nuts. Use plant food on anything. PlantRepeaters on the 1st column. Peashooters should go on the second one. The first Chompers on the 3rd column. Once its full, start planting on the 4th as well. There will be more Buckethead zombies than Chompers in the beginning. However, 1 Repeater and 1 Pea Shooter can take them down if planted on time. Use plant food on Chompers to get rid of big groups of tough zombies. Start off with 1-2 Twin Sunflowers. Plant the first Tall-nut on the 5th tile of the lane where the first zombie appears. Don't forget the Lily Pad. Plant a Snapdragon behind it. Put a Fume-shroom on the third tile of the lanes which the Snapdragon isn't covering. Keep planting Twin Sunflowers until you have 5 max. Put Tall-nuts on lanes with Conehead and Buckethead zombies. The 2nd and 3rd column should be occupied by Fume-shrooms, followed by Snapdragons and Tall-nuts. Once everything behind the Tall-nuts is full, save up 600-700 sun and start replacing the Twin Sunflowers with Fume-shrooms or any other long-ranged plant you have. Use plant food on anything. All Buckethead zombies should be taken down with Tangle Kelps until there is a Wall-nut on the lane. Plant 2 Peashooters on each lane. Plant the first ones on lanes with Conehead zombies. Save up your Tangle Kelps for the Buckethead zombies which will start coming in huge numbers. If zombies are about to break through your plants, make sure to use a mower to avoid losses. 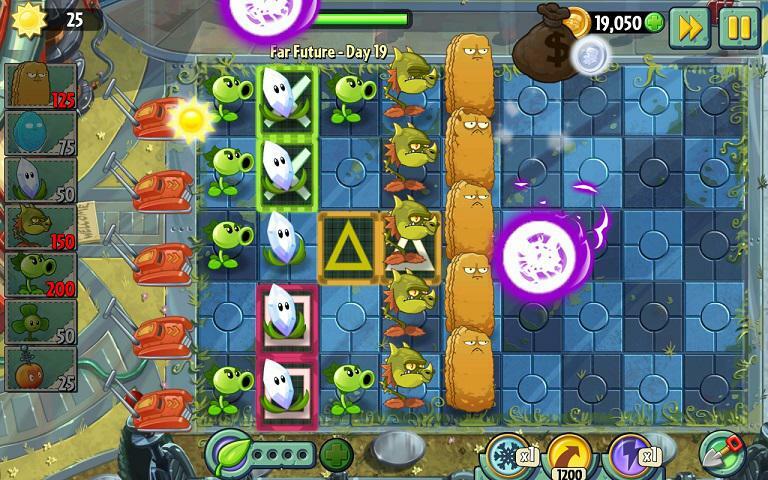 Use plant food on Peashooters when a lane is crowded and on Tangle Kelps when too many tough zombies are approaching. Start off with 2-3 Sunflowers. Plant the first Tall-nut on the 5th tile of the lane where the first zombie appears. Don't forget the Lily Pad. Plant a Snapdragon behind it. Put a Fume-shroom on the third tile of the lanes which the Snapdragon isn't covering. Keep planting Sunflowers until you have 5 max. Put Tall-nuts on lanes with Conehead and Buckethead zombies. The 2nd and 3rd column should be occupied by Fume-shrooms, followed by Snapdragons and Tall-nuts. Once everything behind the Tall-nuts is full, save up 600-700 sun and start replacing the Sunflowers with Fume-shrooms or any other long-ranged plant you have. Use plant food on anything. Start off with 1-2 Twin Sunflowers. Plant the first Tall-nut on the 4th tile of the lane where the first zombie appears. Plant a Snapdragon behind it. Put a Fume-shroom on the third tile of the lanes which the Snapdragon isn't covering. Start putting Lily Pads below each plant. Be as quick as possible if you don't want to lose half your plants. Keep planting Twin Sunflowers until you have 5 max. Put Tall-nuts on lanes with Conehead and Buckethead zombies. The 2nd column should be occupied by Fume-shrooms, followed by Snapdragons and Tall-nuts. Once everything behind the Tall-nuts is full, save up 600-700 sun and start replacing the Twin Sunflowers with Fume-shrooms or any other long-ranged plants you have. Use Tangle Kelps to take down zombies you can't stop. Use plant food on anything. General tip: try to have a decent number of zombies on your screen. This will help the bulbs bounce off more. The larger the bulb, the more damage it deals. Light blue bulbs - use mainly on weak zombies. Blue and orange bulbs - use on anything. Charged bulbs should be used on big groups of zombies or on Buckethead zombies and Gargantaurs. Use Sun-shrooms as a source of sun. Start by planting 3 of them. Plant a Snapdragon on the third tile of the 2nd or 4th lane. Since two zombies approach, use a Tangle Kelp on the second one. Plant a second Snapdragon. These two should cover all the lanes. Plant until you have a total of 5 Sun-shrooms. Start planting Fume-shrooms behind the Snapdragons and Tall-nuts in front of them. Use Tangle Kelps to get rid of the Snorkel Zombies before they get to your plants "underwater". Use a Cherry Bomb to take down groups of tough zombies. Use plant food on Sun-shrooms or Snapdragons. Don't put plants on lanes that are still empty. Try to have at least 1 Bowling Bulb on each lane (preferably on the 1st tile.) Save your Tangle Kelps only for Buckethead zombies that you cannot kill. 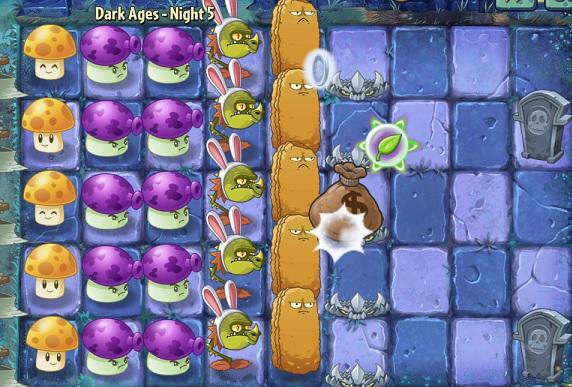 Use plant food on Bowling Bulbs when multiple tough zombies appear. Start off with 3 Sunflowers. Plant a Fume-shroom on the third tile of the lanes where the first two zombies appear. If you're short on sun, use a Tangle Kelp on the second zombie. Plant another 2 Sunflowers (5 max). Plant at least 1 Fume-shroom or Bowling Bulb on each lane as quickly as possible. Put the Wall-nuts on the 3rd column. Use Tangle Kelps on Snorkel Zombies and Surfer Zombies. 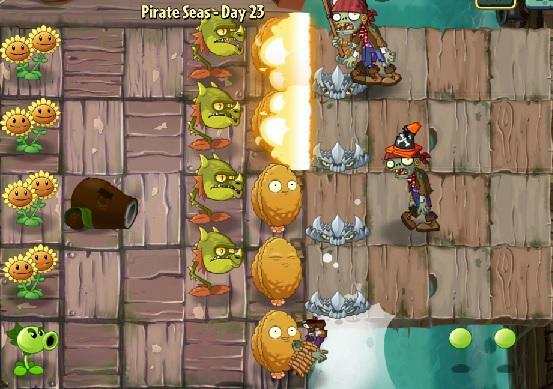 Use plant food on Bowling Bulbs when 3 or more Surfer Zombies are approaching. Put 5 Wall-nuts on the 3rd column. Plant 5 Fume-shrooms behind the Wall-nuts. Plant 3 Bowling Bulbs on the 1st tile of the 3 middle lanes. Replace any Wall-nut that you lose. Use Tangle Kelps on Surfer Zobmbies that you won't be able to stop. 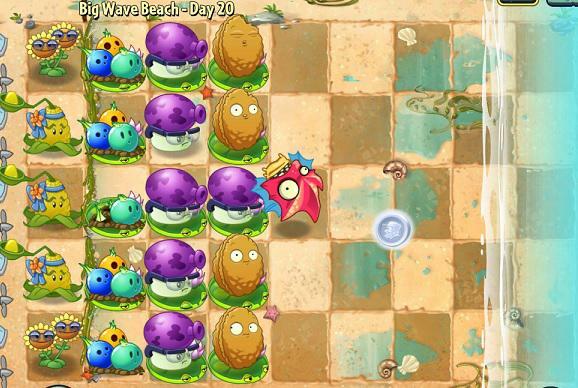 Use plant food on the Bowling Bulbs/Fume-shrooms during the last wave to stop the Surfer zombies. Start planting Twin Sunflowers as soon as possible. Plant 5 total. 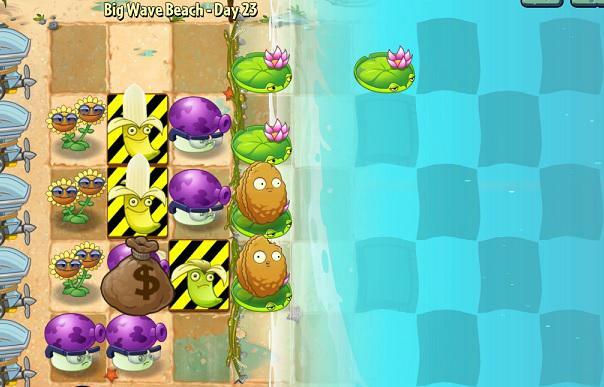 While planting the Twin Sunflowers, use Tengle Kelps to stop incoming zombies. Put them in front of the zombies, instead of on top of them. Plant a Fume-shroom in front of the Twin Sunflower, on the lane where a walking zombie appears. 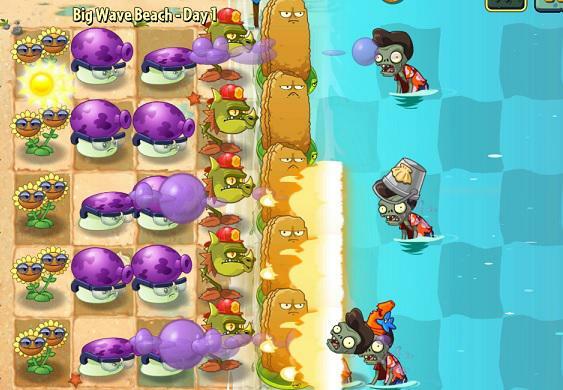 Use a Cherry Bomb during the next wave to stop multiple zombies. Use Chili Bean when you don't have a Tengle Kelp or a Cherry Bomb. Once you have about 1600-1700 sun produced, remove one of the Twin Sunflowers and the Lily Pad it's on. Plant and remove Wall-nuts. Use them as a temporary solution to tougher zombies. 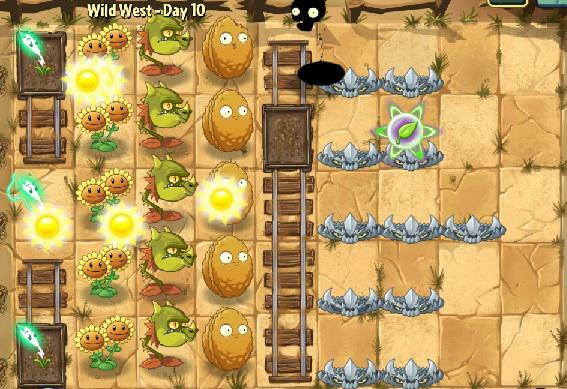 Once you've produced 2500 sun, remove all Twin Sunflowers and replace them with Wall-nuts or Fume-shrooms. Remember to pay attention to the number of plants you have left. Remove all unnecessary Lily Pads. It's ok to lose a mower, it's a very hard level. Start off with 5 Sunflowers. Use the Tangle Kelp to stop the first zombie. Once you have 5 Sunflowers, start putting down Lily Pads for the Wall-nuts and Chompers. Keep planting Sunflowers on the 2nd column. Save some tiles for Bowling Bulbs. Make sure to have a Chomper or a Bowling Bulb on each lane as fast as possible. Put Wall-nuts on empty lanes or on lanes with multiple zombies. Once you have a Chomper or a Bowling Bulb, covered by a Wall-nut, start removing the Sunflowers and replace them with Bowling Bulbs. Use the Tangle Kelp constantly. Use plant food in the early stages. 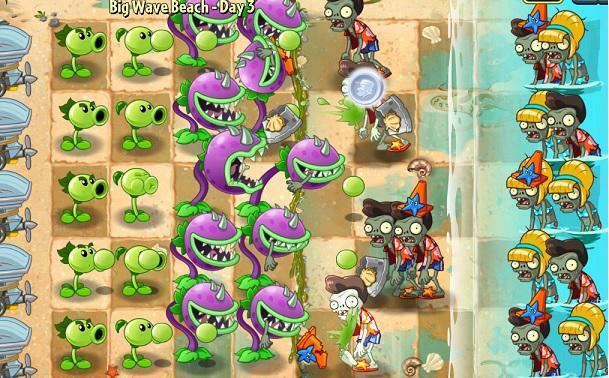 Try not to let any Surfer zombies get to your plants, as it can get very problematic. Save two pieces of plant food for the Gargantaur during the last wave. Use it on a Bowling Bulb. Start off with 4-5 Twin Sunflowers. Use Tangle Kelps for the first few zombies. 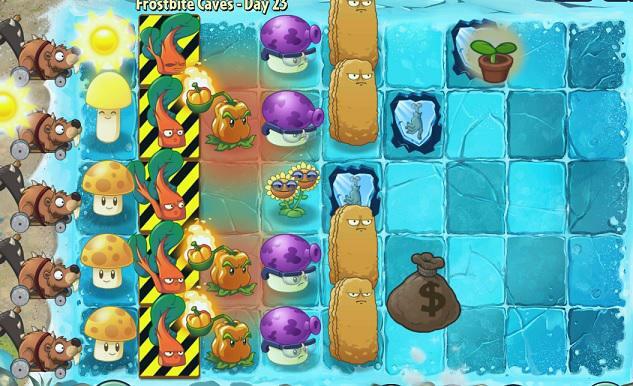 Once you have 4 or 5 Twin Sunflowers, start putting down Fume-shrooms in front of the Potato Mines. Don't forget the Lily Pads. Plant the first Wall-nuts in front of the Fume-shrooms, on lanes with Conehead or Buckethead zombies. 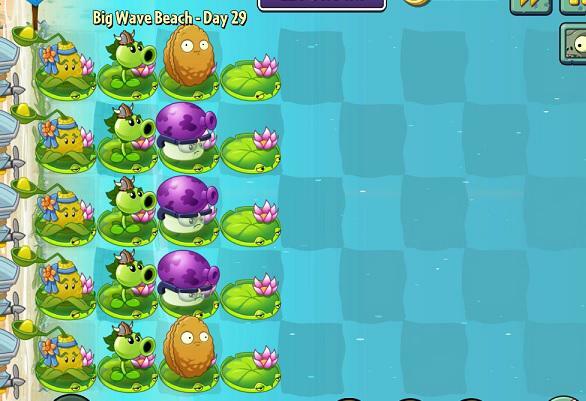 Use a Cherry Bomb on a Lily Pad to stop multiple Surfer zombies. Be very careful with them as they can easily surf their way to the Potato Mines. 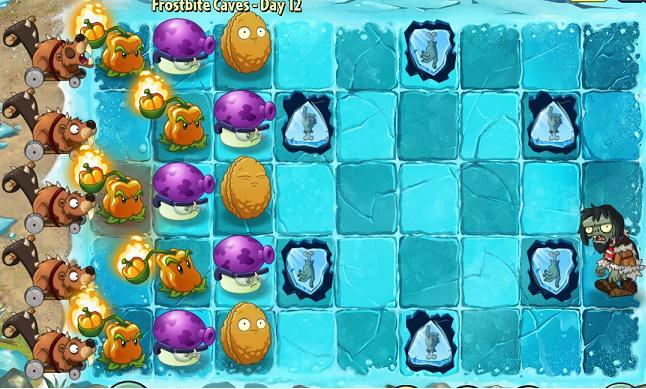 Once you have 5 Fume-shrooms, start planting Bowling Bulbs behind the Potato Mines. Use plant food on anything. 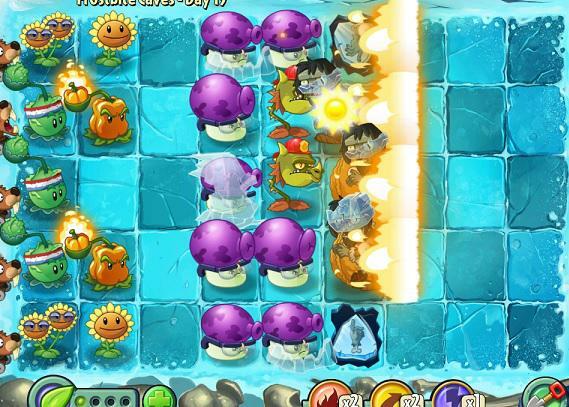 Unless you get extremely lucky with the given plants, you are not going to get past this level without using a "power-up". Plant food is very limited considering the amount of zombies that appear. Use it on Bowling Bulbs when there is no other way. Don't be afraid to use up all your plant food before the last wave. One or Two pieces won't make a difference against the 2 Gargantaurs that appear. Try to use Tangle Kelps on Surfer Zombies. If you're getting too many Lily Pads, you can plant them on the front lines to win some time. Start off with 3-4 Twin Sunflowers. Use Tangle Kelps to stop the first zombies. Start planting Fume-shrooms on the 3rd column. Keep in mind that 1 Fume-shrooms can damage 3 lanes at once. Keep planting Twin Sunflowers until you have 5 total. Start planting Wall-nuts along with the Fume-shrooms, on lanes with Conehead nad Buckethead zombies. Once you have a Fume-shroom on each lane, start putting down Bowling Bulbs on the 2nd column Use plant food on anything. Put Guacodiles as far as possible so they can bite as many zombies as possible. Use Tangle Kelps on Surfer and Snorkel zombies. Use 1 piece of plant food for the first Octo zombie. Then use a Guacodile on top of it, in case it isn't dead. Be as quick as possible. Once the tide lowers, you won't be needing the Lily Pads any more. Use any extra you have to get Snorkel zombies out of the water. When using Guacodiles directly on top of a zombie, wait until the zombie is in the middle of the current tile. This will give the Guacodile more time to deal damage. If you want to save all your mowers, use the last 2 pices of plant food on the Gargantaur, during the last wave. Otherwise, leave the lane empty and use your plant food to save the other crowded lanes. Start off with 5-6 Sun-shrooms. Use Tangle Kelps for the first zombies. Once you have enough sun providers, start putting down Fume-shrooms on the 3rd column. If a tougher zombie appears, plant a Kernel Pult behind. Use Tangle Kelps on Surfer Zombies. Use Guacodiles on Surfer and Snorkel Zombies. Iceberg Lettuces are great on tough zombies. Plant them in front of your Fume-shrooms when you can't afford a Guacodile. Use a plant food on each Octo Zombie that appears. Make sure to kill it as fast as possible. Start off with 2 Twin Sunflowers. Use a Tangle Kelp on the first single zombie that appears. Start planting Fume-shrooms on the 3rd column. Keep planting Twin Sunflowers until you have a total of 4 or 5. Wall-nuts should be placed in front of the Fume-shrooms. Use Tangle Kelps on Surfer and Octo Zombies. If you don't have a Wall-nut on a lane with a Snorkel Zombie, it's best to use a Tangle Kelp before it reaches your plants. Bowling Bulbs should occupy the 2nd column. Once you're full, start removing the Twin Sunflowers and replace them with Kernel Pults. For the last wave, make sure you have a Kernel-pult on the lane where the Gargantaur is. Use a Tangle Kelp when it first appears. Once it gets too close to your plants use a piece of plant food on a Fume-shroom to push the Gargantaur back and use another Tangle Kelp on it. 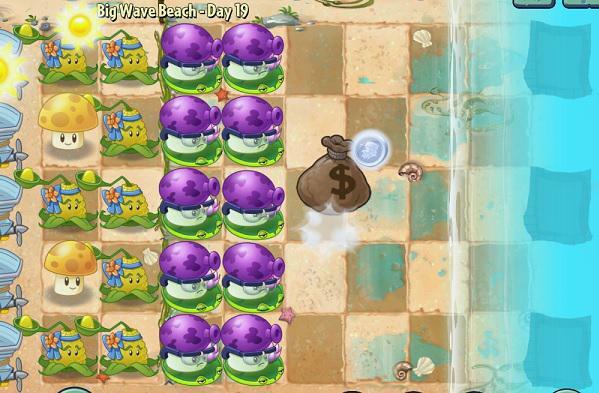 Use plant food for Surfer zombies or Octo zombies. Make sure to save at least 1 piece for the last wave. Plant the Homing Thistles on 1st column. Plant food should be used on the Homing Thistle on the middle lane. 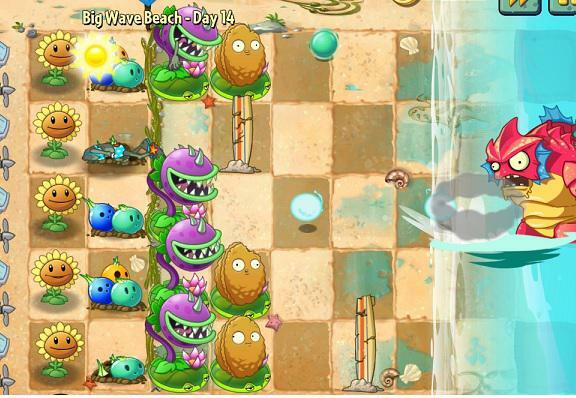 If too many Surfer Zombies get too close, using plant food on an Iceberg Lettuce can be more effective. Don't hesitate to use plant food. 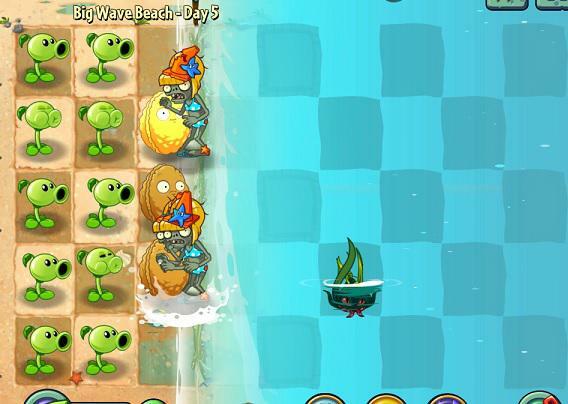 Surfer zombies shouldn't get in range of your plants. Start off with 5 Sun-shrooms (6-7 max). Use Tangle Kelps on the empty lanes. Plant Fume-shrooms on the 4th column. Put Wall-nuts behind them. 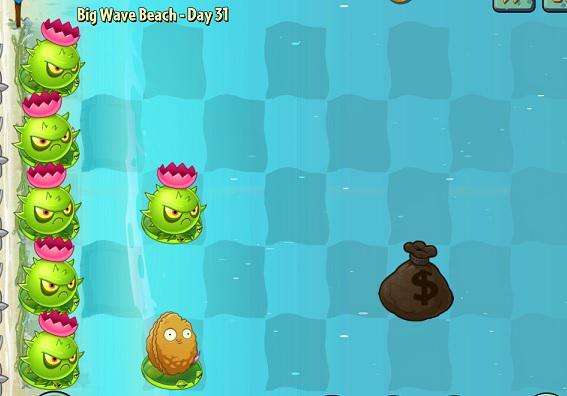 Use Guacodiles and Tangle Kelps to instantly get rid of Surfer zombies. If you don't have a Tangle Kelp, use plant food to get rid of the Fisherman Zombies as quickly as possible. Make sure to save 2 pieces of plant food for the last wave. Use them on Fume-shrooms to instantly get rid of Octo zombies. Start off with 3-4 Twin Sunflowers. Place them behind the endangered Banana Launchers and avoid the top lane. DO NOT kill off the first zombies quickly. This will give you time before the first huge wave. Use the Banana Launchers and Tangle Kelps until you have 4-5 total. Next, start planting Fume-shrooms on the 3rd column. Quickly start putting Wall-nuts in front of them. Pay close attention to the right side of your screen. Any Fisherman zombies are to be taken down immediately. 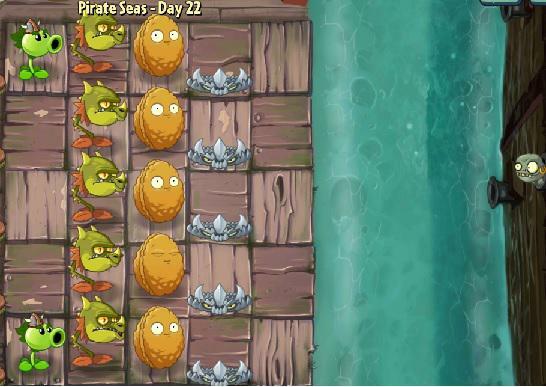 If you don't have enough Tangle Kelps, put Guacodiles in front of the fisherman zombie. Keep in mind that it takes 2 Guacodiles to take them down. Use plant food on Banana Launchers. Use the weaker balls first. 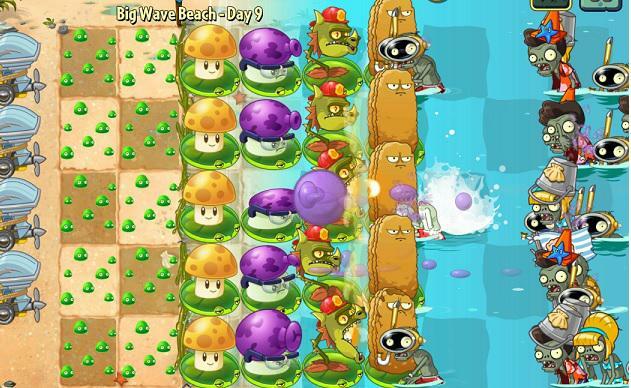 Try to save the electrified balls for multiple Surfer Zombies or huge waves. Start off with 5 Sun-shrooms. Use Tangle Kelp to stop the first Snorkel zombie. Plant it as far away as possible to win some more time. Start planting Fume-shrooms on the 3rd column. Plant Wall-nuts in front of them. 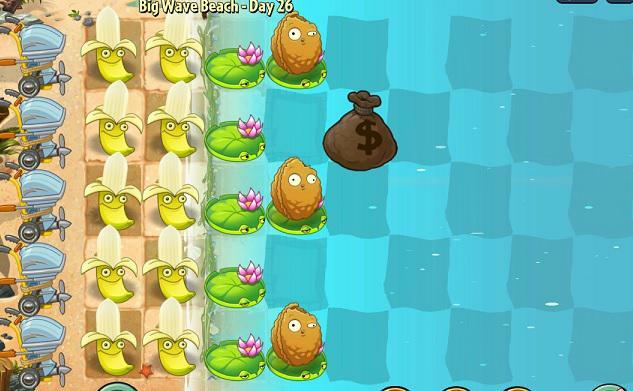 Use Tangle Kelps, Guacodiles and even plant food, to take down Fisherman and Surfer Zombies. Use plant food on Bowling Bulbs, when Gargantaurs approach. If you don't have any plant food left for the last Gargantaur just let the mower kill it. Simply plant all the Banana Launchers on the first 2 columns. Try to hit as many zombies as possible with each shot. Use plant food when there are lots of zombies, spread around. Put a Wall-nut on each lane and let the zombies gather around it. Start off with 2-3 Twin Sunflowers. Use Tangle Kelp to take down the first zombie. Plant it away from the zombie to win some extra time. Start planting Fume-shrooms on the 2nd column. Keep planting Twin Sunflowers until you have 4-5. Whenever a Conehead zombie approaches, either plant a Wall-nut in front of your Fume-shrooms or a Bong Choy. Try to save your Tangle Kelps for Fisherman and Octo zombies. Once you start getting more sun than you can spend, start digging out the Fume-shrooms or Twin Sunflowers and replace them with Banana Launchers. 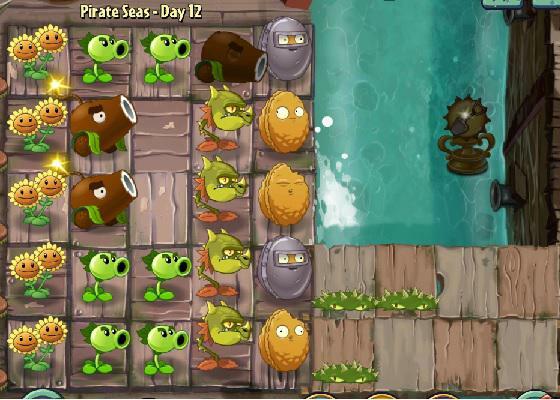 Use plant food on Fisherman zombie, Octo zombie and Surfer zombie when you have no Tangle Kelps or Banana Launchers. Start off with 2 Twin Sunflowers. Plant the first Fume-shroom on the 3rd tile of the lane where the first zombie appears. Keep planting Twin Sunflowers and Fume-shrooms together. Plant 5-7 Twin Sunflowers. Slowly start planting Tall-nuts in front of your Fume Shrooms. You'll need at least 2-3 ready for the first huge wave. 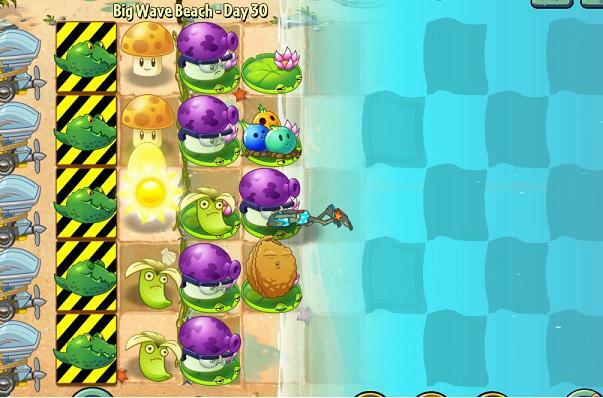 As soon as you have 500 sun, plant a Banana Launcher and use it on Fisherman zombies as quickly as possible. Keep planting Banana Launchers until you have a total of 5. Surfer zombies and Fisherman zombies are your worst enemies. Try and save the Banana Launchers for them. Use Tangle Kelps ONLY when there is no other way (Banana Launcher, plant food). Always check how many more plants you can lose before using it. Use plant food on Fisherman zombie, Octozombie, Surfer zombie and Gargantaur. Basically any zombie which is about to eat a plant. If a Tall-nut gets pulled too far remember to plant a Lily Pad under it. Put your plants in the formation shown below. 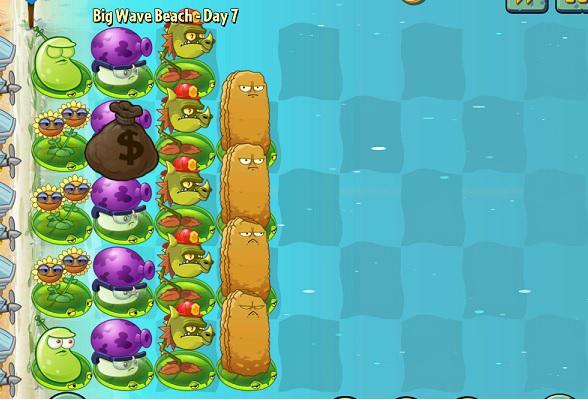 Use Tangle Kelps and plant food on Surfer zombie, Octo zombie, Fisherman zombie. Your goal is to prevent the zombies from getting to any mowers until the last wave. Once the final wave is approaching, let the mowers take all the zombies down. Start off with 4-5 Sun Shrooms. Plant the first Fume-shrooms on the 3rd or 4th column. Use the first piece of plant food on the last Sun-shroom you've planted. Once you have an attacking plant on each lane (Fume-shroom, Bowling Bulb), start planting Wall-nuts wherever a Buckethead zombie appears. Use Tangle Kelps and Guacodiles on Surfer, Fisherman and Octozombies. Finally, start planting Banana Launchers on the empty tiles. If there are none, simply dig out some Sun-shrooms. 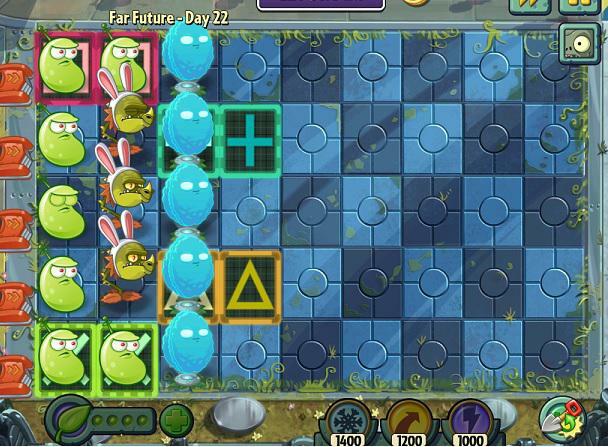 Use plant food on Fume-shrooms and Bowling Bulbs to stop massive groups of tough zombies or a Gargantaur. Try to have as many Banana Launchers as possible to take down Gargantaurs. Use them when there is no other way. Gather 250 sun and plant a Homing Thistle. Don't plant anything before that. Plant Homing Thistles and Lily Pads (if necessary) until a Conehead or Buckethead zombie appears. Once tougher zombies start approaching, start using the Sun Bean on them. Wall-nuts are not essential but they could prove to be quite useful if you find yourself spending a lot of plant food. Use Tangle Kelps on Fisherman zombies and Surfer Zombies which are about to get through. Use plant food when too many zombies are approaching. As with all fights agains Dr. Zomboss, try to plant the stronger plants on the first column. All Guacodiles should be planted on the front lines, to keep the more powerful plants safe. 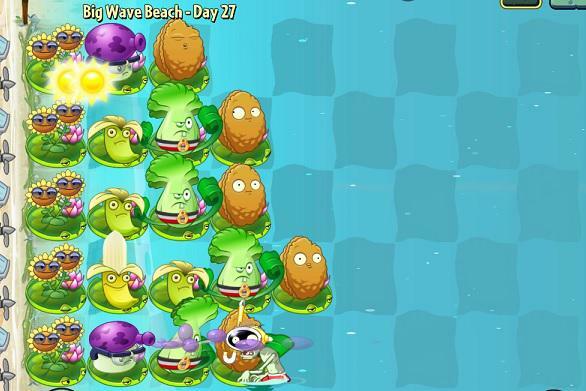 Tangle Kelps should mainly be used on Surfer zombies, as they can eventually prevent you from planting on the 1st column. Use Banana Launchers on tough zombies or groups of multiple zombies. Plant Homing Thistles on the middle lane. This will make using plant food on them much more effective. There's plenty of plant food in this level. Make sure to always have at least 1 in stock for dark times. Start off with 1 Twin Sunflower. Plant a Snapdragon on the middle lane. Behind the frozen Wall-nuts. Plant another Twin Sunflower. Quickly put a Fume-shroom 2 tiles behind each Wall-nut. Keep planting Twin Sunflowers until you have 4-5. Put a Wall-nut or a Tall-nut in the middle lane between the frozen Wall-nuts. Since the zombies are being redirected, you won't be needing Wall-nuts on the top and bottom lanes. Just plant a Snapdragon and a Fume-shroom behind it. Use plant food on anything. Start off with 2-3 Twin Sunflowers. Use the Hot Potato to unfreeze the Repeaters while planting. Put the first 3 Snap Dragons behind the Wall-nuts and then another 2 behind the redirecting tiles. Proceed by planting a Fume-shroom behind each Snapdragon. Pay attention to the plants in the back lines. They will eventually get frozen, so remember to use the Hot Potato. Use plant food on anything. 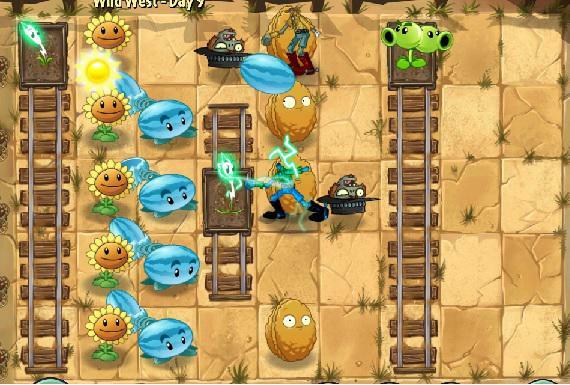 Plant the first Peashooters and Repeaters on the middle and 2nd bottom lane. 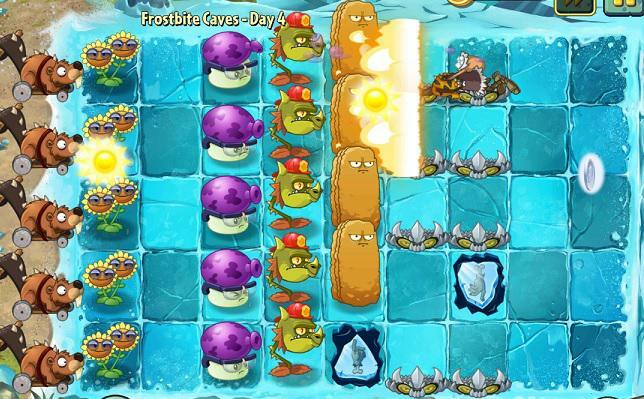 On the top lane, plant a repeater on the first tile and fill up the rest of the tiles, up to the frozen zombies, with Spikeweed. Plant Peashooters and Repeaters on the bottom lane lastly. If the Repeater/Peashooter on the top lane gets eaten, use a Hurrikale and plant a new one. 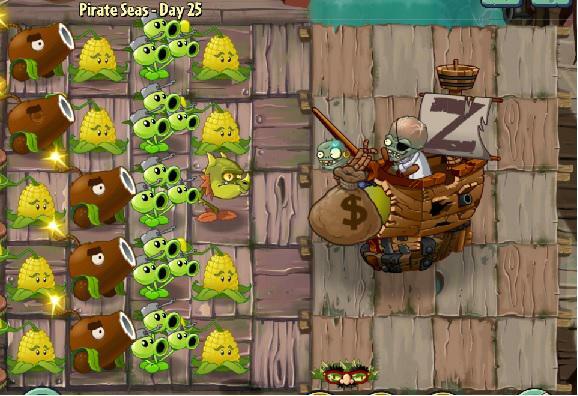 Use plant food on Repeaters for 1-2 Buckethead zombies and on Spikeweed for massive numbers of zombies. Start off with 1 Twin Sunflower. Plant 2 Snapdragons on the 4th column. Make sure they cover all five lanes. Keep planting Twin Sunflowers until you have 4-5. Plant the first Tall-nut or Wall-nut on the lane where the first Conehead zombie approaches. Keep planting Snapdragons and Tall-nuts until you have 5 of each. Put Fume-shrooms behind the Snapdragons. Finally, you can either put some Spikerocks in front of your Tall-nuts or some heavy damage plant, behind the Fume-shrooms. Use plant food on anything. Put the 1st Pepper-pult behind the middle Bong Choy. Plant the first Bong Choys behind the tiles that redirect the zombies. Unfreeze the Cabbage-pults using Pepper Pults as fast as possible. Pay attention however, to which lanes need most support. Try to have a Pepper-pult on each lane and as far back as possible. When zombies get close to your plants, put a Bong Choy behind to try and take them down. Keep in mind that the Bong Choy will prioritize zombies in front of itself. It's a very messy level, so don't worry if you lose a mower. Use plant food on Pepper-pults when you are absolutely sure that zombies are going to break through. Take the Snapdragon and the Cherry Bomb. Start off with 2-3 Sunflowers. Use the Hot Potato as soon as possible. Plant a Snapdragon in the middle of the 4th column. Plant another 2-3 Sunflowers (5 max). Plant another 2 Snapdragons on the 4th column. Start planting Tall-nuts and Pepper-pults. The first Pepper-pults should be planting on the 2nd column. 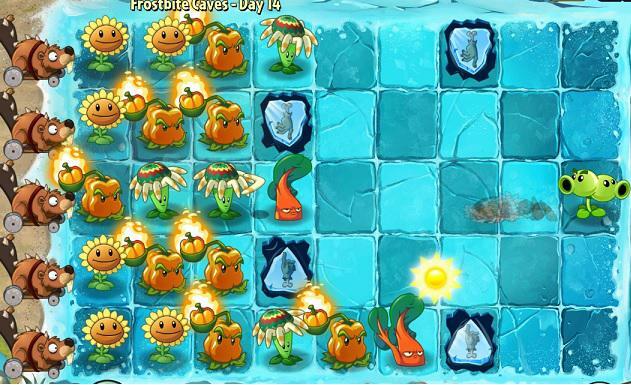 Make sure that they keep all 5 Sunflowers from freezing. Whenever the Pepper-pult is on cooldown, plant as much Spikeweed as you can. The next two Pepper-pults should be put behind the Snapdragons to keep them from freezing. Alternetevly, you can replace the middle Snapdragon with a Pepper-pult. This will make freezing your Tall-nuts much harder. 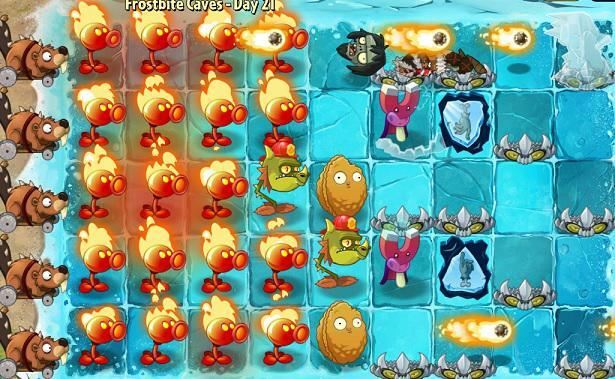 If the Tall-nuts are frozen and tough zombies are about to pass, just use a Cherry Bomb or plant food on a Snapdragon. Start off with 2 Twin Sunflowers. Use the Hot Potato on the Split Pea. Plant another Twin Sunflower and start putting Wall-nuts on the 5th column as soon as they're off cooldown. Plant on the 3 middle tiles. Keep planting Twin Sunflowers until you have a total of 5. Once you have 2 Wall-nuts start putting down Fume-shrooms on the 4th column. The first Pepper pult should be planted behind the middle Fume-shroom. The next to should keep all 5 Twin Sunflowers warm. Additional Fume-shrooms can be planted next to the Wall-nuts. Whenever the Pepper-pult is on cooldown, plant Stonespike on the front lines. Make sure to leave the tile in front of the middle Wall-nut empty as you might want to use a Cherry Bomb. Pay attention to your Wall-nuts. Whenver they get frozen, use a Hot Potato as soon as possible. If zombies are about to get through your Wall-nuts, use a Cherry bomb. Use plant food on anything. Plant Bong Choys on the 3rd column. You can plant additional Bong Choys on the 5th tile of the top and bottom lanes. Make sure to put a Wall-nut in front if you do. Make sure you have a Pepper-pult on each lane. The 3 middle lanes should be a priority. If zombies get past your Wall-nuts, just use a Hurrikale and plant a new Bong Choy. Use plant food on anything but Wall-nuts. Start off with 1 Twin Sunflower. Plant a Wall-nut on the 5th column to stop the first two zombies. Plant a Snapdragon behind it. Plant another Twin Sunflower, followed by another Wall-nut and a snapdragon. Make sure that the 2 Snapdragons cover all 5 lanes. As soon as you see the first Dodo Rider zombie appear, plant a Fume-shroom on its lane, behind the Snapdragons. Keep planting Twin Sunflowers until you have a total of 5. Once you have at least 3 Snapdragons start planting Pepper-pults on empty lanes. Use plant food on anything. 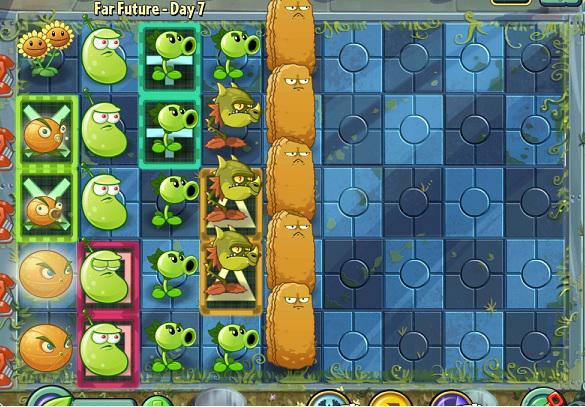 Plant Peashooters on the first 3 columns. Chard Guards should be planted on the 4th column. The bottom 3 lanes are a priority since the zombies get redirected from the other two. Use plant food on anything. Start off with 2-3 Sun-shrooms. Plant the first Fume-shroom on the 3rd tile of the lane where the first zombie appears. Plant another 2 Sun-shrooms (5 max). Keep planting Fume-shrooms on the 3rd column. Prioritize the bottom 3 lanes. 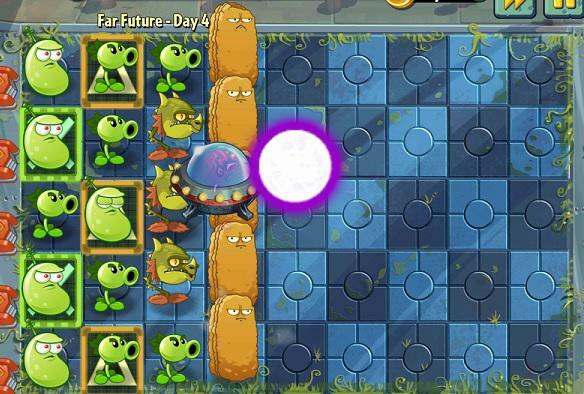 Once you plant a Fume-shroom or a Pepper-pult on the top two lanes, make sure to plant a Chard Guard on the 4th tile as soon as you unfreeze the zombies. Chard Guards should be planted in front of your Fume-shrooms. Remember to replace them when they run out of leaves. Pay attention to the Chard Guards. If they get frozen use a Hot Potato as soon as possible. Plant a Pepper-pult behind the Fume-shrooms on each lane. Once you're full on plants, you can start removing the Sun-shrooms and replace them with more Pepper-pults. 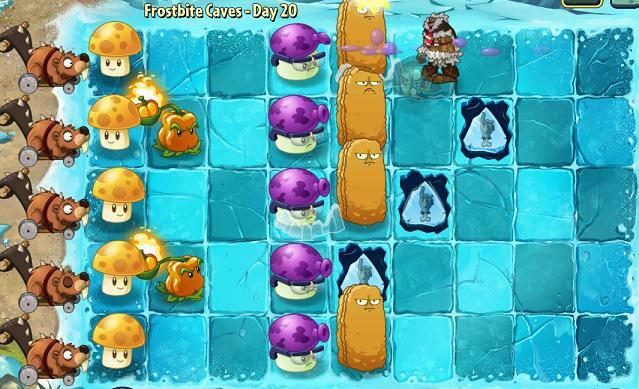 Use plant food on Fume-shrooms when zombies get past a frozen Chard Guard. Plant a Wall-nut on 3rd column, on each lane without a redirecting tile. Put Fume-shrooms behind the Wall-nuts and redirecting tiles. Plant a Pepper-pult behind each Fume-shroom. Make sure to use the Hot Potato on frozen Wall-nuts. Use plant food on anything. Start off with 3 Sun-shrooms. 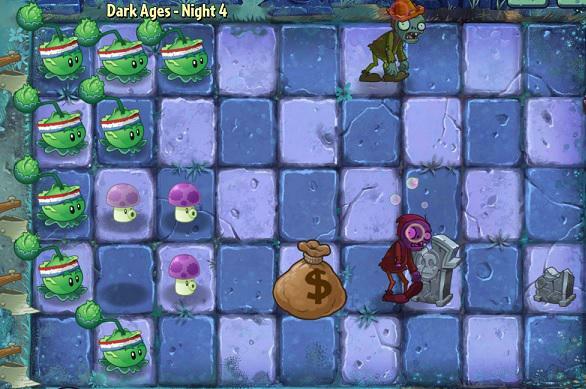 Plant the first Fume-shroom on the 4th tile of the lane where the first zombie is. Start planting Tall-nuts on the 5th column. Plant another another 2 Sun-shrooms (5-6 max). Put the first Pepper-pult behind the middle Tall-nut. The rest of the 3rd and 4th column should be covered with Fume-shrooms. 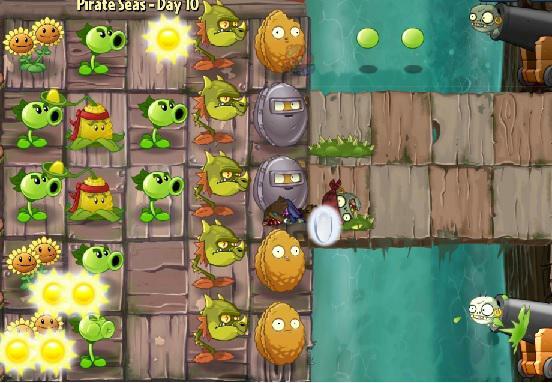 Another 2 Pepper-pults should be planted on the 2nd column in order to keep the Sun-shrooms warm. Plant a couple of Banana Launchers with the rest of your sun. Use them on the Gargantaur. Use plant food on anything. Save 1 piece for the last wave, when the Gargantaur throws imps behind your Tall-nuts. Start by planting a Pepper-pult on the 2nd column. Make sure it keeps all 4 Sunflowers warm. Use the second Hot Potato on the frozen Split Pea. Plant the second Pepper-pult on the other side of the 2nd column to unfreeze the rest of the Sunflowers. Put a Bloomerang in front of the Sunflowers on the top and bottom lane. Plant a Chard Guard in front of each one. The middle lane should be occupied by 2 Bloomerangs and 1 Pepper-pult. The 3rd Chard Guard should go on the middle lane, between the redirecting tiles. Fill up the rest of the empty tiles with Pepper-pults. Eventually, you can remove a Sunflowers and replace them with Pepper-pults. Use plant food on anything. Start off with 3 Sun-shrooms. Plant the first Fume-shroom behind the redirecting tile, on the lane where the first zombie appears. 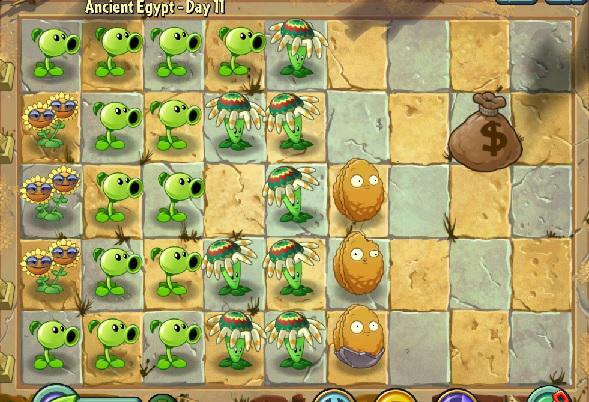 Plant another 2 Sun-shrooms (max 5) Put a Tall-nut in front of each endangered Pepper-pult. The first 2 Pepper-pults should be planted on the 2nd column. Make sure they keep all the Sun-shrooms Warm. Plant a Fume-shrooms behind each redirecting tile/endangered plant. Fill up the rest of the empty tiles with enough Pepper-pults to keep all the plants from freezing. Once you're full, you can start replacing the Sun-shrooms with more Pepper-pults or other attacking plants. Use plant food on anything. Make sure that you have at least 1 Pepper-pult to keep each plant warm. Plant Chard Guards next to the middle redirecting tile on the 4th column. Put another one next to the redirecting plate on the top lane. The third Chard Guard should be planted on the bottom lane, 4th or 5th column. 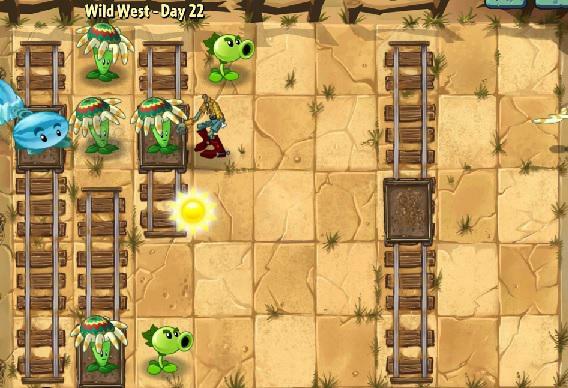 Plant the Spikeweed on tiles where zombie are more likely to walk on. Use plant food on Repeaters to take down Gargantaurs. Start off with 5 Sun-shrooms. Use the Hot Potato as soon as possible, to unfreeze the Fume-shrooms. Plant the first two Pepper-pults on the top and bottom lane. Fill up the 4th column with Fume-shrooms. Plant a Pepper-pult on each lane. 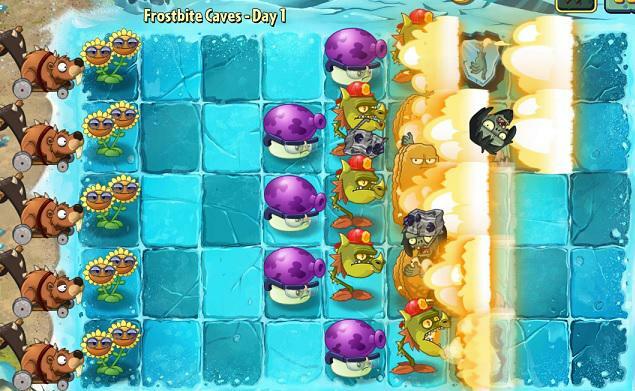 Use plant food on Fume-shrooms to take down Troglobite zombies (the ones that push frozen blocks). Plant the first Bloomerangs on the 2nd and 3rd tile. Put 2 on lanes where anything different than a Cave zombie appears (regular zombies). Plant Citrons on the first column. Prioritize the lanes where zombies get redirected to. Use Stunion as soon as you see a tough zombie get too close to your zombies. If zombies are about to get redirected to a lane that's already crowded, use the Stunion to win some time. Use plant food on Citrons ONLY when you don't have any other choice. Start off with 1 Sunflower. Plant on the top, bottom or middle lane. Next, plant a Snapdragon on the middle tile behind the Wall-nuts. Use the Hot Potato on a Twin Sunflower as soon as possible. Once you've planted the Snapdragon, put a Fume-shroom on the lane where the first Dodo Rider appears. Plant it behind the redirecting tile and put a Stunion in front to slow down the bird. Do the same for the Dodo Rider on the top lane. 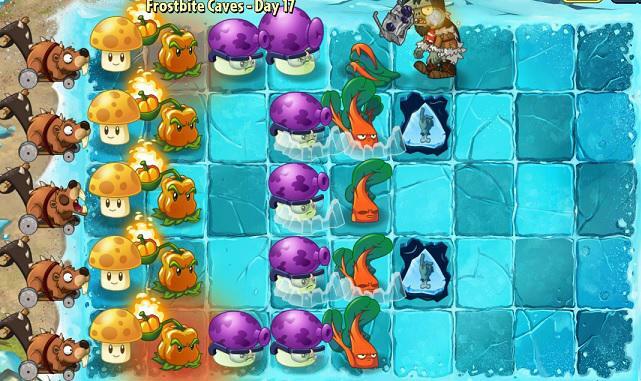 Once you've unfrozen one of the Twin Sunflowers, use the next couple of Hot Potatos on the Wall-nuts to prevent tougher zombies from passing. Plant another 2 Sunflowers. When you see a Troglobite zombie approach, plant a Fume-shroom on the lane and use plant food on it. Be quick to avoid getting your plants destroyed. Place 2 Pepper-pults on the remaining tiles of the 2nd column. 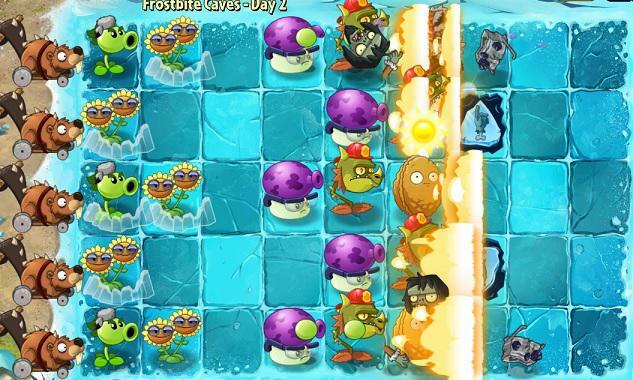 Use plant food on Fume-shrooms to take down Troglobite zombies. Start off with 2-3 Sun-shrooms. Plant the first 2 Fume-shrooms on the 4th or 5th column. Plant another 2 Sun-shrooms. 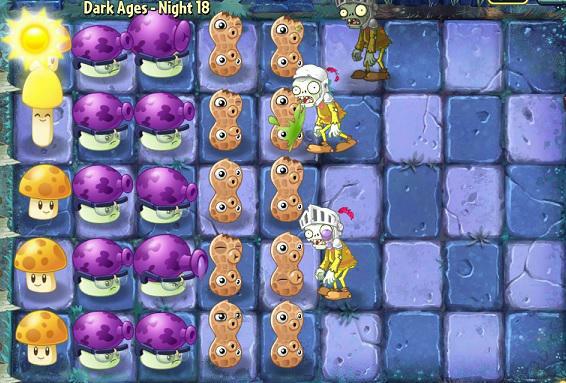 Start planint Tall-nuts in front of the Fume-shrooms as soon as tougher zombies start approaching. Plant 2 Pepper-pults on the 2nd column. Make sure they keep all Sun-shrooms warm. Use Stunion on Dodo Riders. 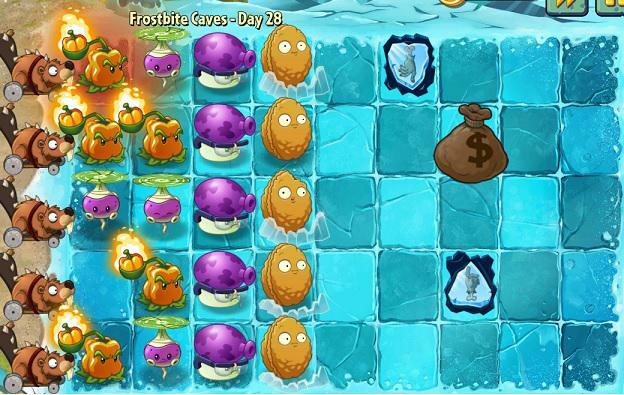 Use plant food on Fume-shrooms to take down Troglobite zombies. The majority of your plants should be planted on the top, bottom and middle lanes. The middle lanes will require the most Fire Peashooters. Plant the any Snapdragons between the Wall-nuts. Magent-shrooms should be put behind or in front of the Snapdragons. Use plant food on anything. Start off with 3 Sun-shrooms. Plant the first Fume-shroom on the 3rd or 4th tile of the lane where the first zombie appears. Plant another 1-2 Sun-shrooms (max 5). Plant Wall-nuts on the top 3 lanes, in front of the Fume-shrooms. When a Weasel Hoarder approaches, make sure you have a Fume-shroom on the 3 lanes around it. This will prevent any weasels from quickly eating your plants. At least 2 Pepper-puls should be planted on the second column to keep all Sun-shrooms warm. Use plant food on anything. Start off with 2-3 Sun-shrooms. As soon as the Hot Potato is off cooldown, use it on one of the Twin Sunflowers. Unfreeze them as fast as possible, since they will eventually get eaten. Plant Fume-shroom on the 4th column. The first Tall-nuts should be planted to stop Dodo Riders or any other tough zombies. Use the Stunion to slow down zombies on lanes where you don't have Tall-nuts. Fill up the 3rd column with Pepper-pults. 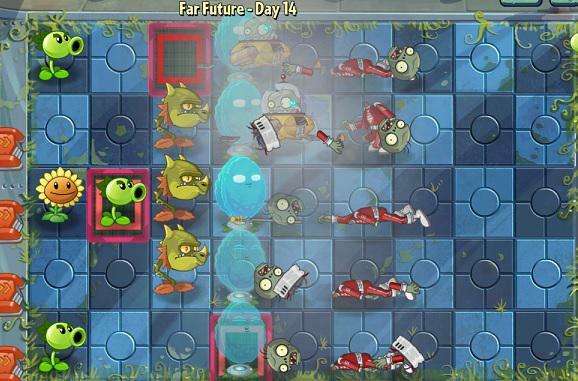 Use plant food on Fume-shrooms to quickly take down Troglobite zombies. Start off with 1 Twin Sunflower. Wait until the first breeze passes. Plant a Snapdragon on the 4th tile of the middle lane to take down the first couple of zombies. Make sure to use a Hot Potato on it as soon as it gets frozen. Plant another Twin Sunflower. Put a Wall-nut on the 5th tile of the bottom lane to stop the approaching zombie and plant another Snapdragon next to the redirecting tile. Plant another Twin Sunflower (5 max). Put the first Pepper-pult on the 2nd column of an empty lane that needs more protection. Make sure it keeps as many Twin Sunflowers warm as possible. Use Stunions to slow down zombies you aren't prepared for. Pay close attention to which plants are about to get frozen and always use the Hot Potato as soon as it's off cooldown. 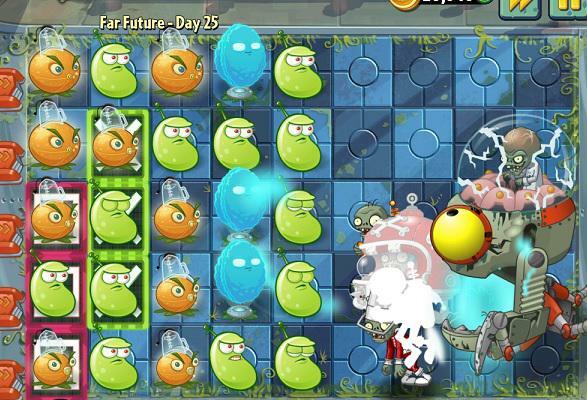 Use plant food on Fume-shrooms to take down Troglobite zombies and on Twin Sunflowers in order to complete the 2500 sun objective. Plant Rotobagas on the first 3 columns. Once you get a Pepper-pult, put on the 2nd column. Make sure that the first 2 Pepper-pults keep all 3 columns warm. Any additional Rotobagas should be planted on the 2nd top/bottom lane. Use Stunions only when zombies get to your plants. Use plant food on anything. Start off with 2-3 Sun-shrooms. Plant 2 Rotobags on the 4th and 5th column of the middle lane. Plant a Wall-nut on the 4th column of the bottom lane. Put a Fume-shroom behind it. Plant another 2 Rotobags on the middle lane. Plant a Fume-shroom on the 3rd column of each of the remaining empty lanes. The first 2 Pepper-pults should keep all of the Sun-shrooms warm. A Wall-nut should be placed next to the redirecting tile on the top lane. This will prevent the zombies from reaching the Rotobags. 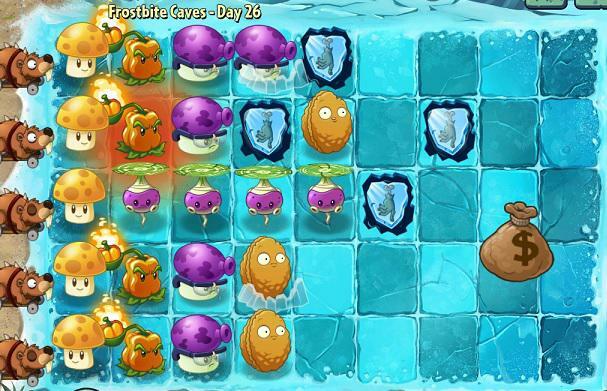 If a Wall-nut gets frozen, it should be the first plant you use your Hot Potato on. Use plant food on anything. Start off with 5 Sun-shrooms. Plant a Rotobog between the endangered plants. Start planting Fume-shrooms in front of the endangered Rotobogs. The first 2 Pepper-pults should keep the 3 columns warm. Plant 3 Wall-nuts on the 5th column. Plant a Fume-shroom on the top and bottom lanes. The rest of the empty tiles can be used for any high damage attacking plants. Use Stunion on any zombies that get too close to your plants. Use plant food on anything and save 1-2 pieces for the Gargantaur during the last wave. Plant 5 Wall-nuts on the 4th column. Put 5 Fume-shrooms on the 3rd column. 2 Rotobogs should be put on the middle lane and one on the top and bottom lane. Plant a Pepper-pult on each lane. Put 2 on the 2nd top lane. Save 4 pieces of plant food for the Gargantaurs at the end. Use 2 pieces of plant food on a Fume-shroom for each Gargantaur. The first one, when the Gargantaur gets to your Wall-nut and the second one, when it starts throwing Imps behind your Wall-nuts. Start off with 3 Sunflowers. 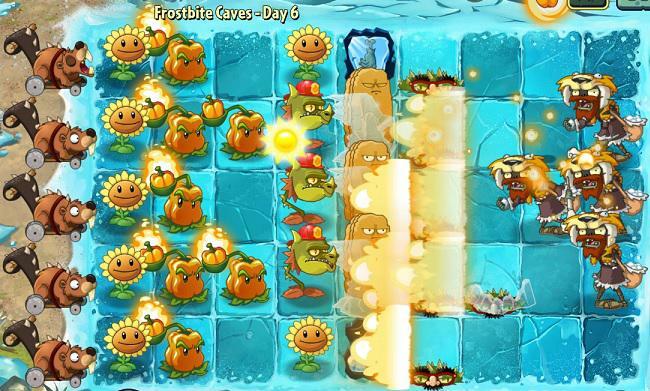 Plant the first Fire Peashooter next to a frozen Sunflower. Use Stunions for any zombie that you can't take down yet. Put 2 Rotobogas behind the redirecting tiles on the second top and bottom lanes. Fill up the rest of the empty tiles with Fire Peashooters. Use plant food on anything. Plant a Chard Guard on each lane. Put Rotobogs on the front lines. Threepeeters should go on the 1st or 2nd column. 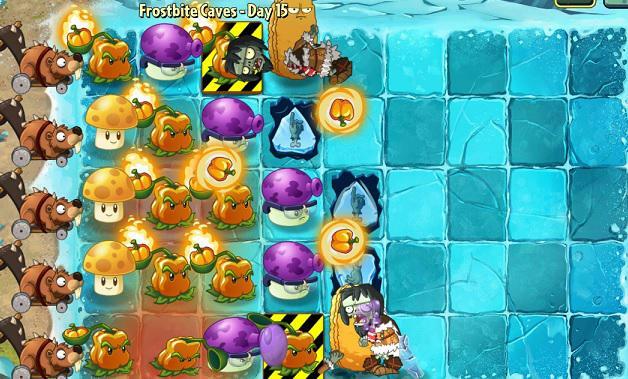 Hot Potatos can be used on the ice protecting Dr. Zomboss. Use plant food on anything. Copyright © 2015 Jayisgames. All Rights Reserved. Do Not Copy. 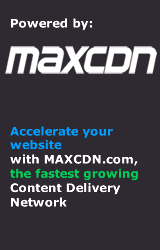 Protected by Copyscape.